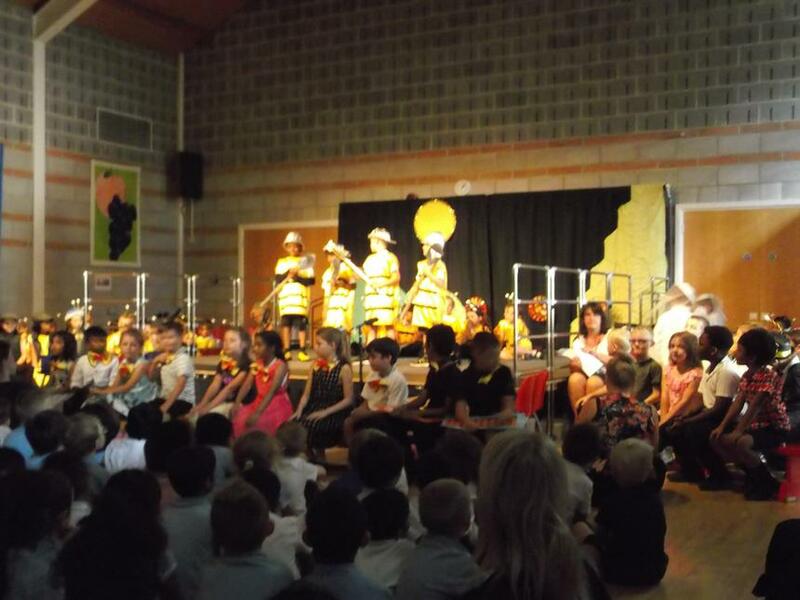 The lucky winners being presented with their prizes in assembly by two of our FRIENDS committee members; it was a very difficult decision! 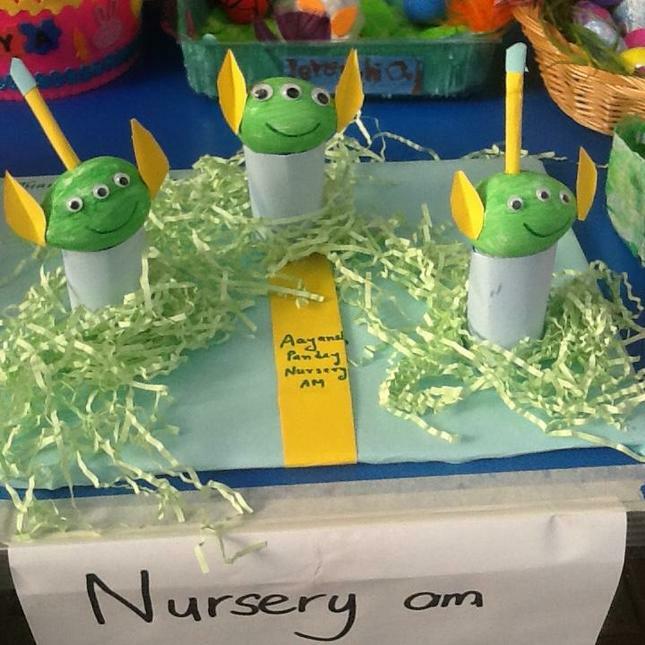 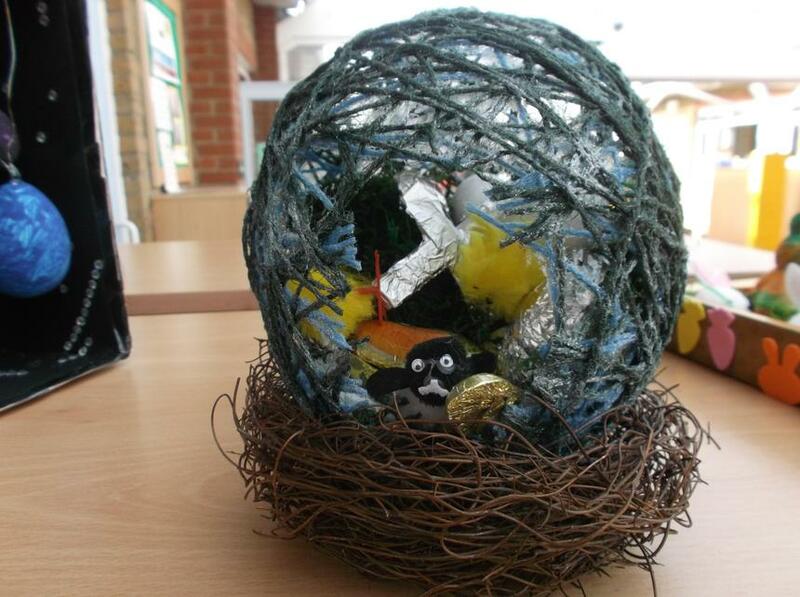 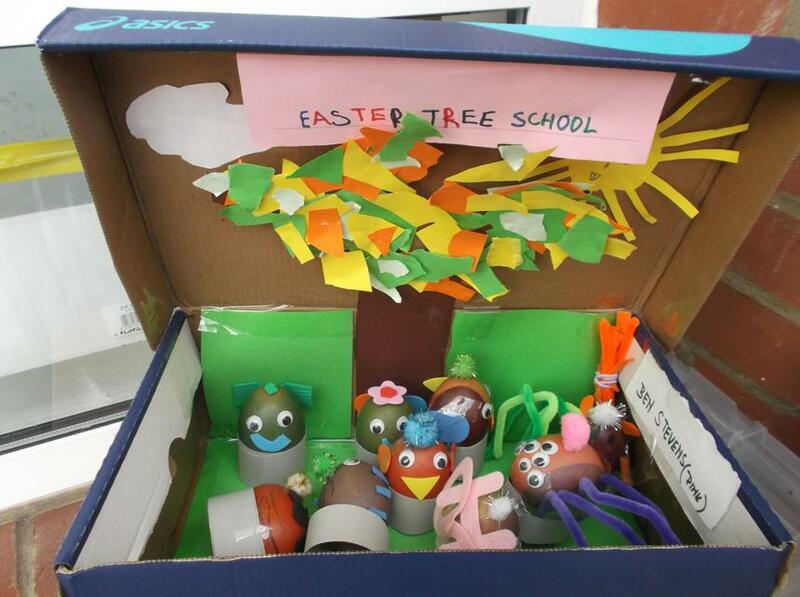 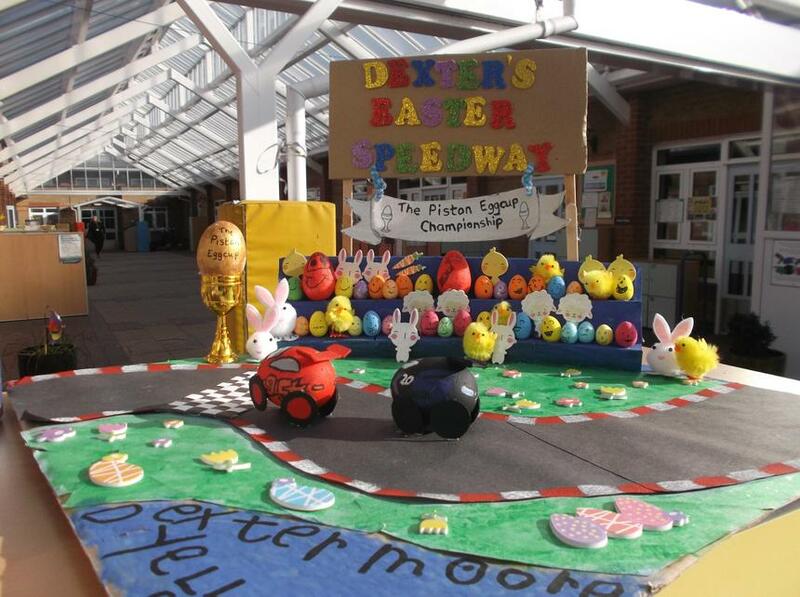 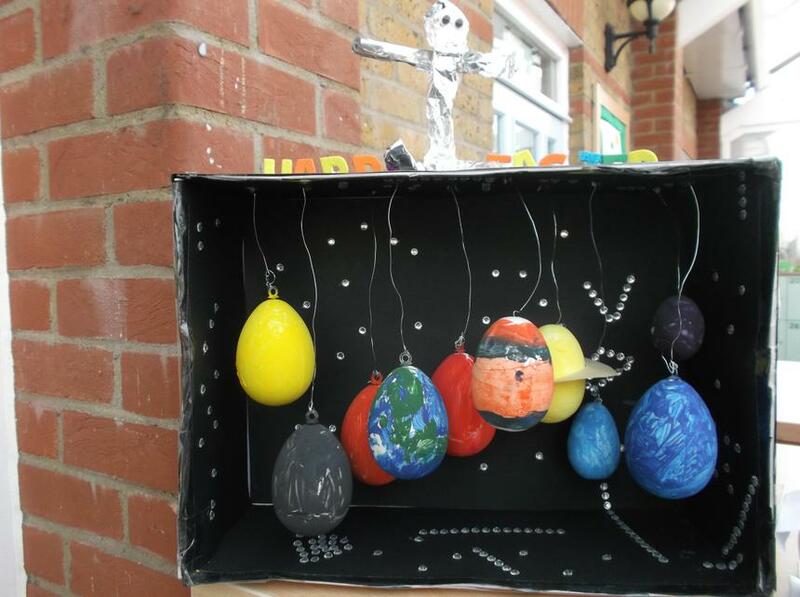 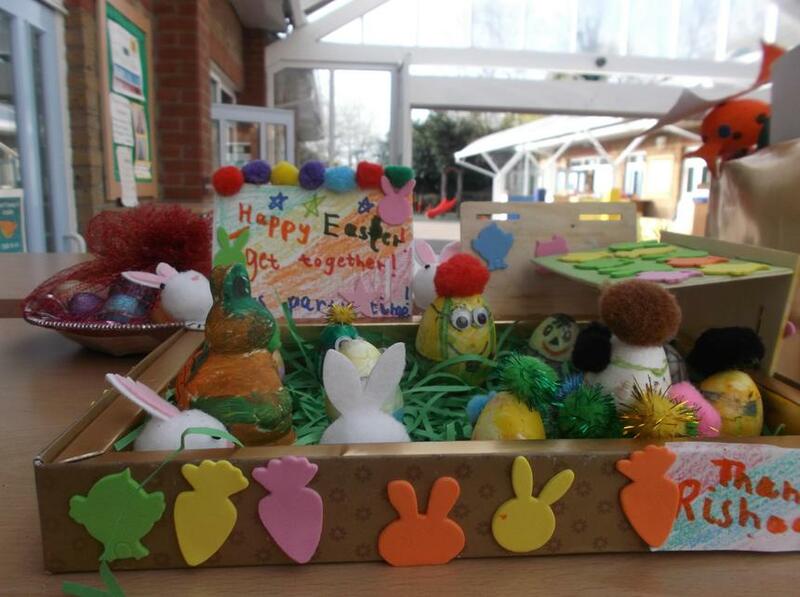 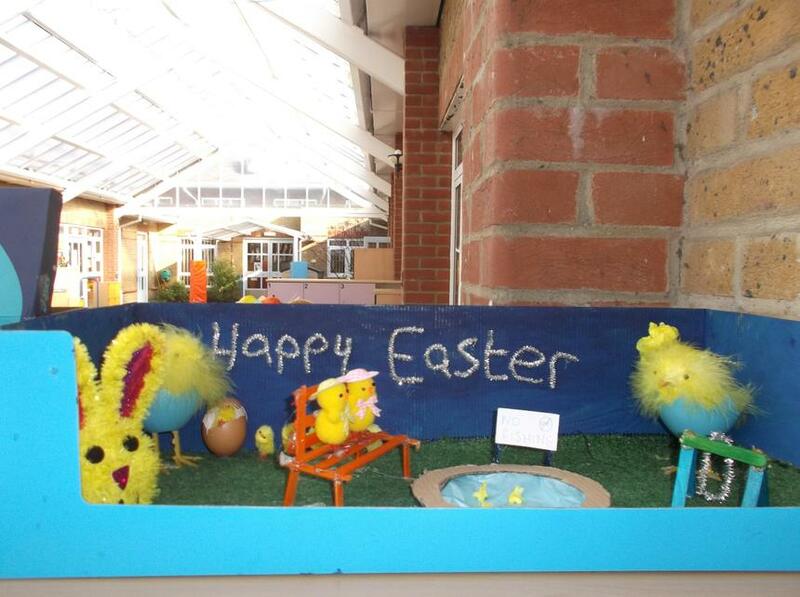 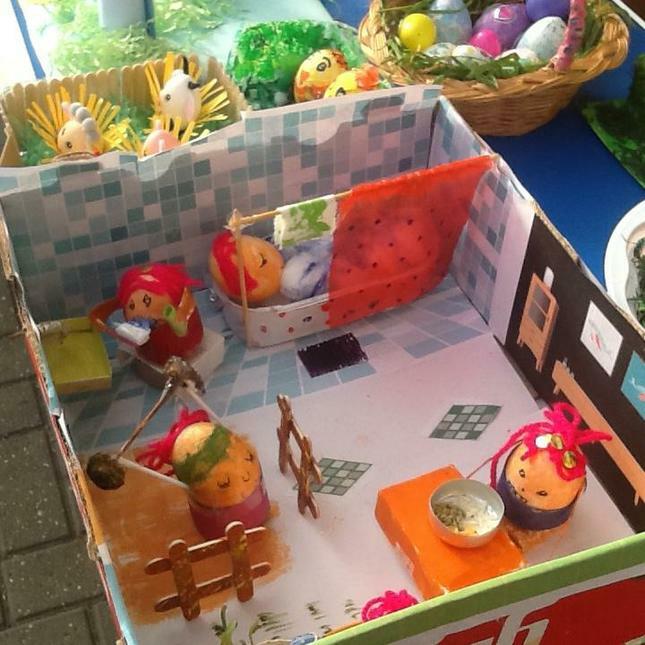 Look at our wonderful Easter Egg competition entries for our FRIENDS competition; well done Cardinal Road families for putting your creative skills into action. 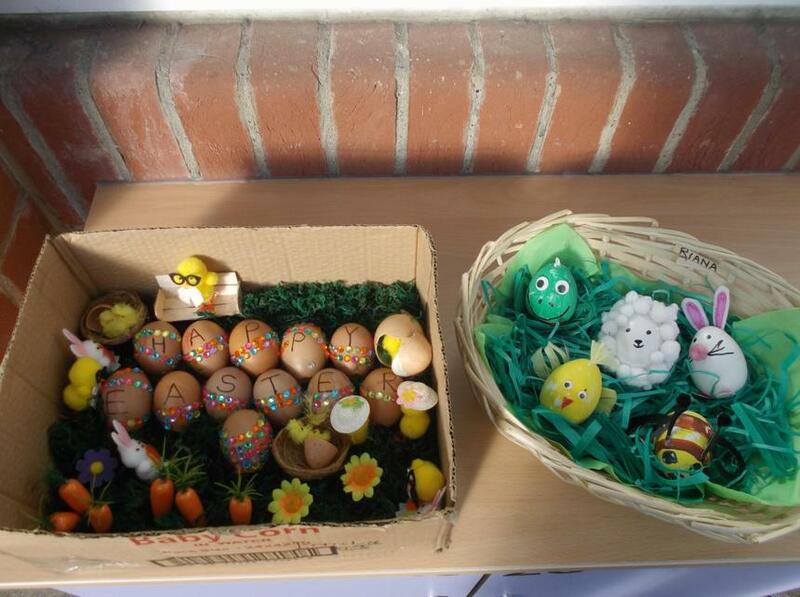 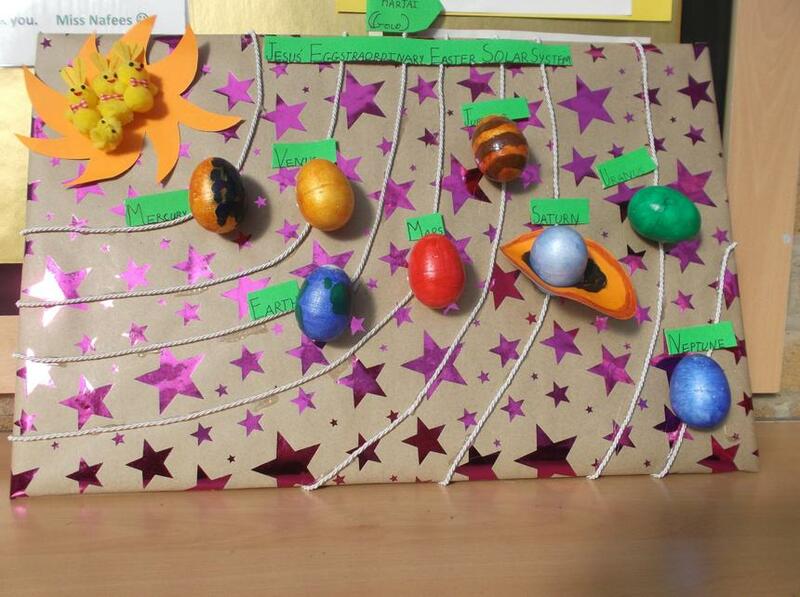 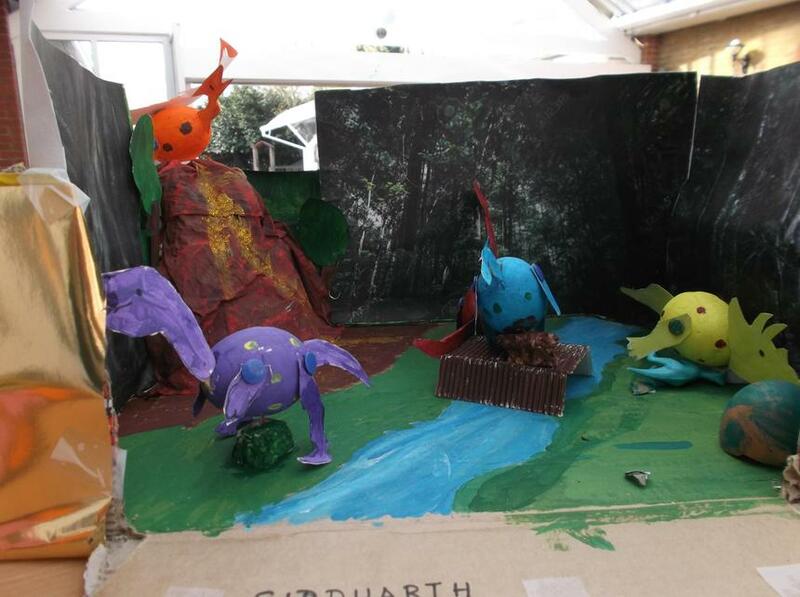 Below are a few examples, please see year group pages for all entries. 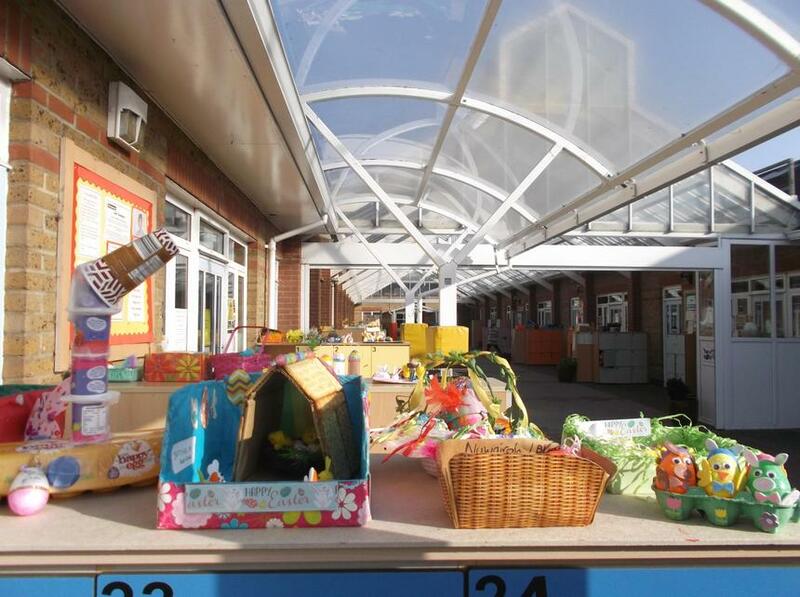 Winners to be announced at the end of the week, but congratulations to everyone who took part, the school is full of colour and smiles this morning! 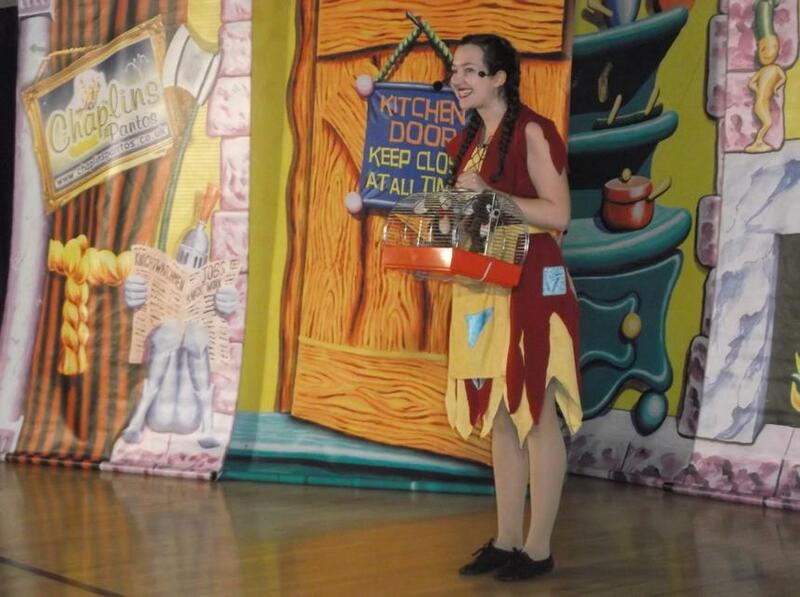 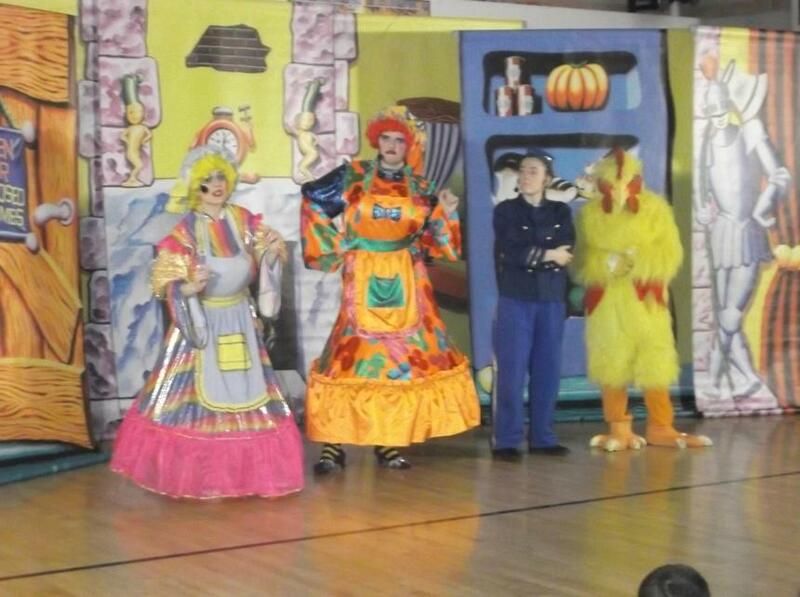 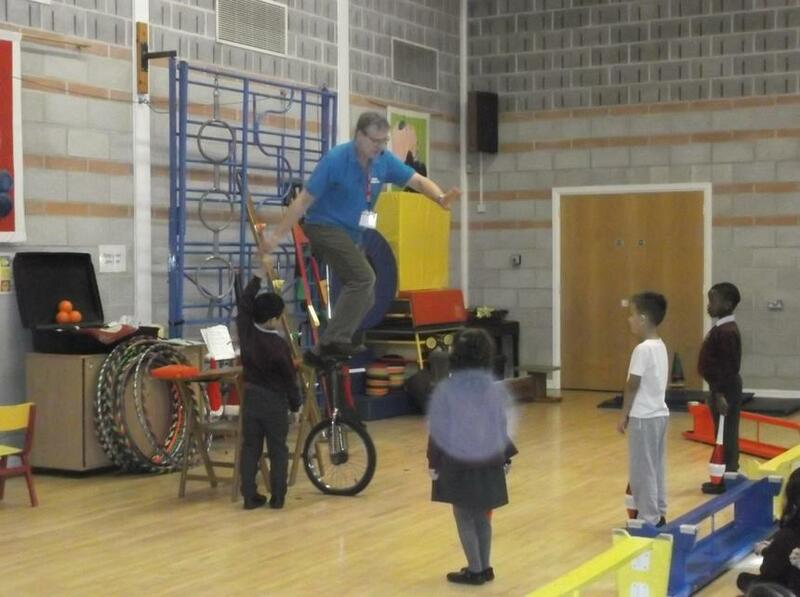 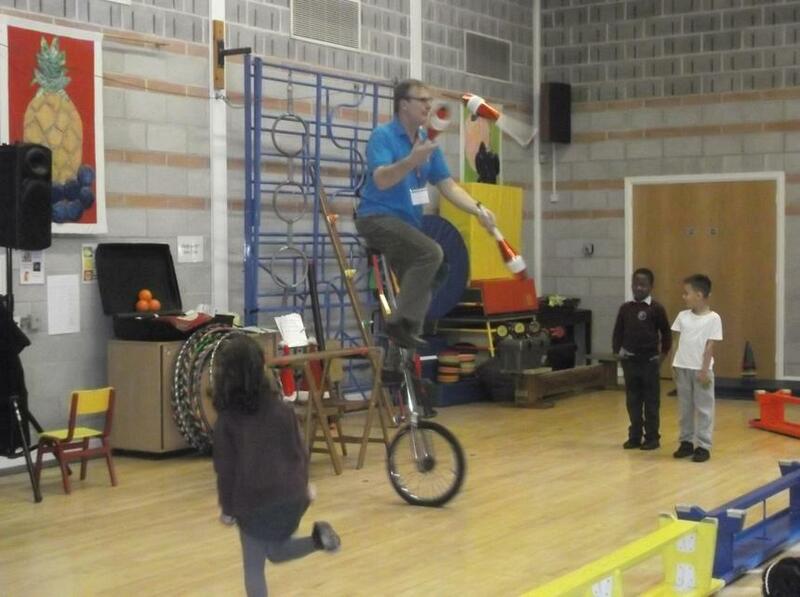 On Monday March 18th and Tuesday March 19th the circus came to Cardinal Road! 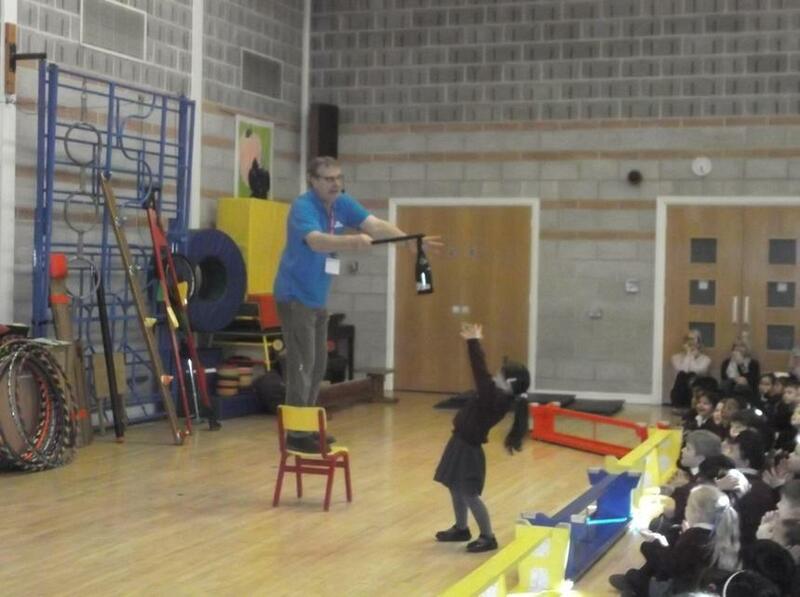 All the children from Reception to Year 2, as well as the Speech and Language Workshop, were treated to a spectacular interactive performance, followed by class workshops where they learnt a vast range of different skills. 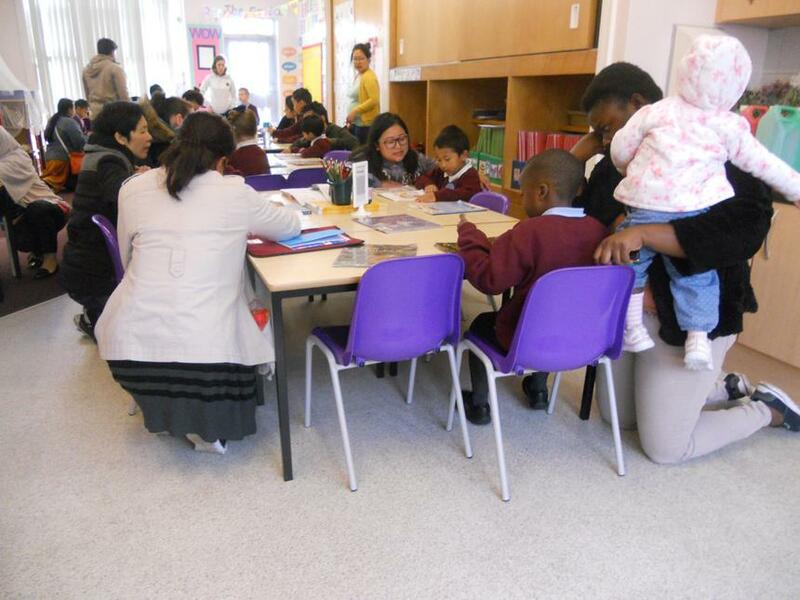 On Tuesday morning the Year 2 children performed their newly learnt skills to a very appreciative audience of parents and carers. 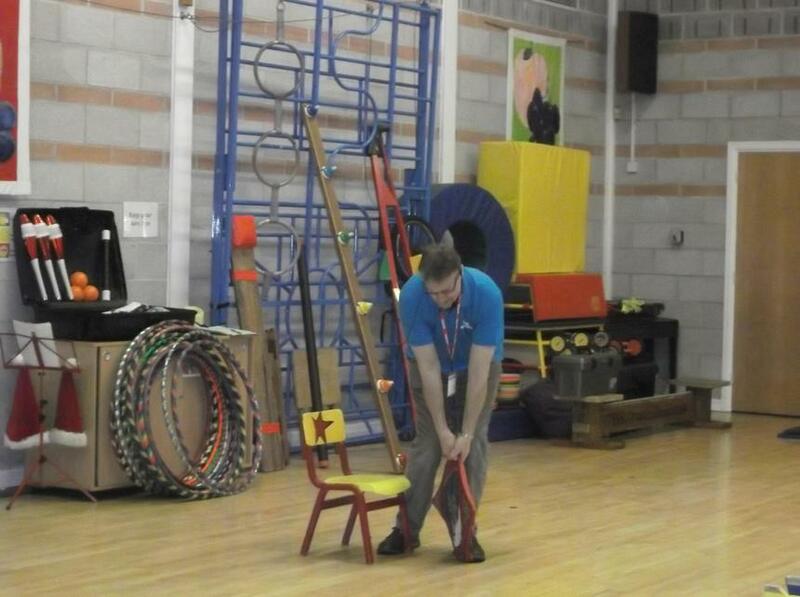 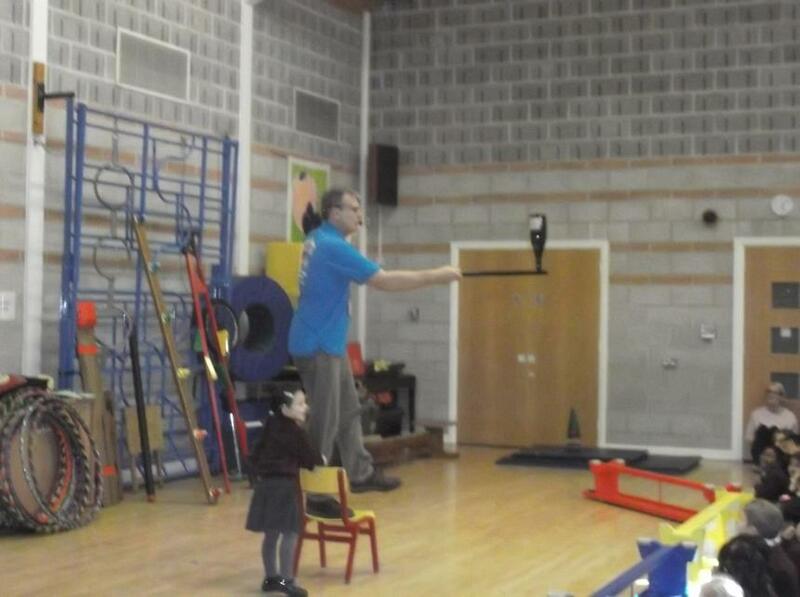 These circus tricks really built on the "core skills" unit that Year 1 and 2 have been following in PE, and the children will now take these skills further using the exciting new equipment in school and also applying them to out of school sports and activities. 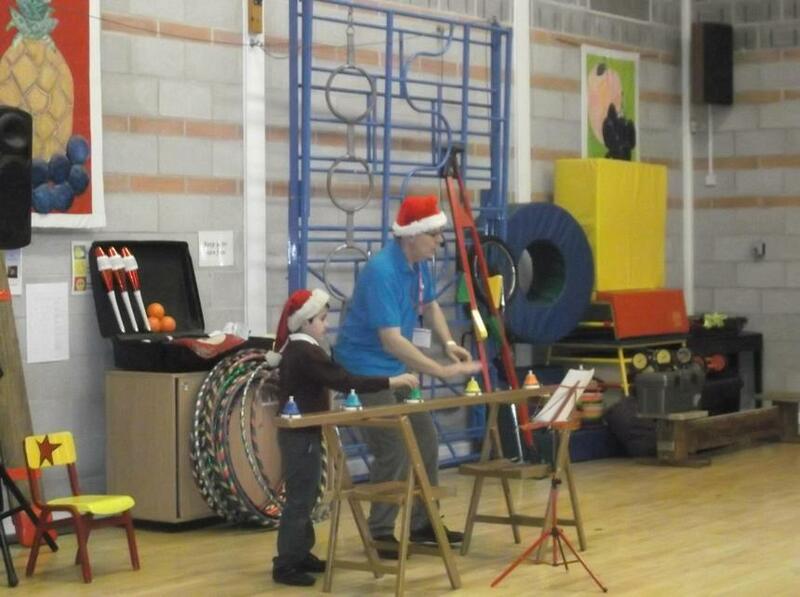 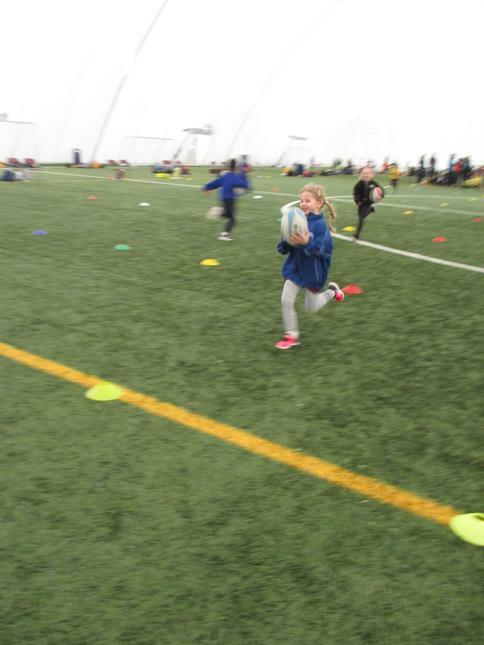 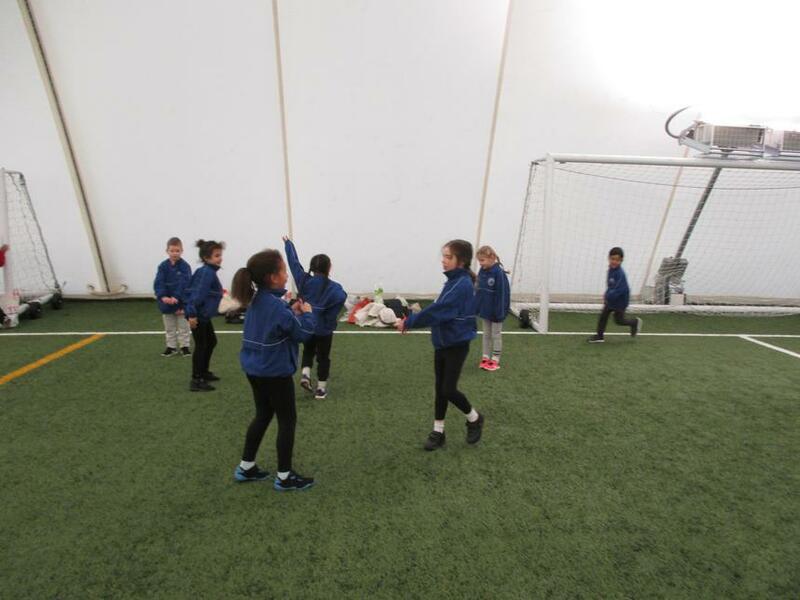 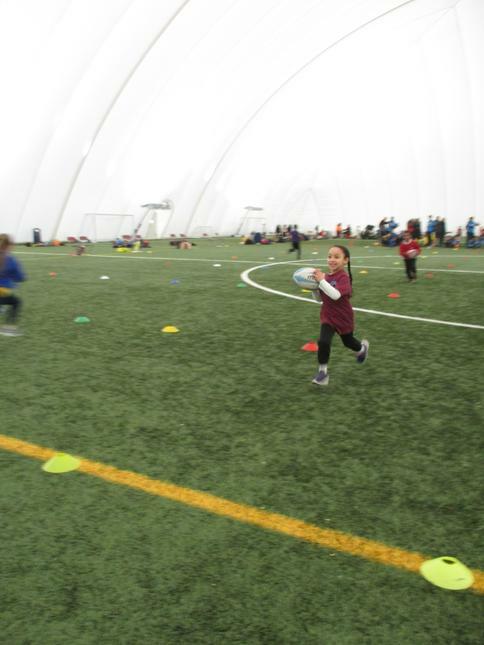 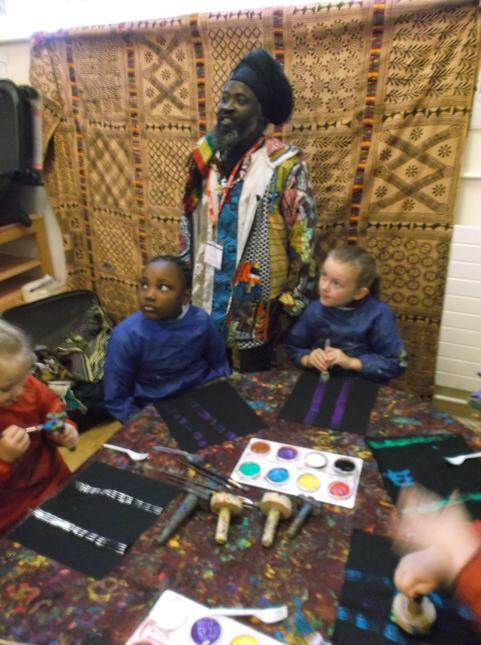 The workshops provided all children with the opportunity to engage in a real life experience, share their hard work with the school community and develop their emotional literacy relating to keeping trying, resilience and performing in front of an audience: all fantastic life long skills. 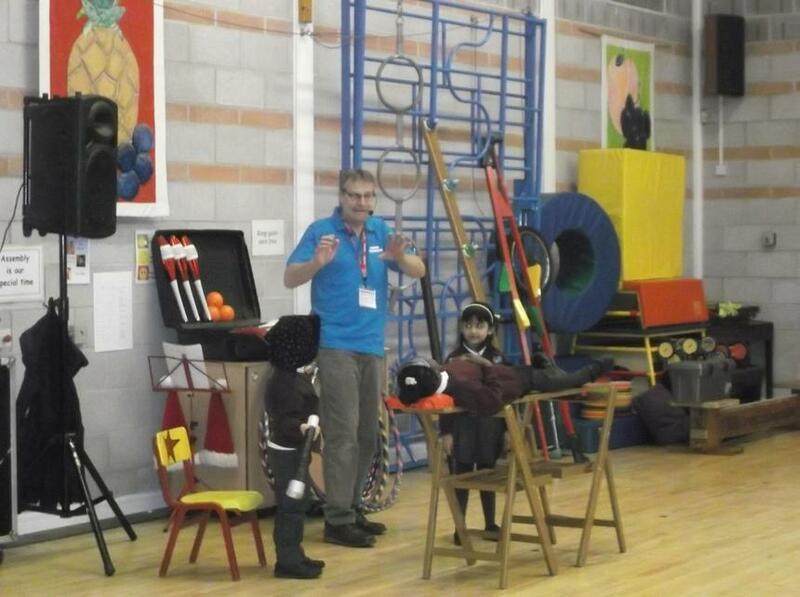 A big thank you to Steve whose sense of humour and ability to engage every type of audience was very impressive. 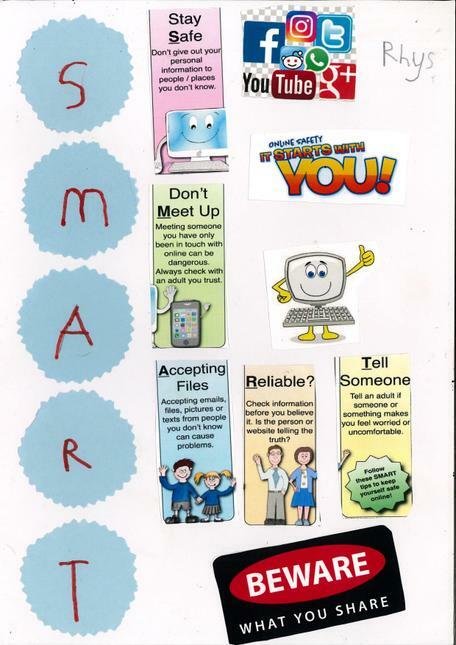 Here are a few examples of our new skills! 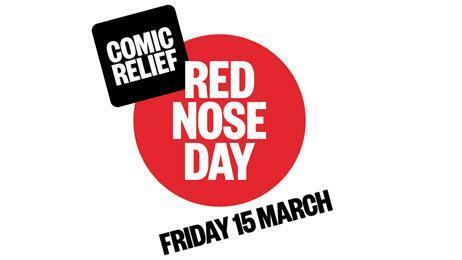 A very big thank you for all the money raised through donations, the purchase of Red Noses and the sale of Comic Relief Joke Books. 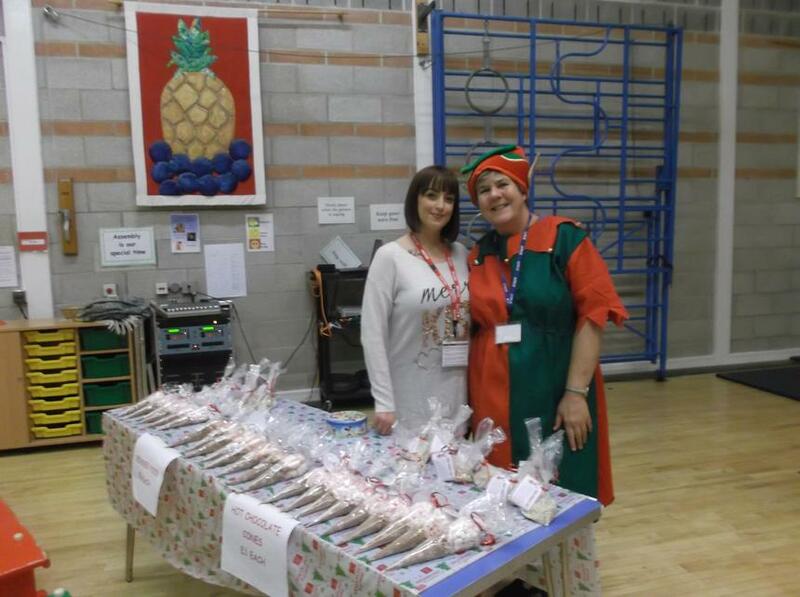 We raised an amazing £510.12. 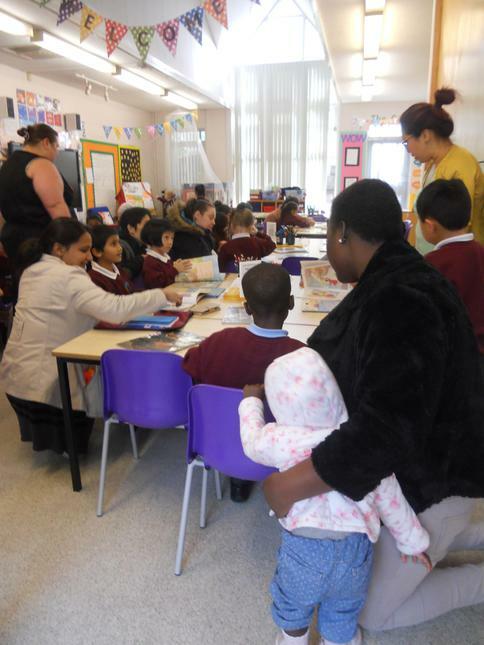 This year Cardinal Road children and staff snuggled up for the day to share their favourite bedtime books. 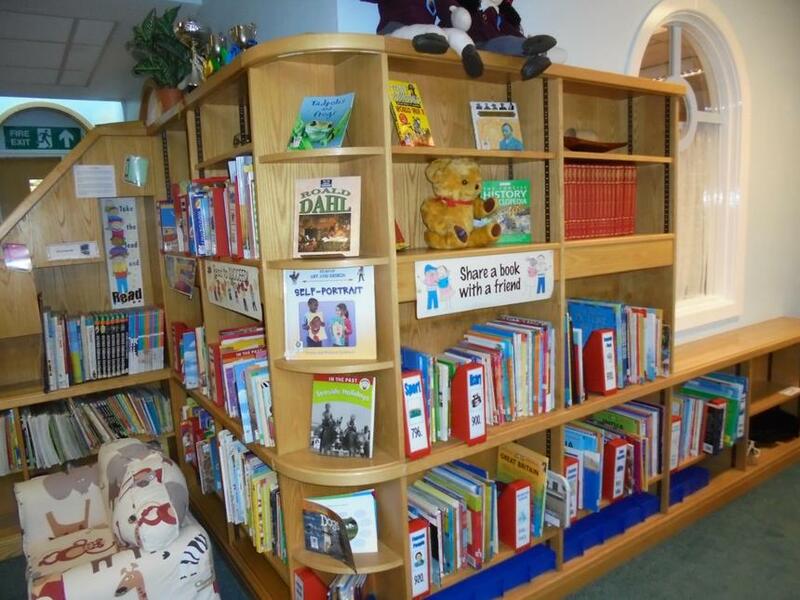 Pajamas and onesies were the dress code and everyone had a fantastic time swapping recommendations for what makes a great bedtime read; do you have a favourite? 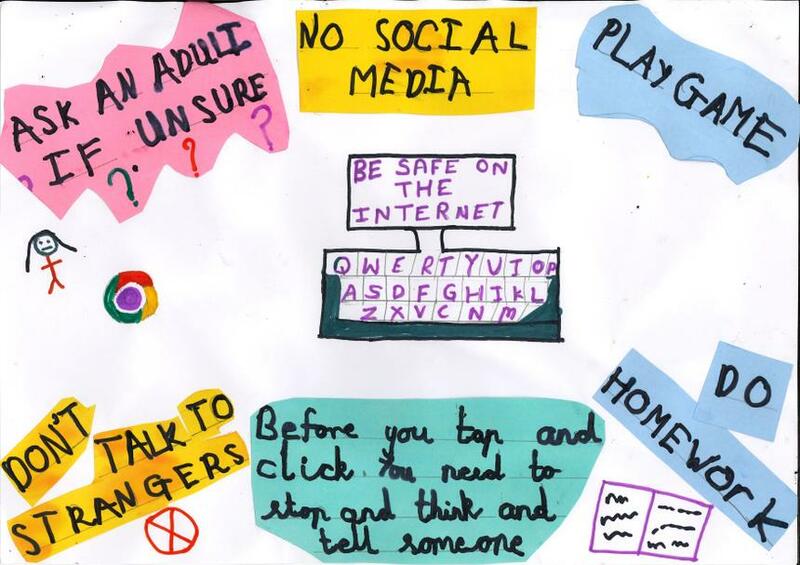 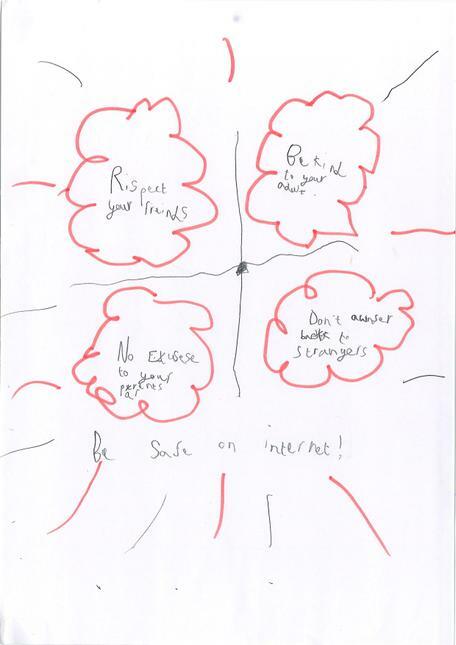 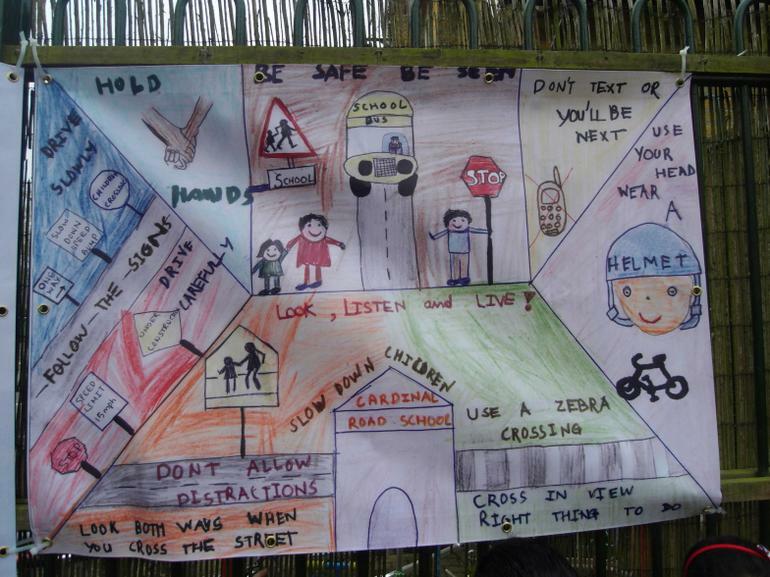 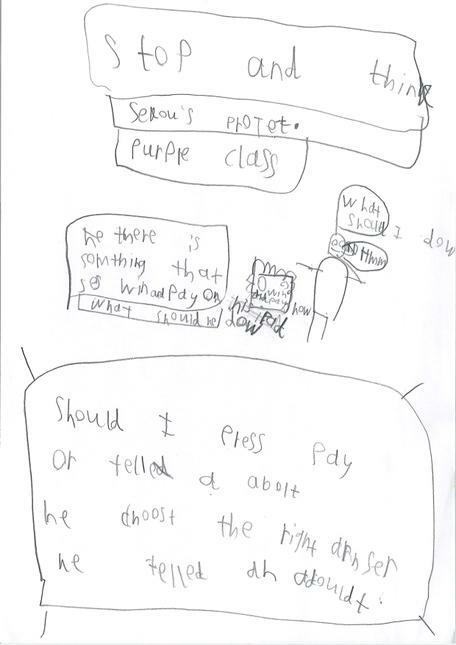 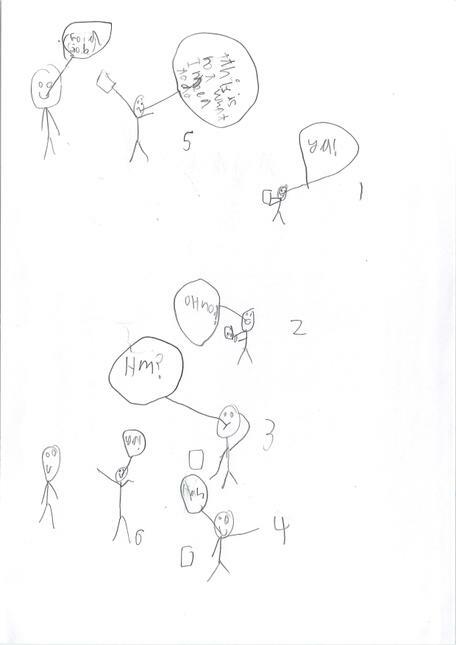 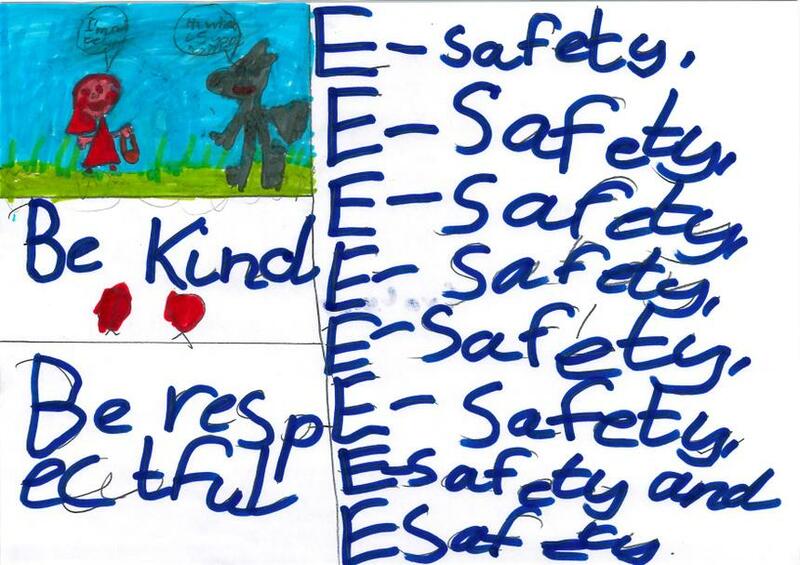 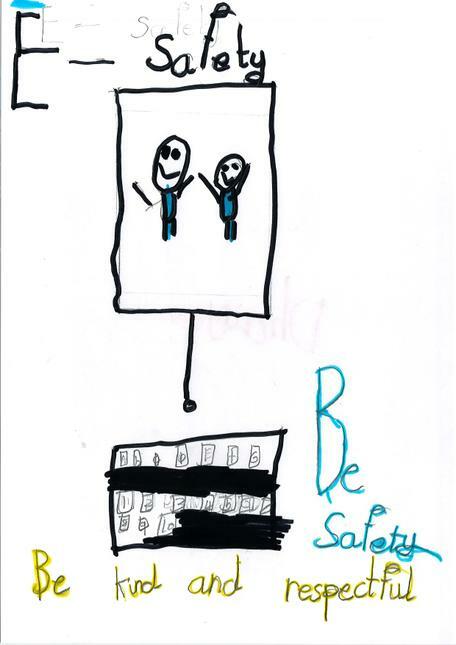 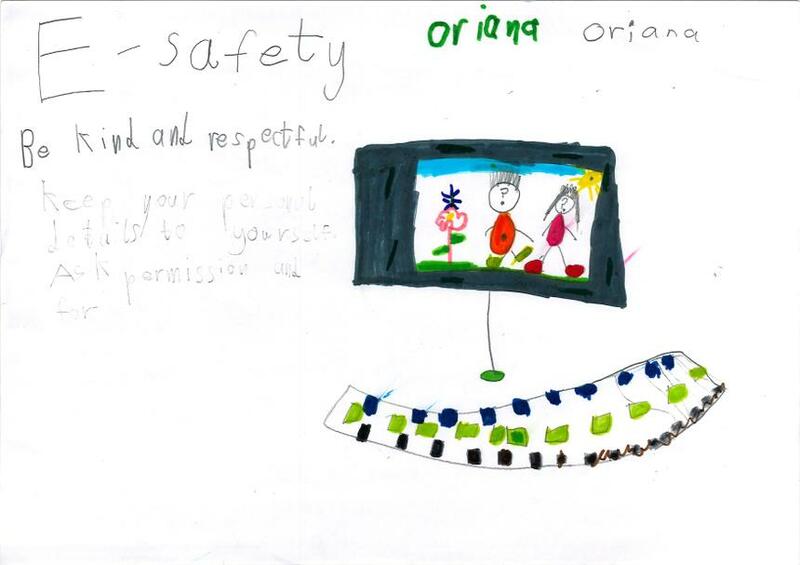 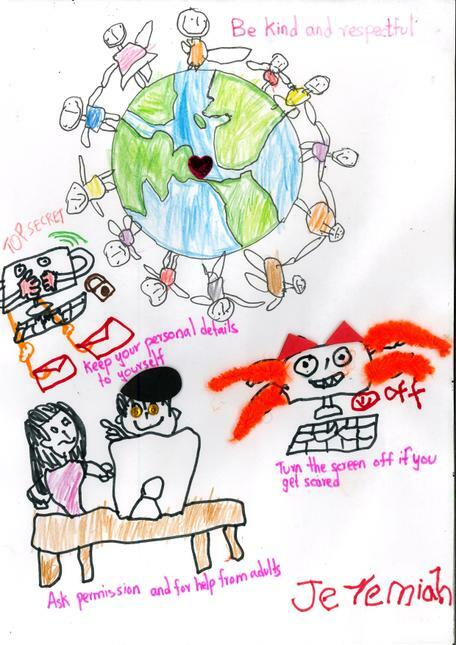 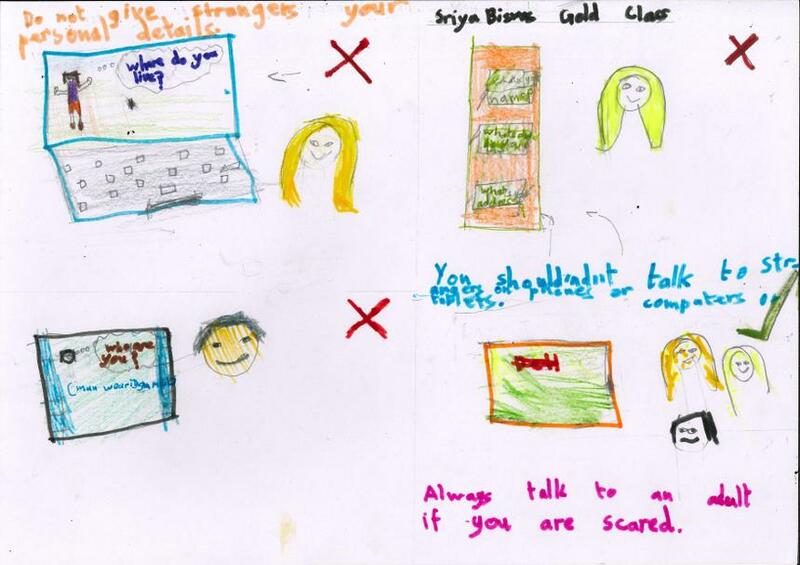 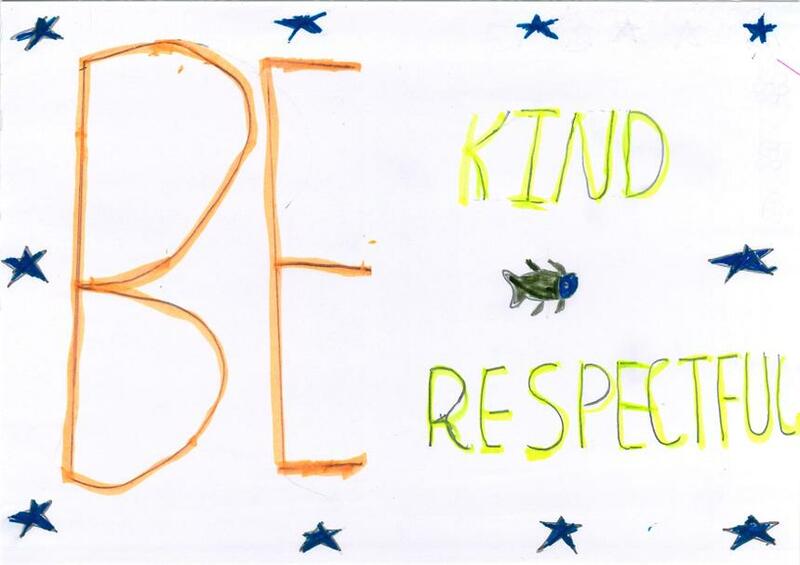 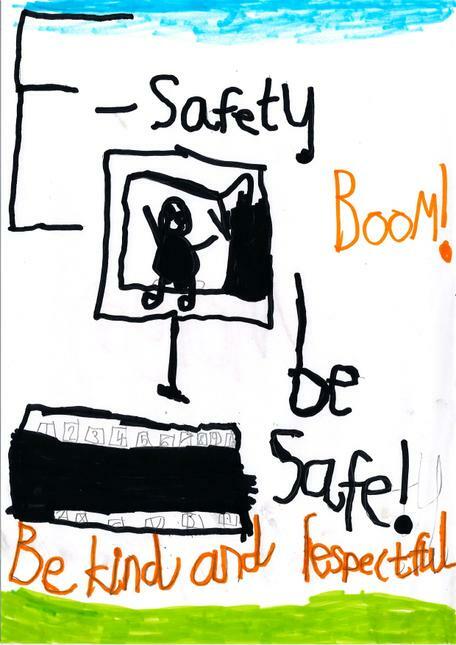 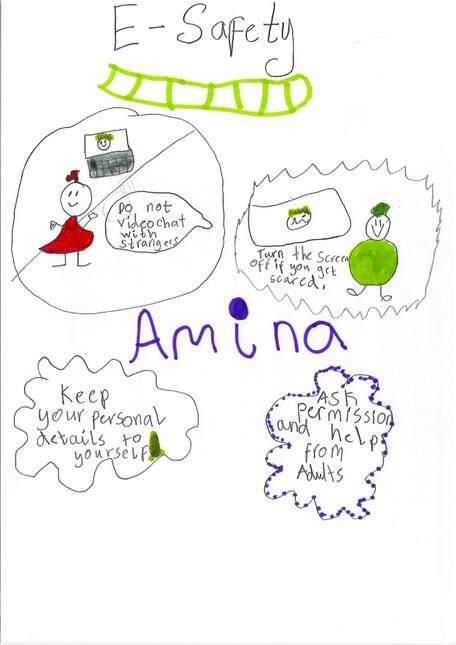 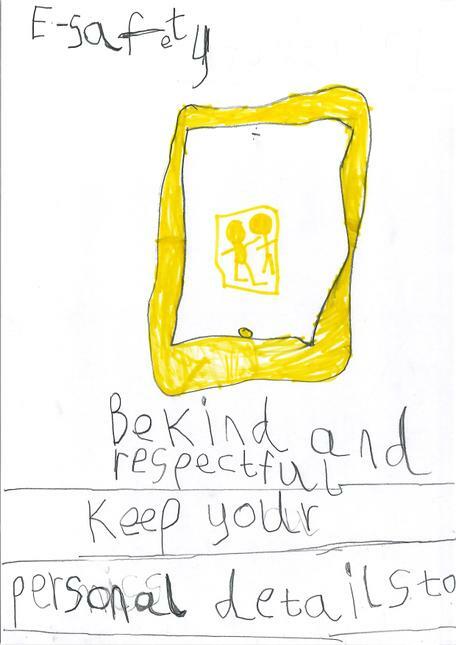 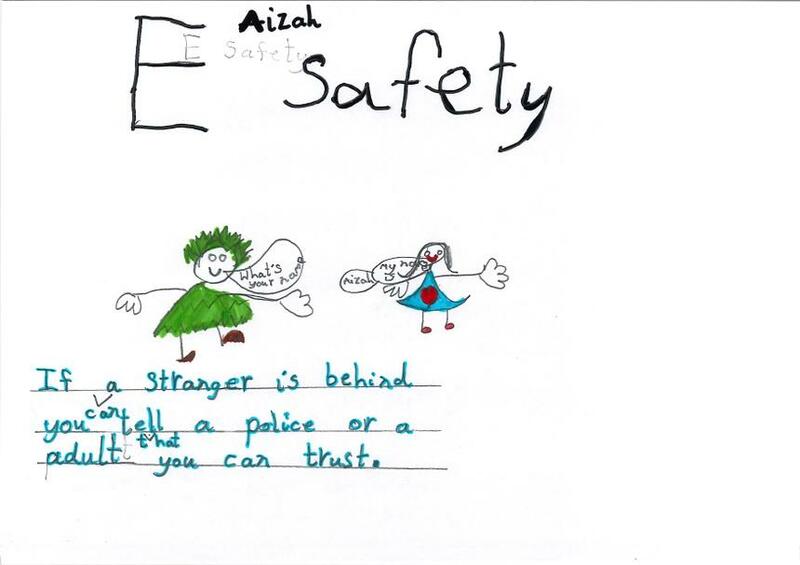 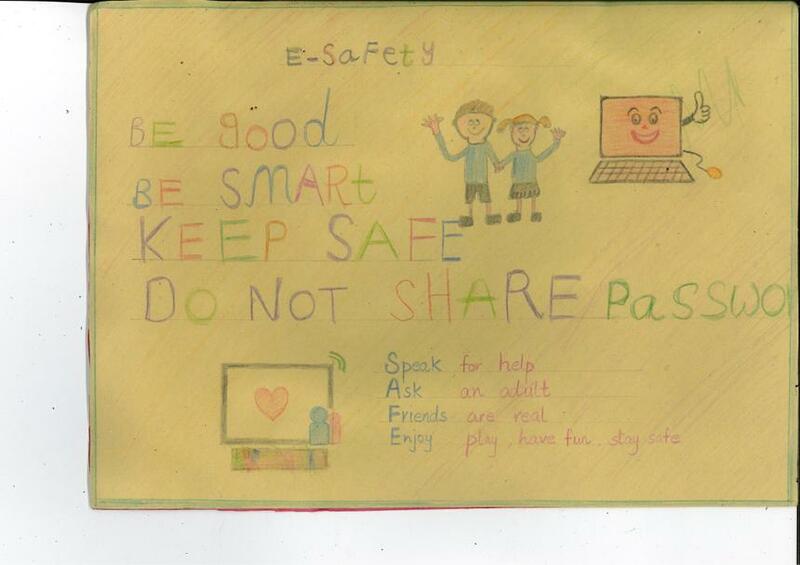 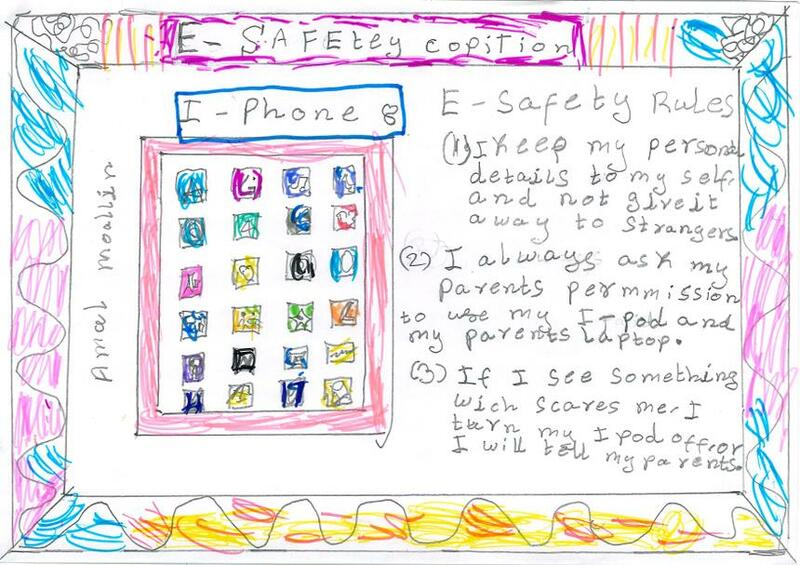 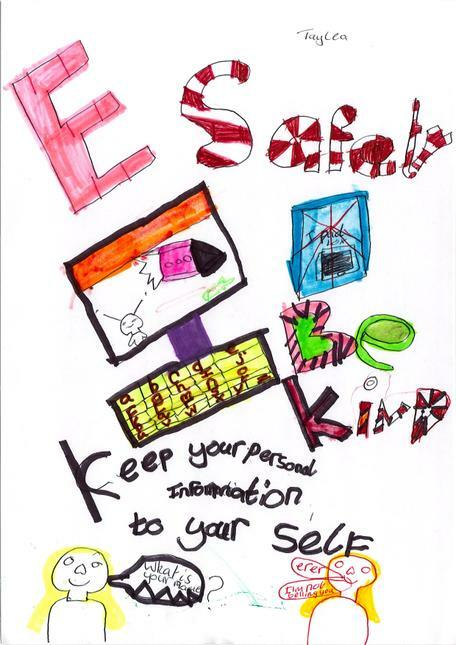 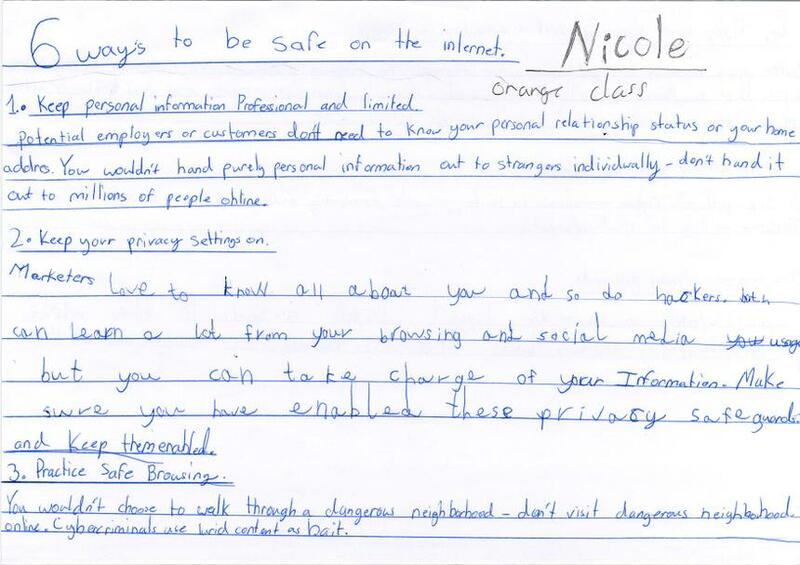 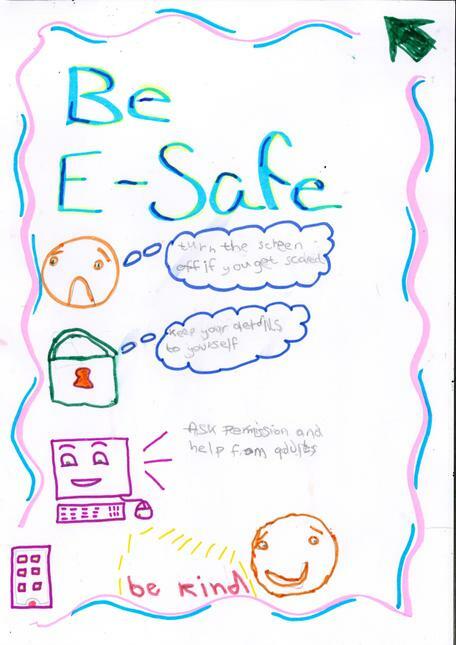 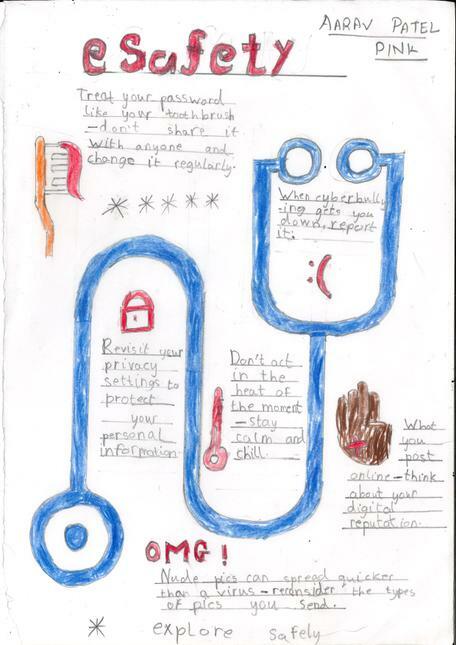 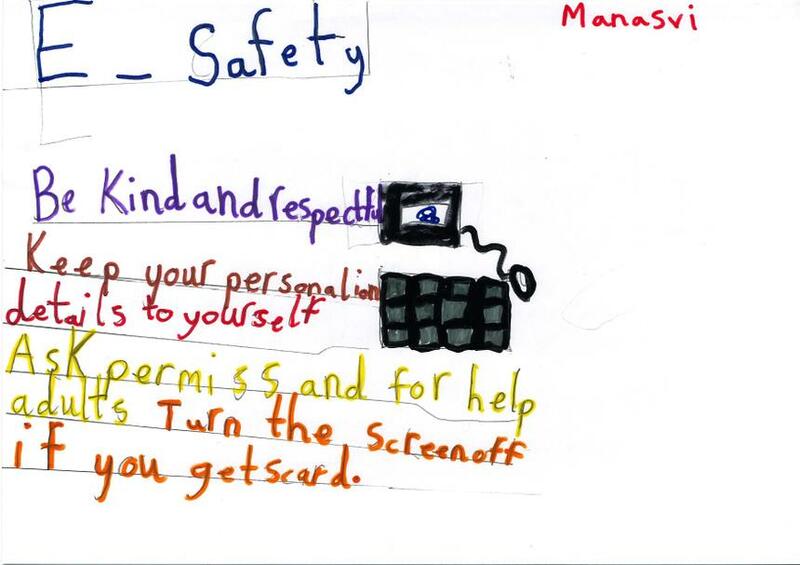 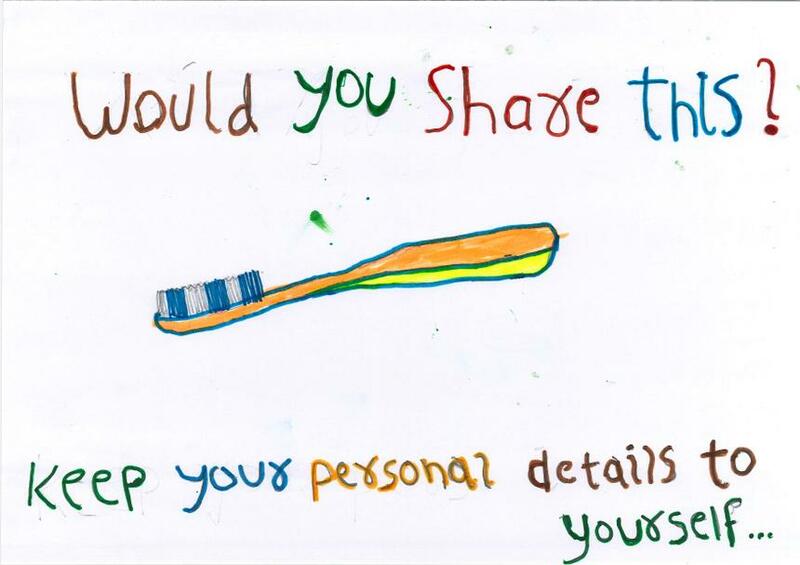 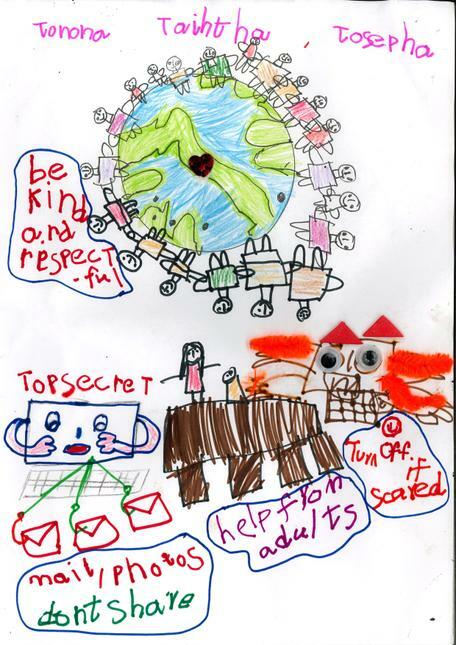 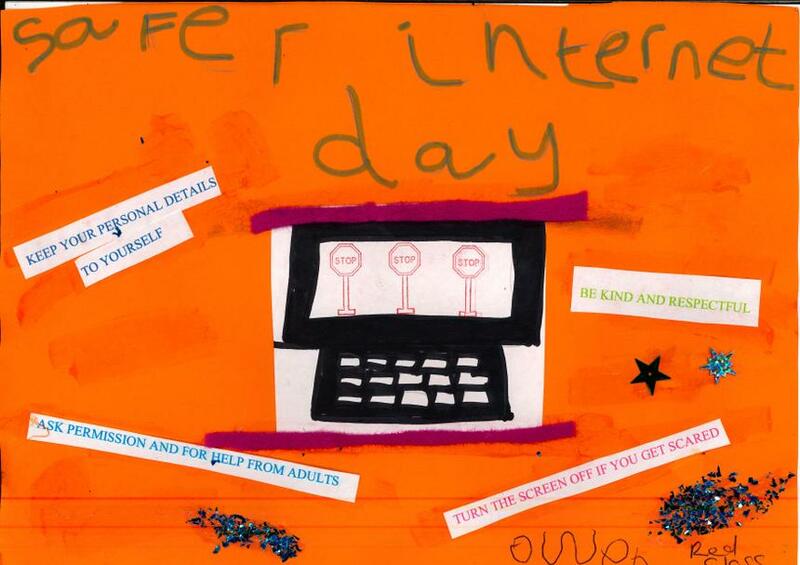 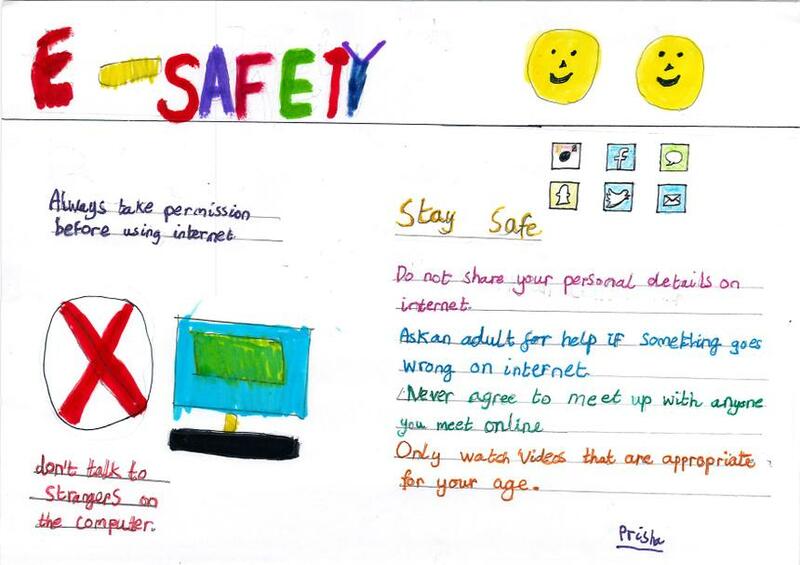 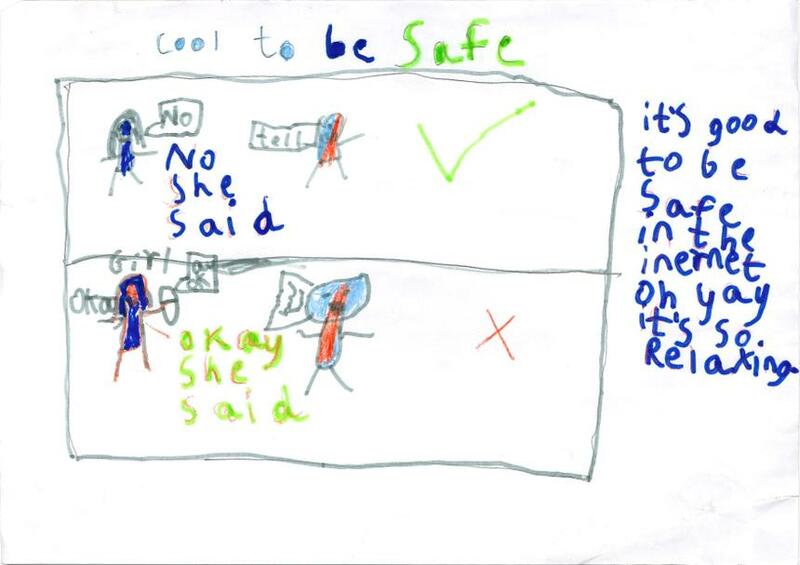 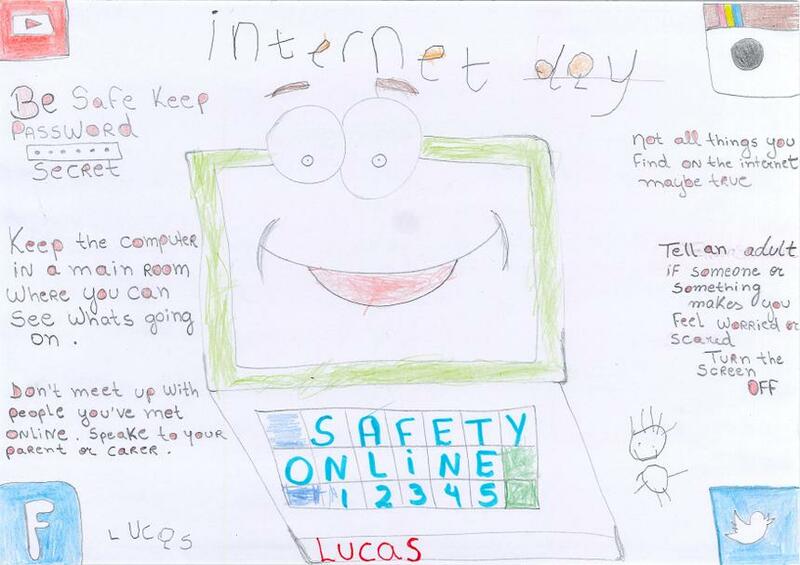 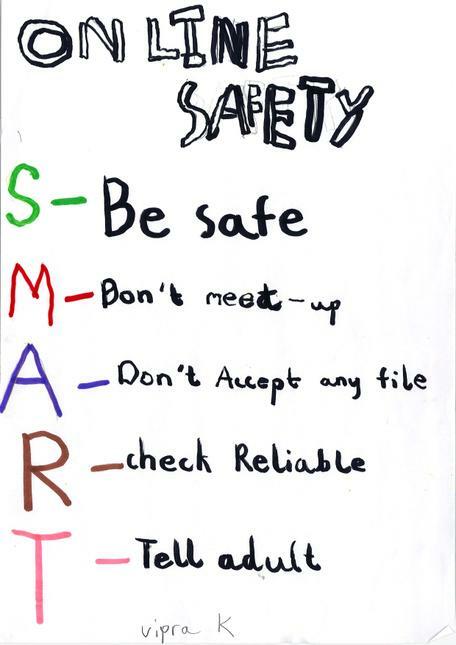 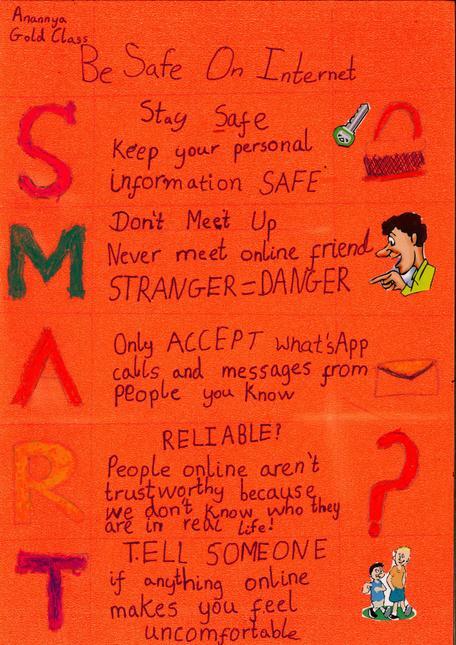 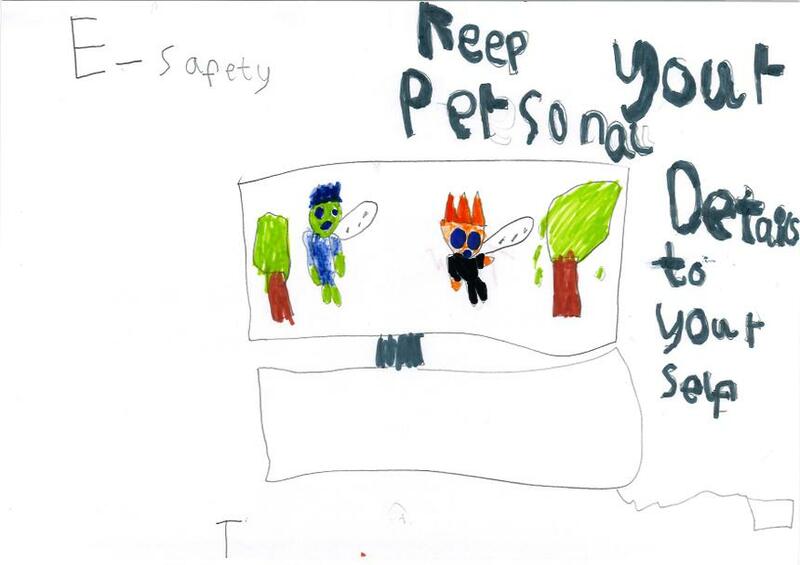 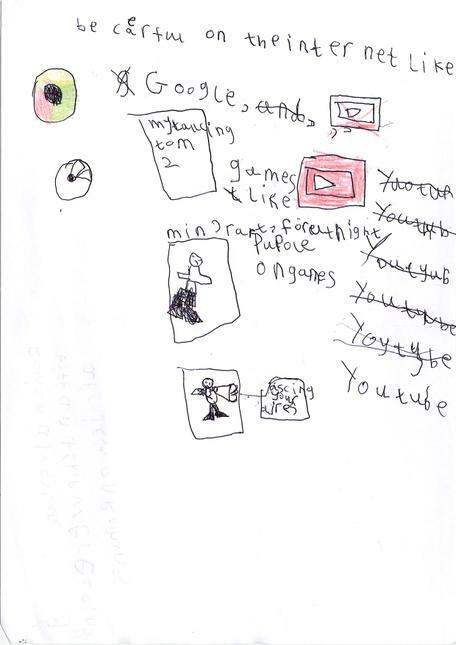 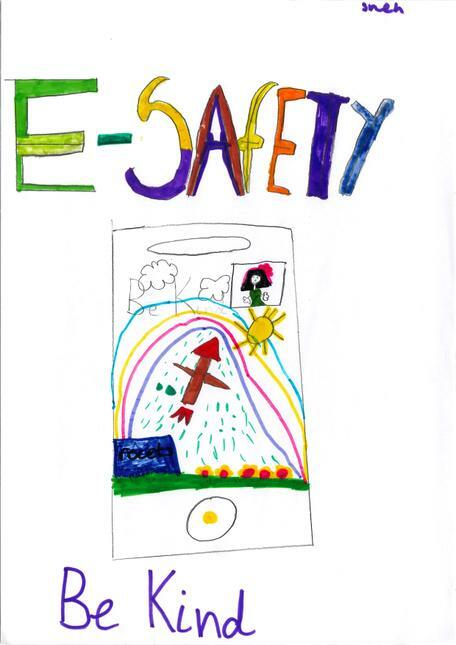 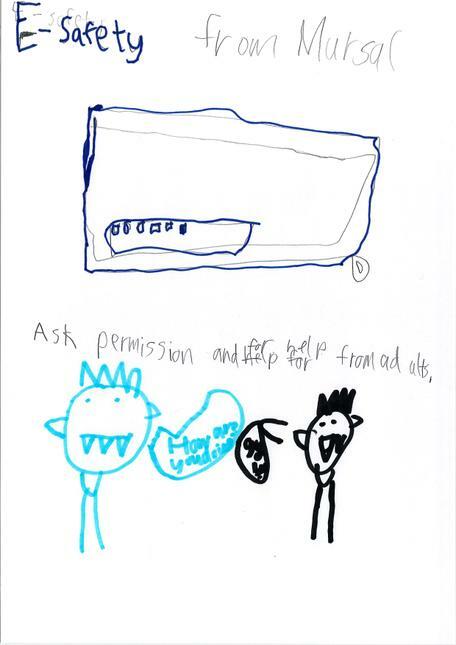 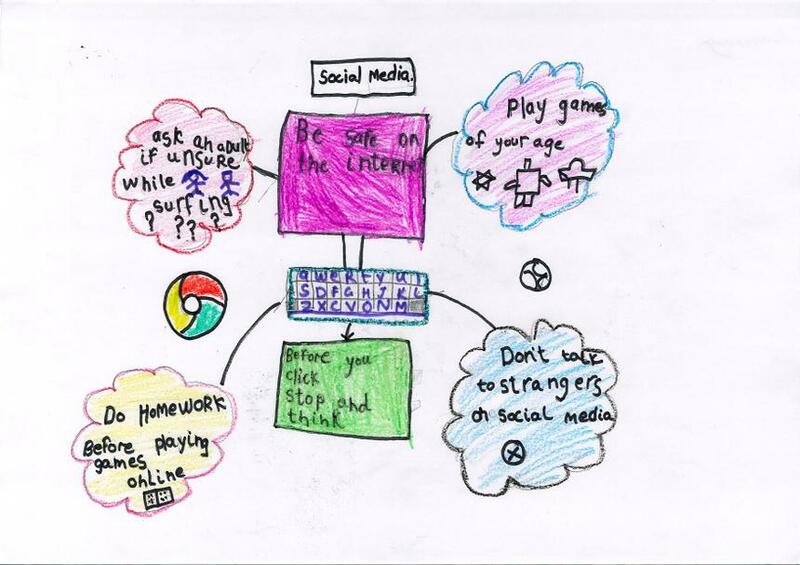 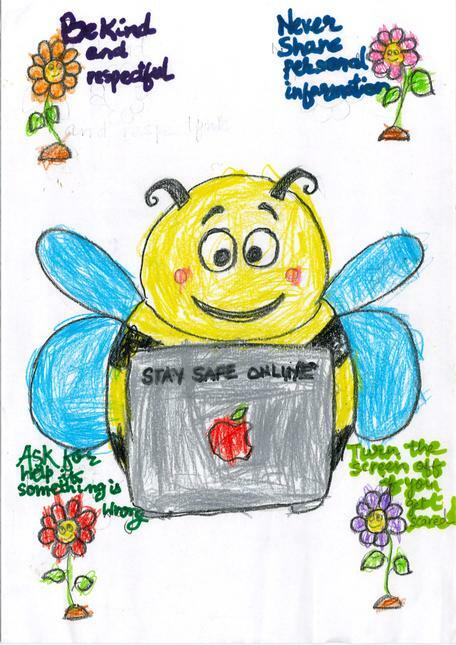 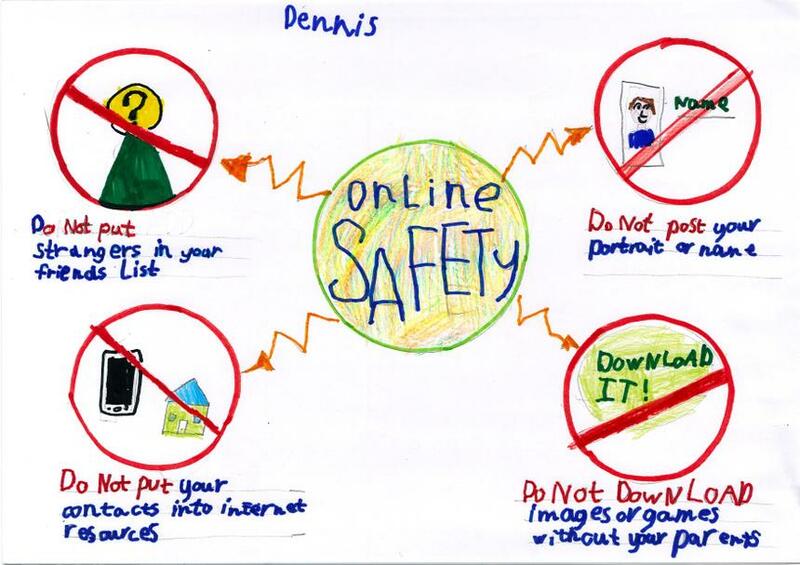 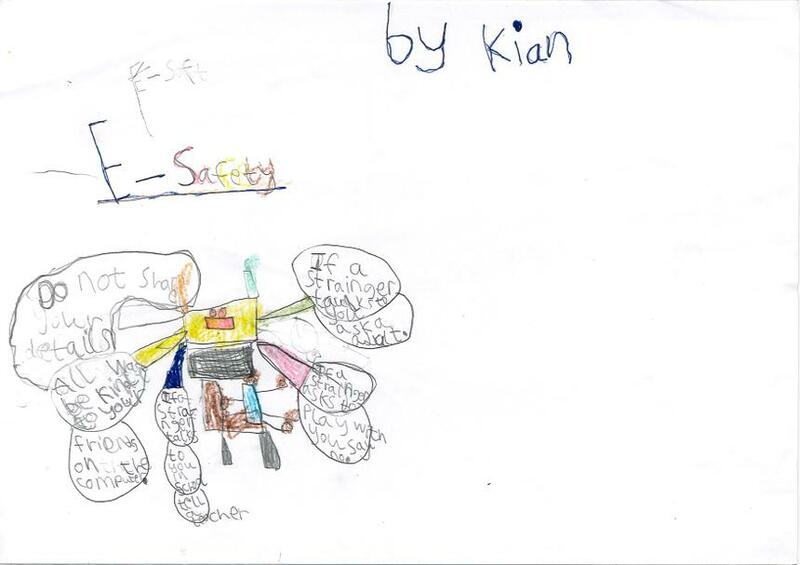 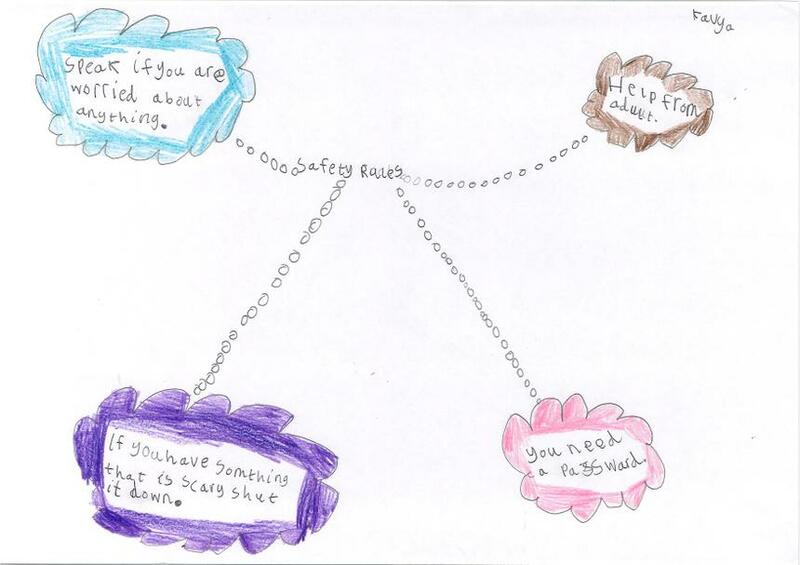 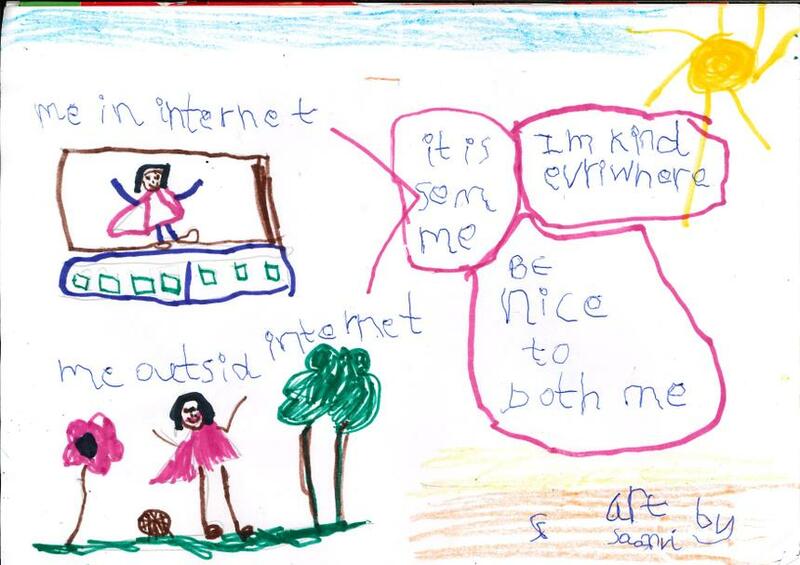 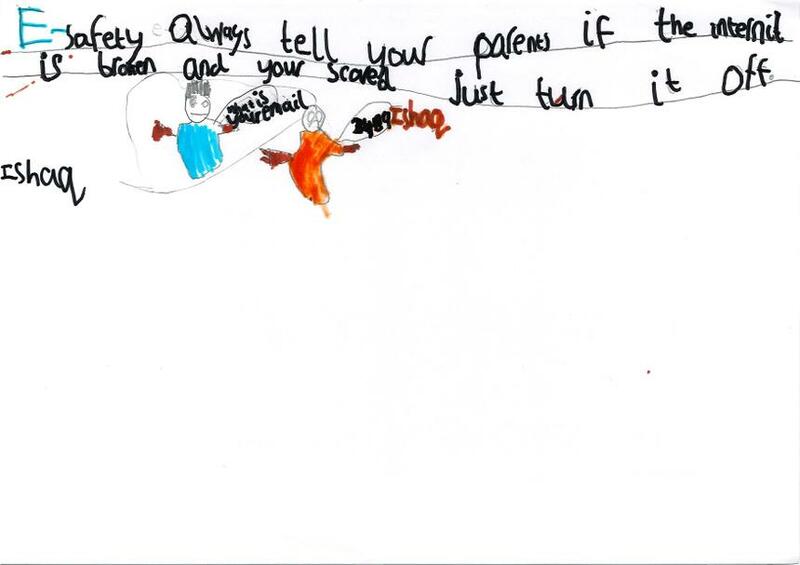 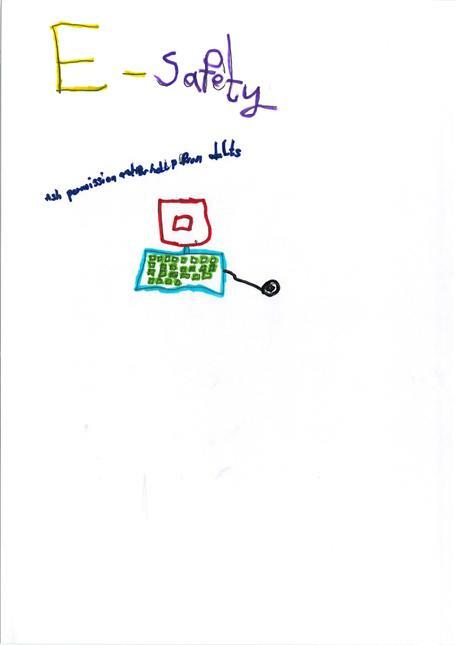 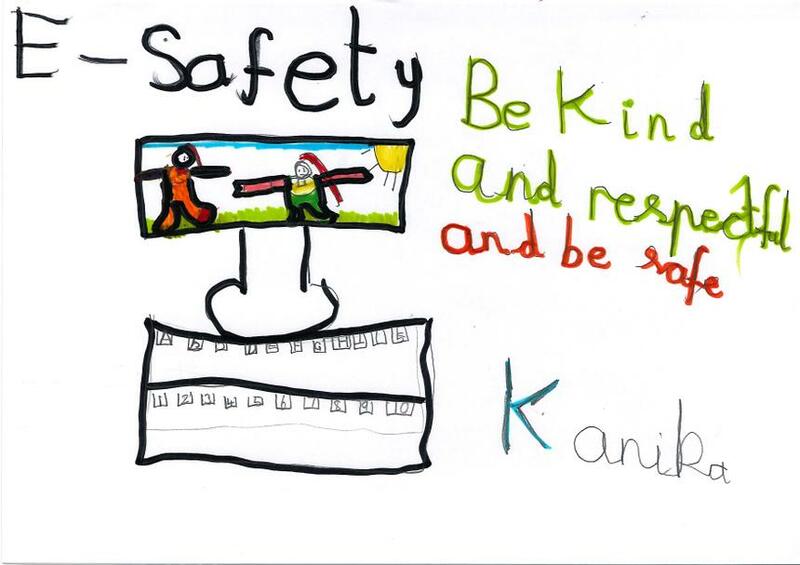 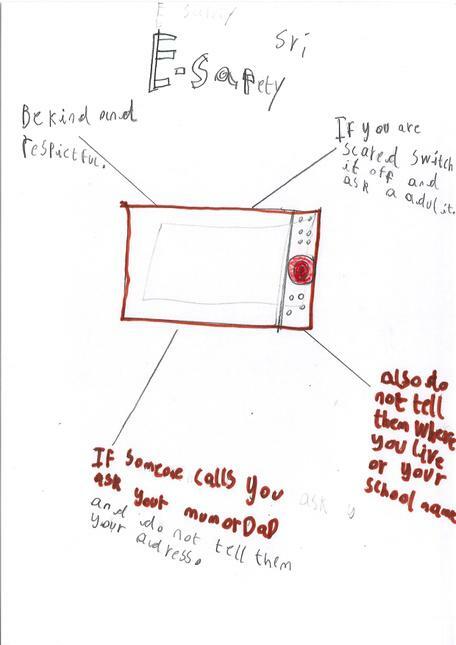 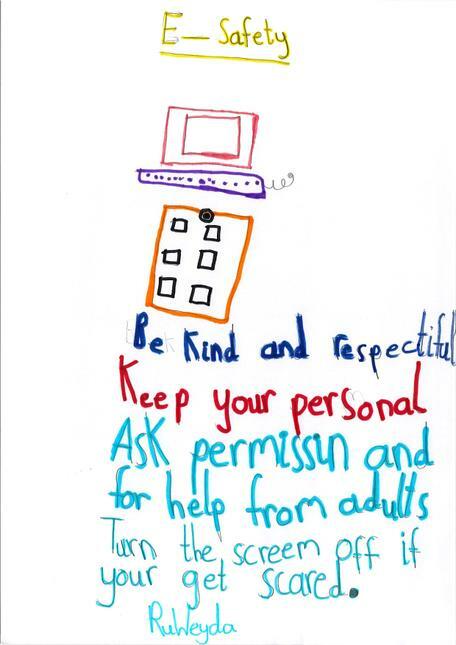 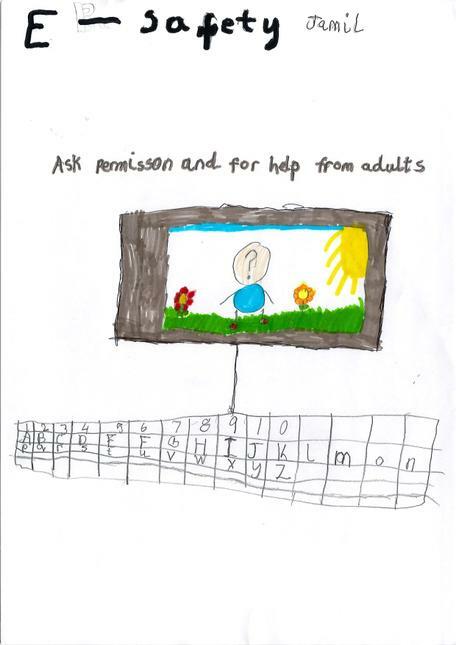 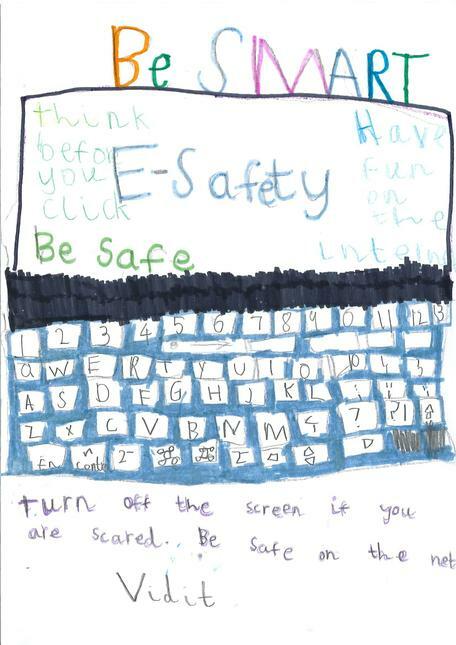 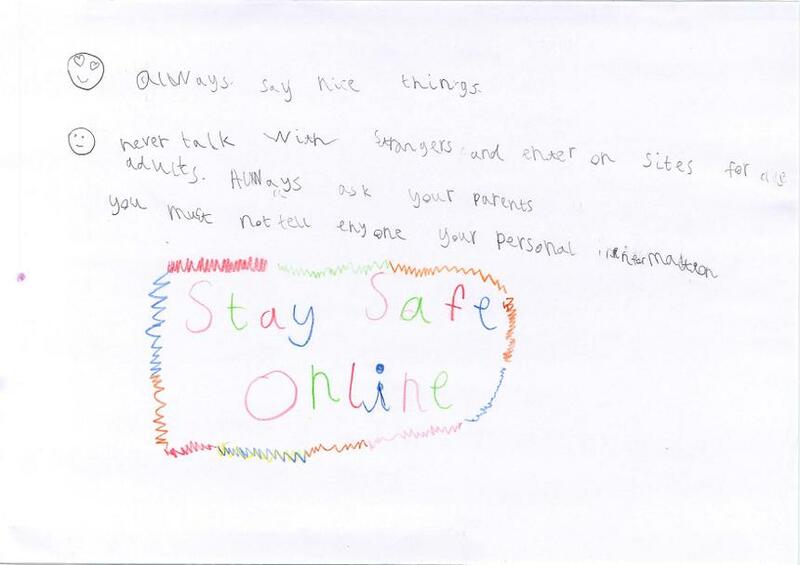 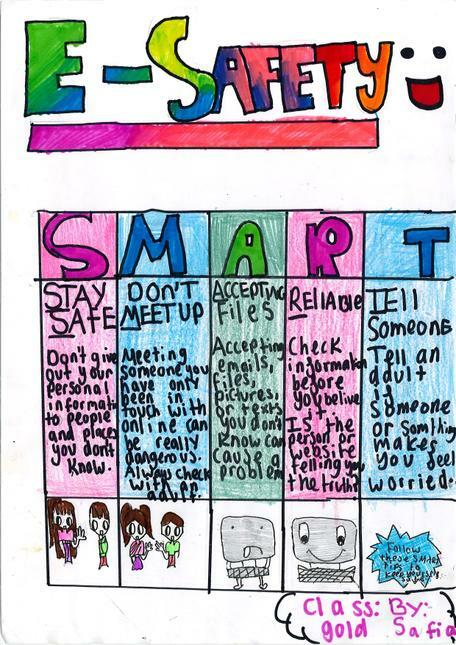 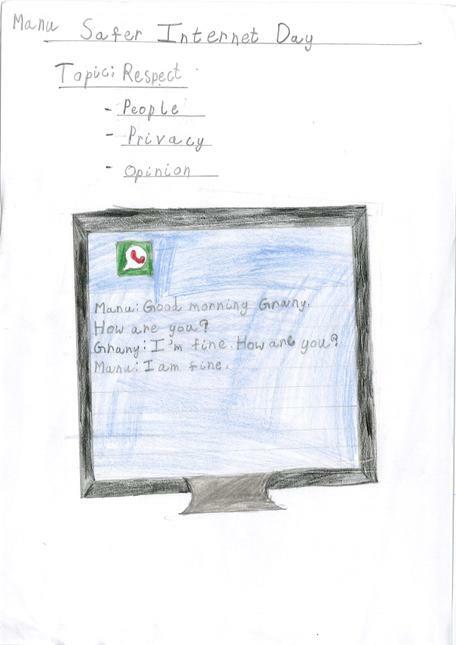 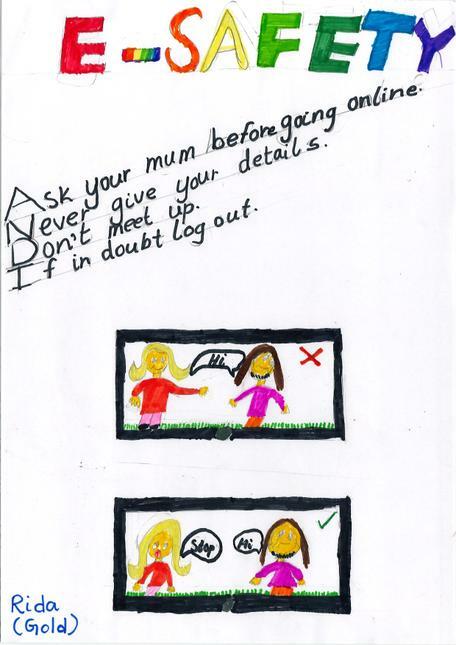 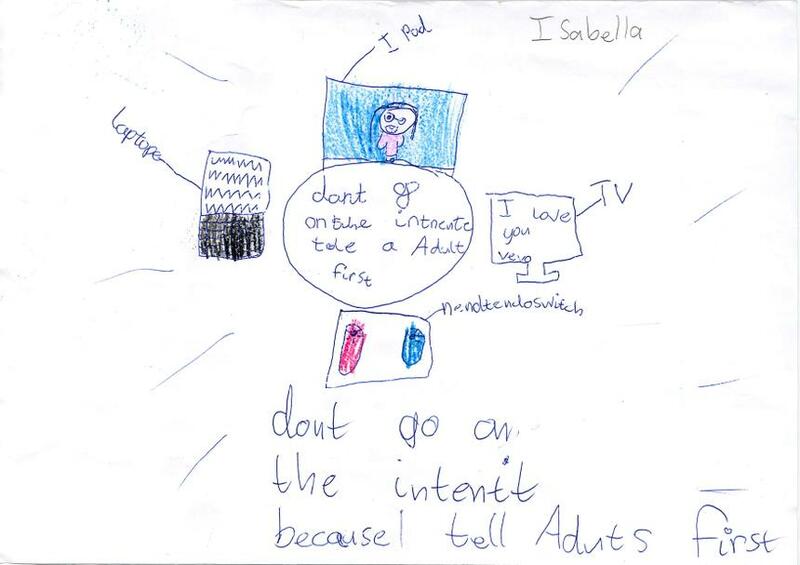 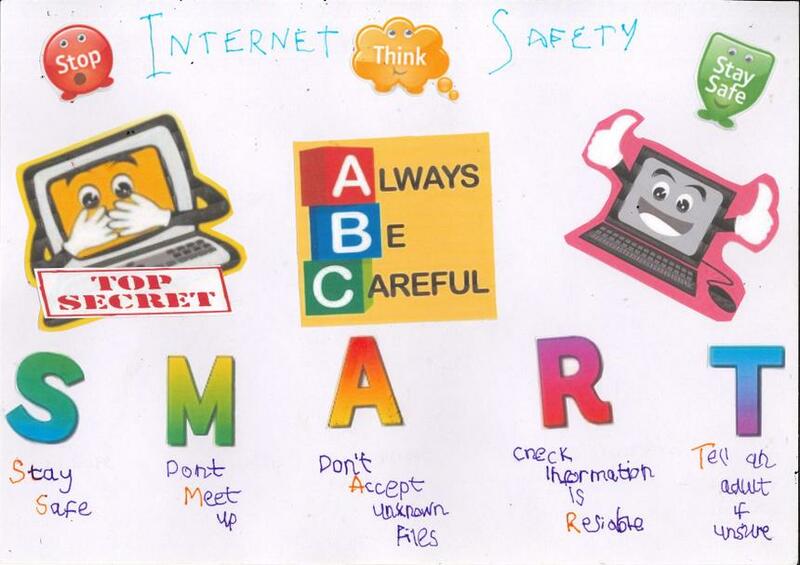 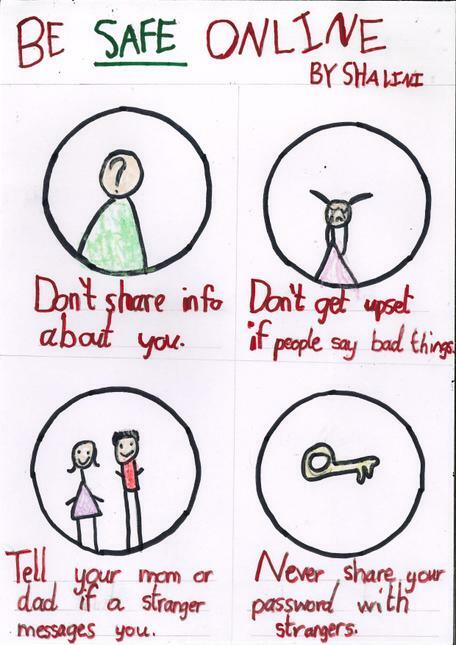 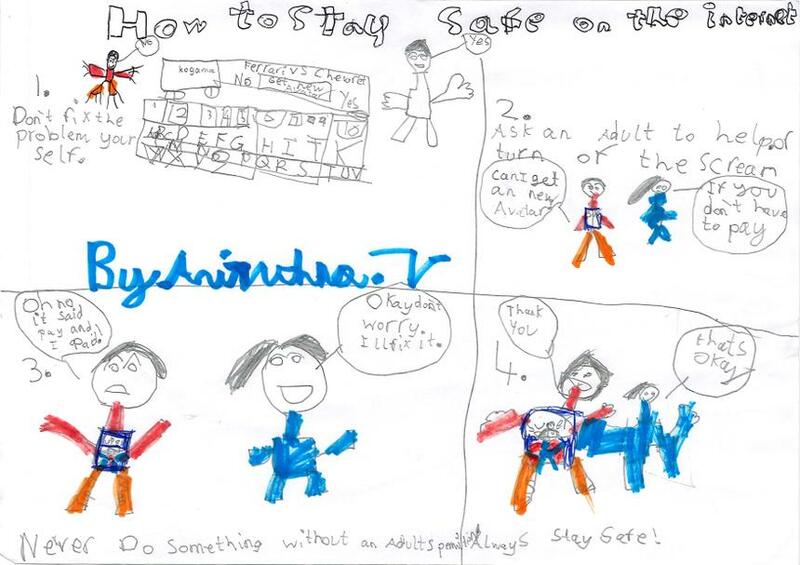 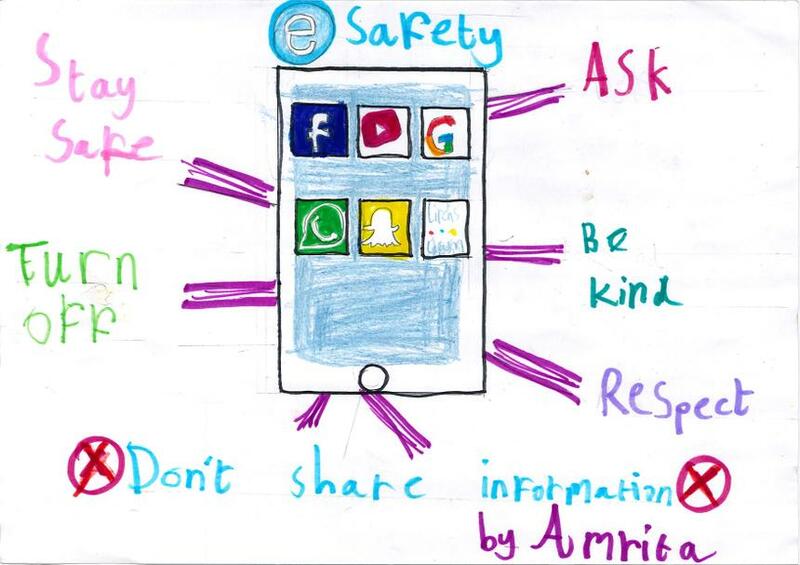 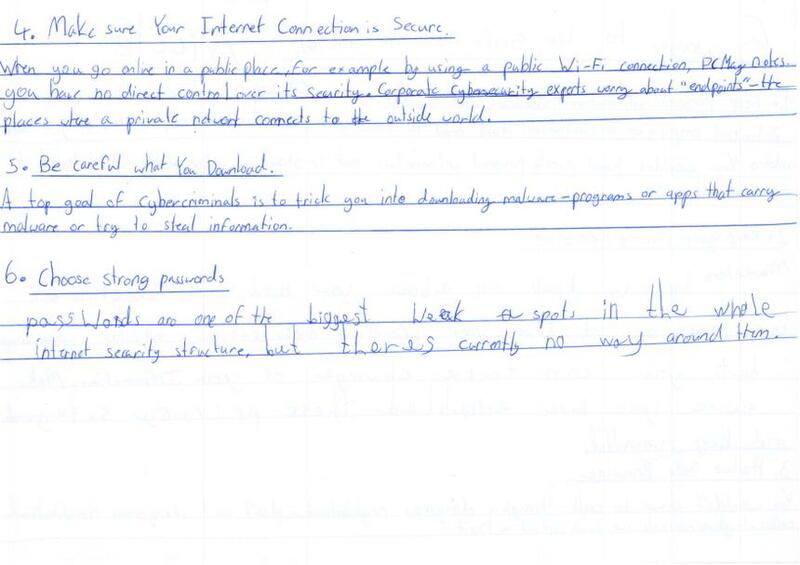 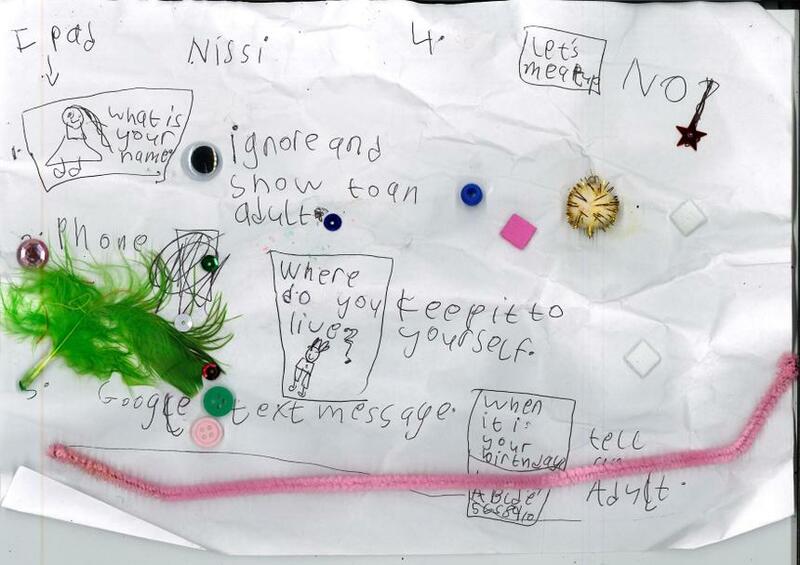 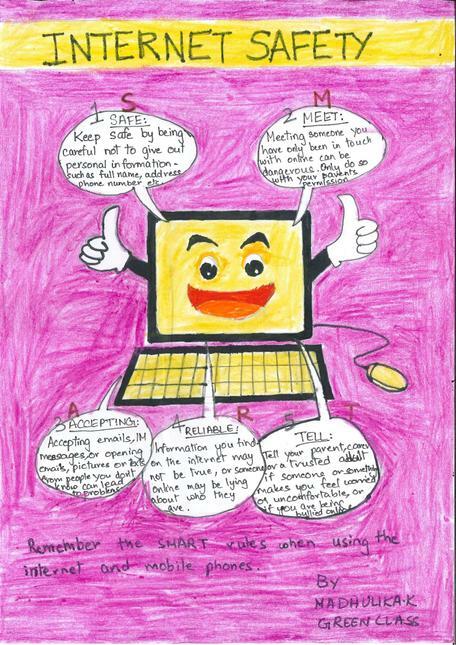 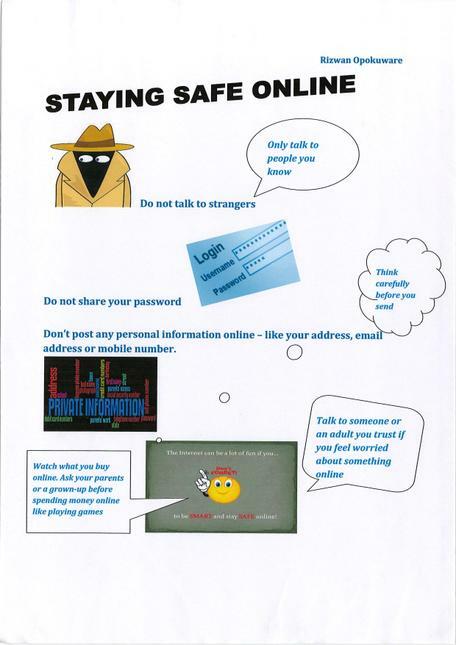 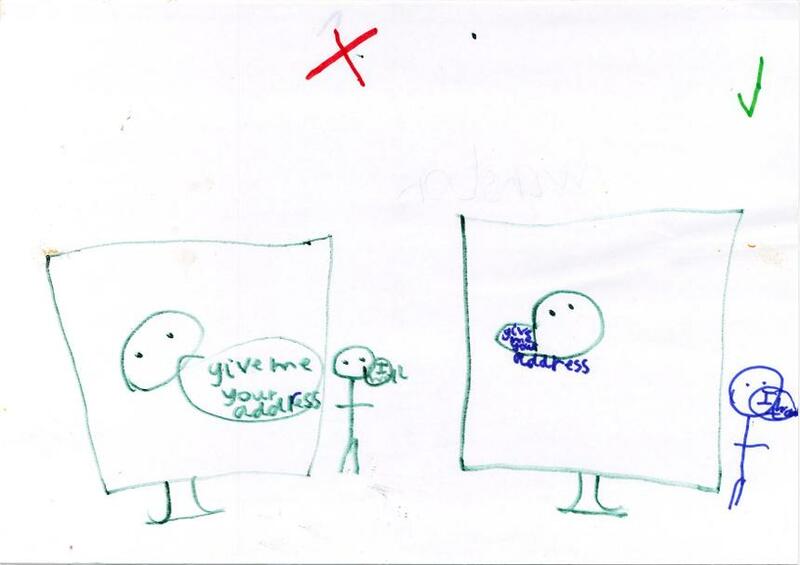 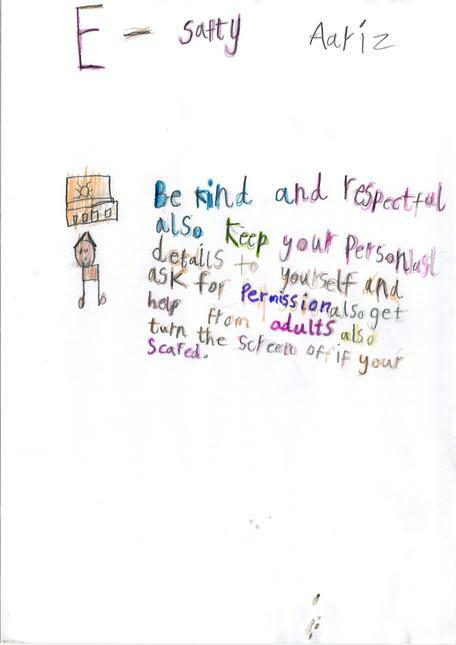 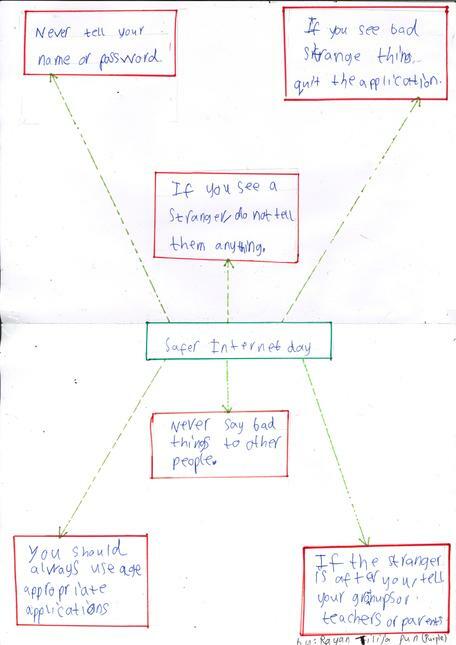 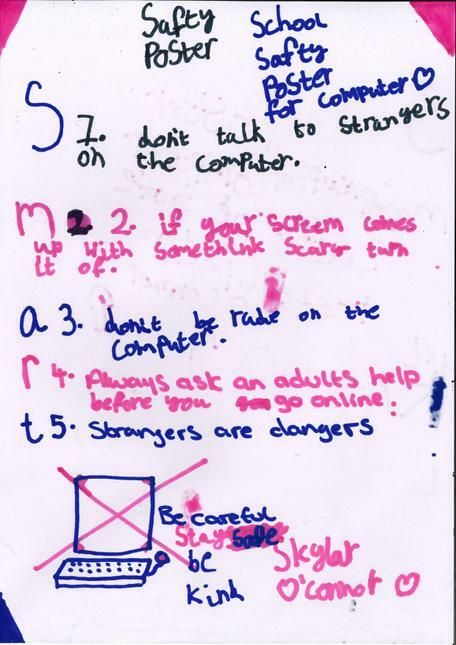 To celebrate Safer Internet Day, our pupils took part in a competition to design e-safety posters at home. 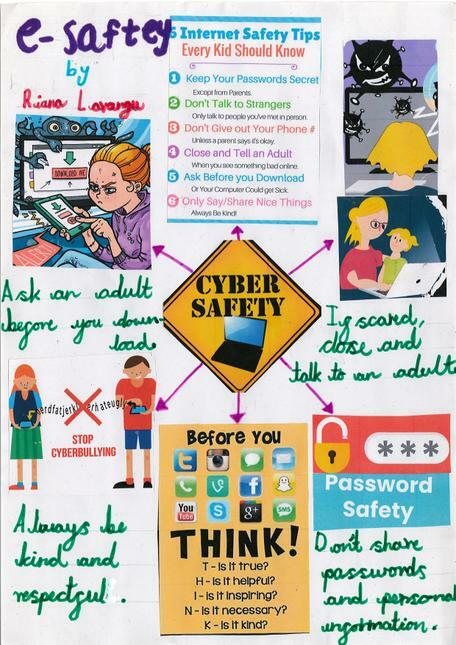 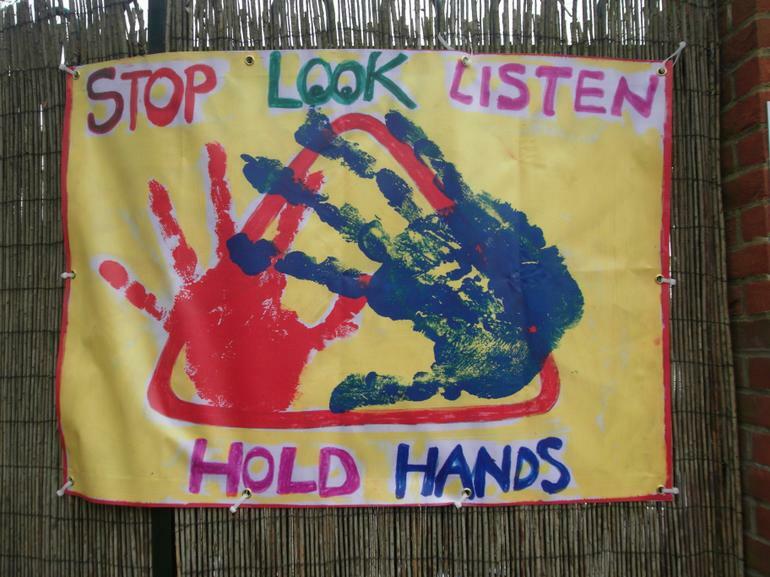 The pupils brought their posters into school and voted on them in their classes. 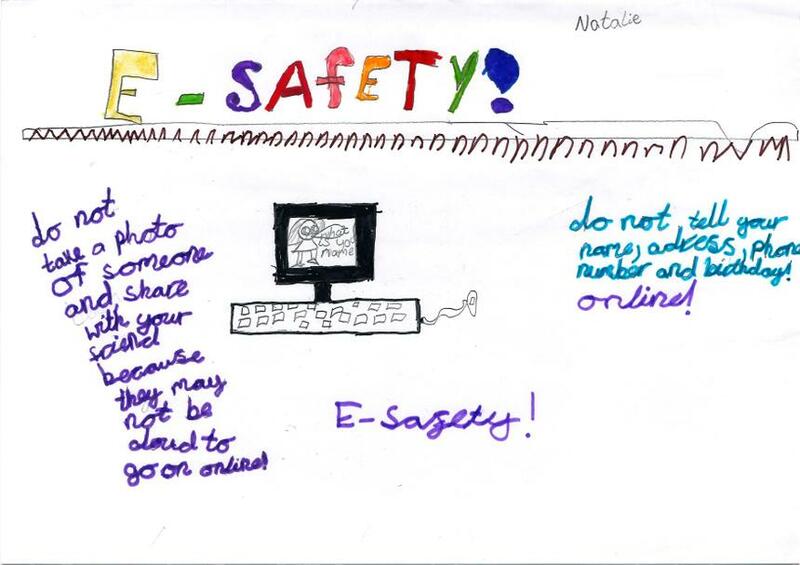 The discussions around the topic of e-safety had when looking at the posters were extremely positive. 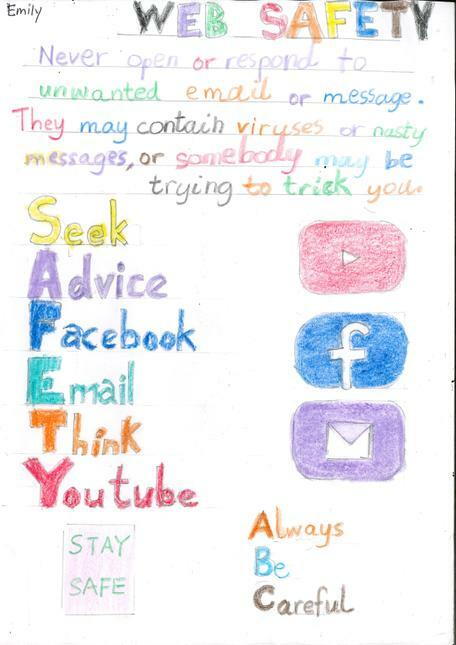 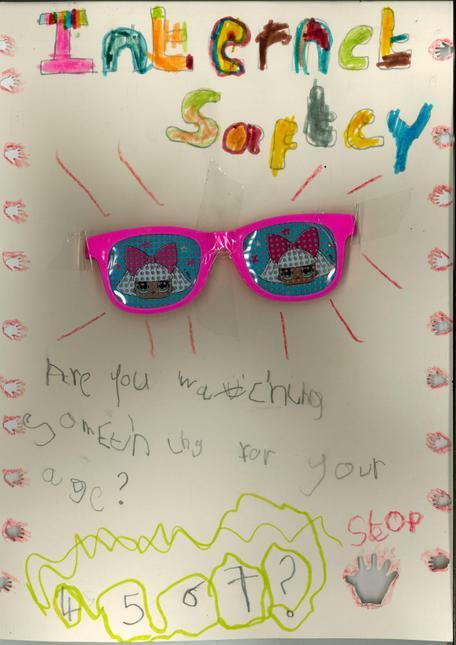 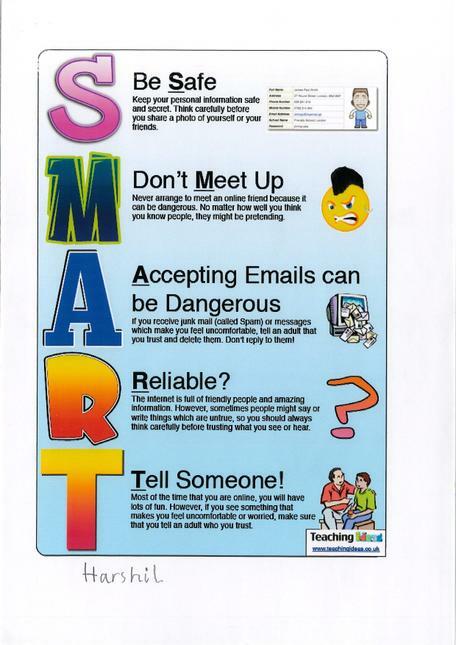 As you can see from the posters, our pupils have a good understanding of how to stay safe online. 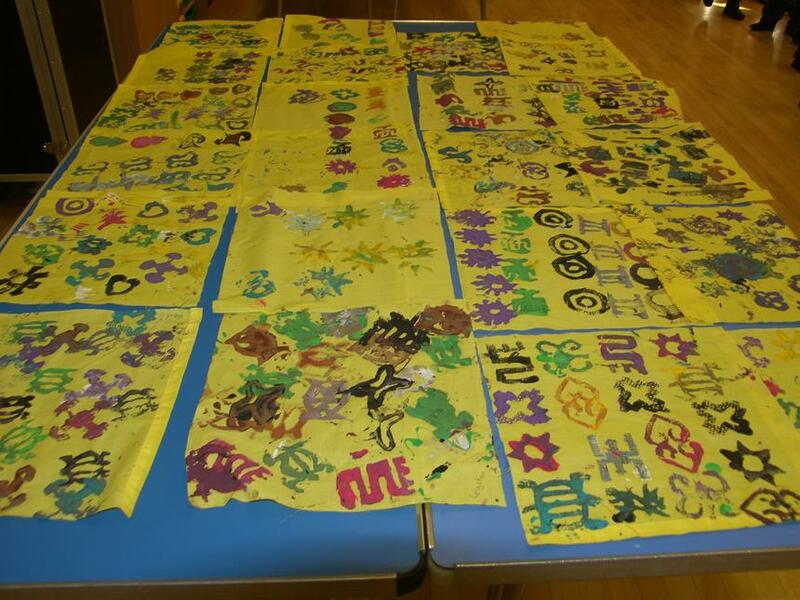 Some of the winning entries as voted for by the children. 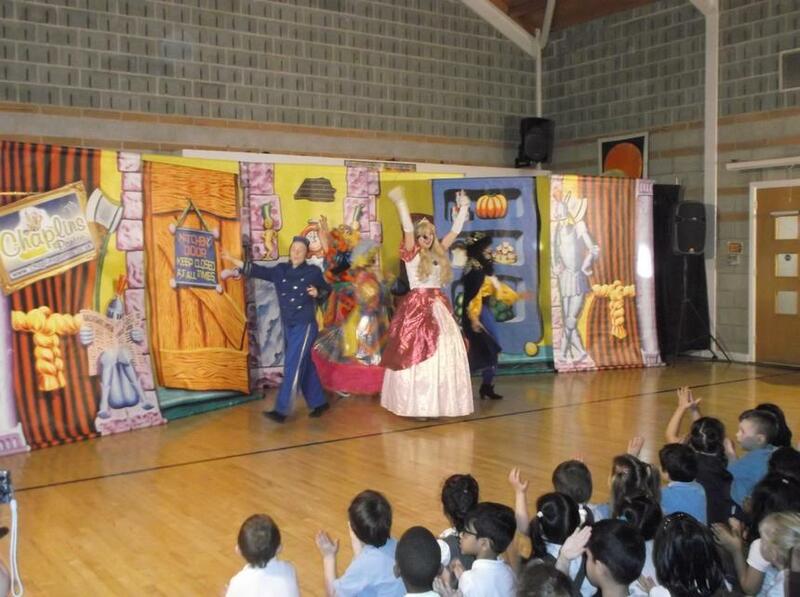 Cardinal Road started the new year with an exciting visit from a theatre company who performed their version of Cinderella to Reception, Year 1 and Year 2 children. 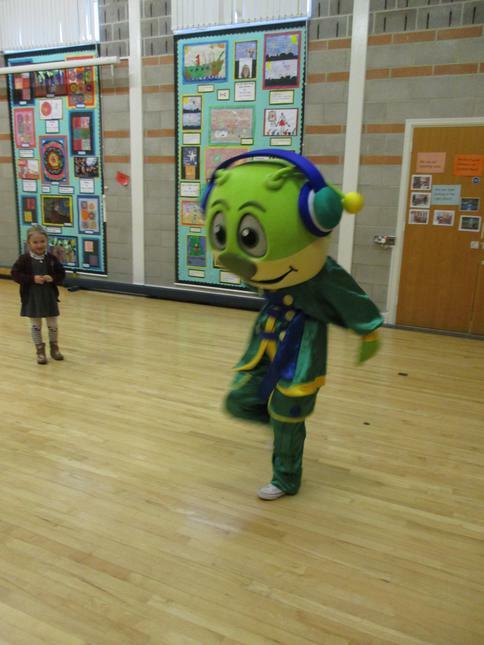 Everyone had lots of fun joining in with the songs and actions and helping Buttons to save the day! 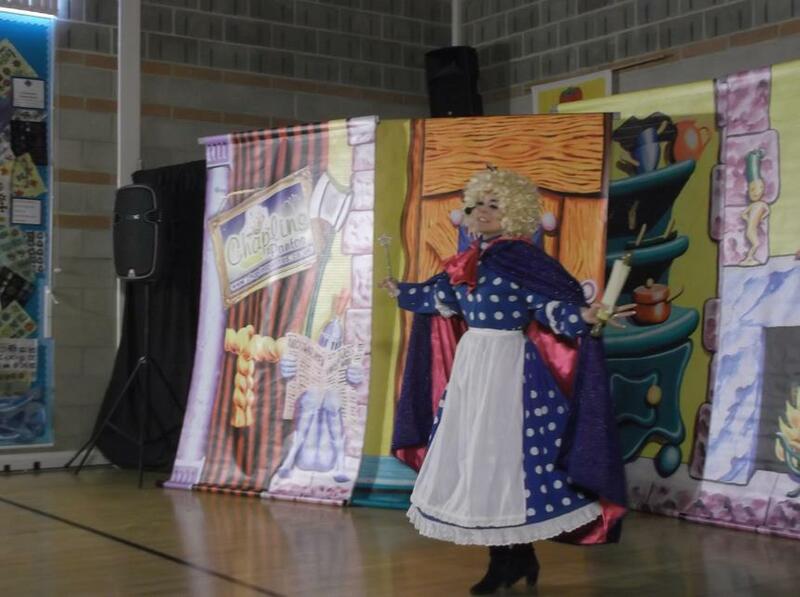 It was great to see some children who had never been to a pantomime before experience the awe and wonder of live theatre for the first time and there was a lovely sense of community in the hall as the school came together on the second day of term. 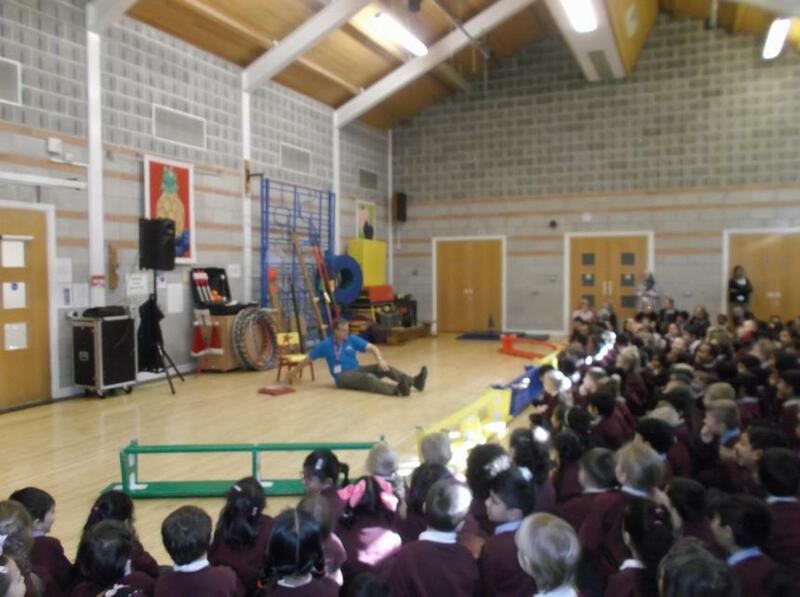 Each year group had prepared for the visit with activities the day before and there were many speaking and listening opportunities after the show, as the playground was buzzing with favourite moments, characters and groups of children acting out their favourite scenes. 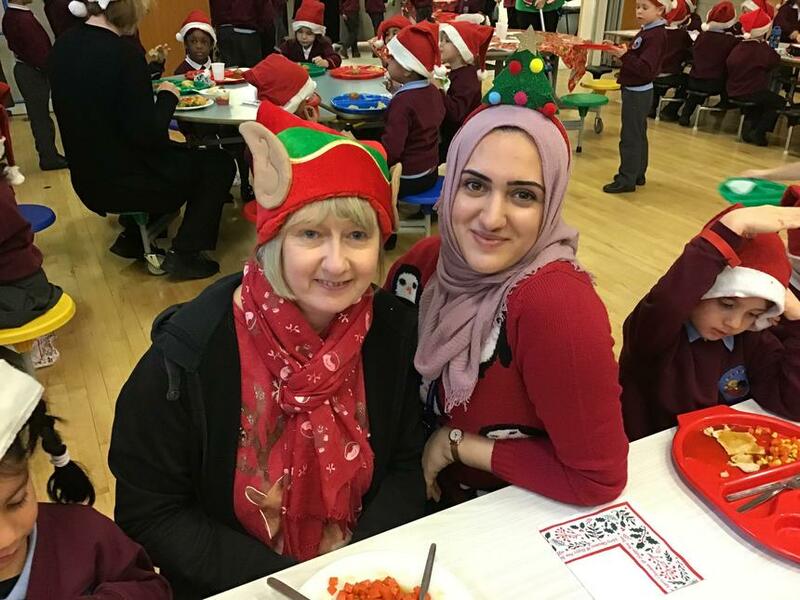 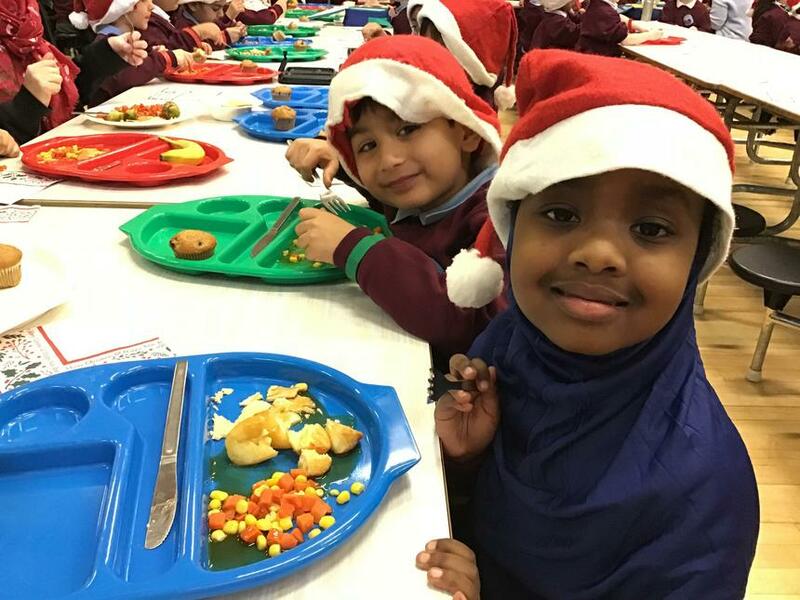 Staff and children joined together for a delicious Christmas lunch with all the trimmings and a Christmas sing- a- long. 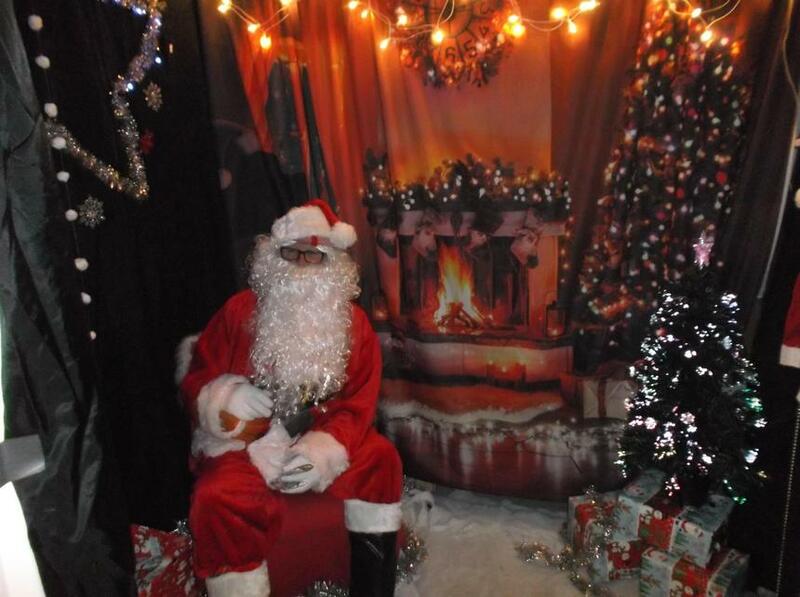 Santa visited Cardinal Road during the last full week of school before Christmas. 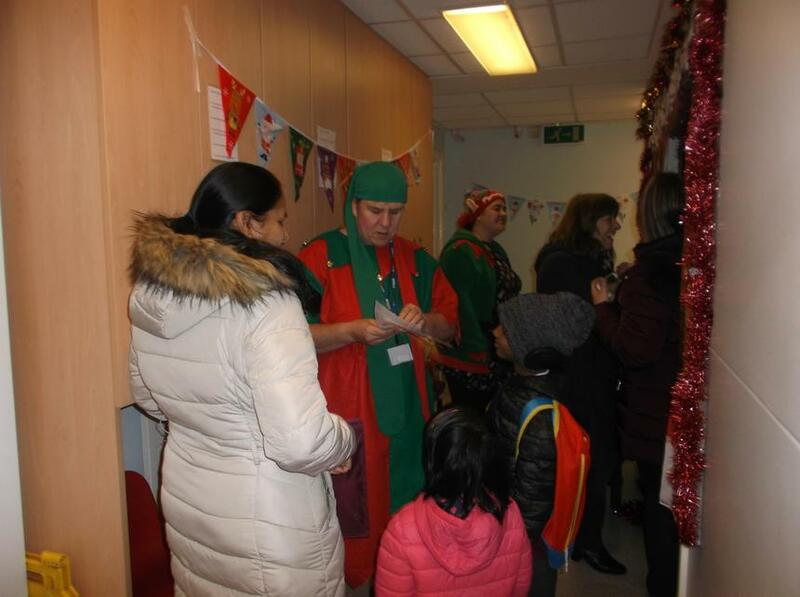 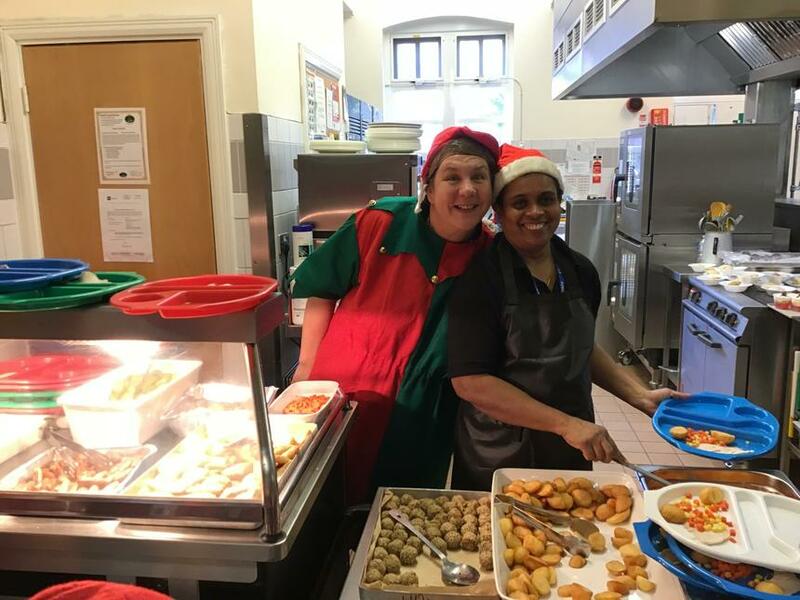 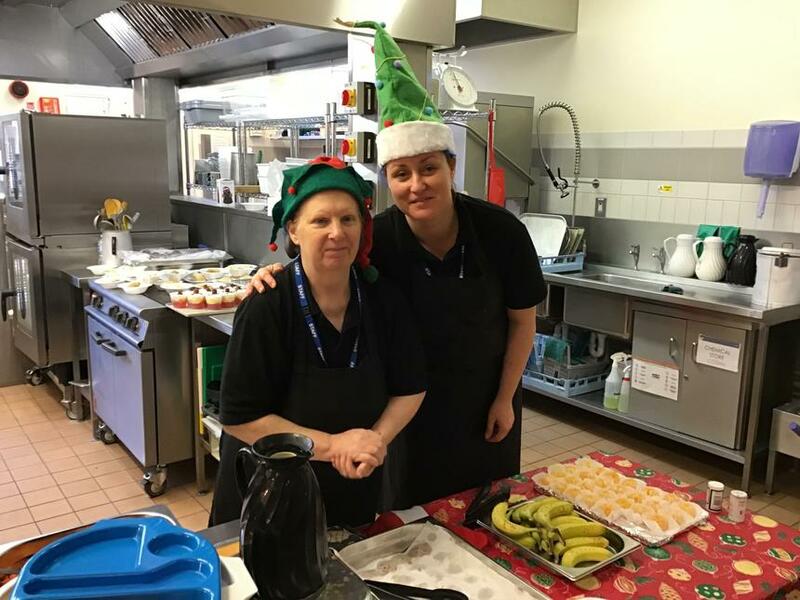 FRIENDS of Cardinal Road organised stalls to entertain the waiting children and members of staff joined in to make the visit one to remember! 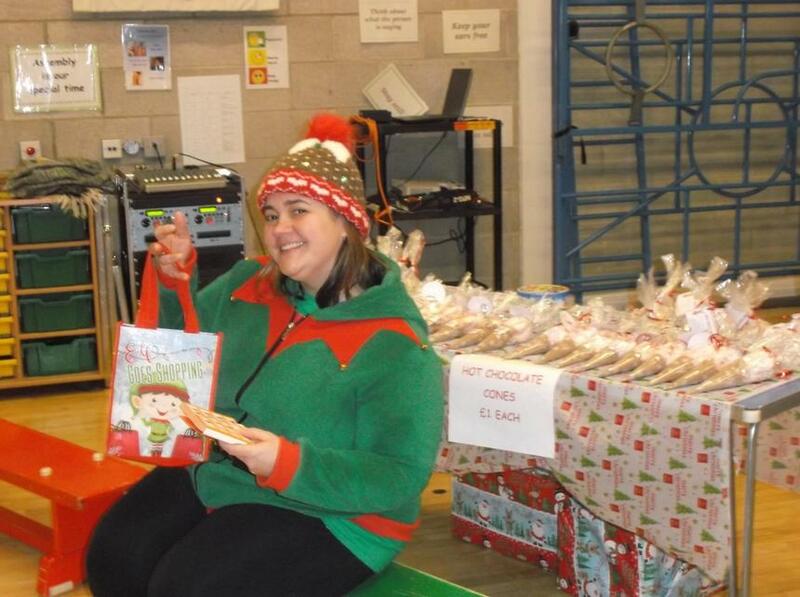 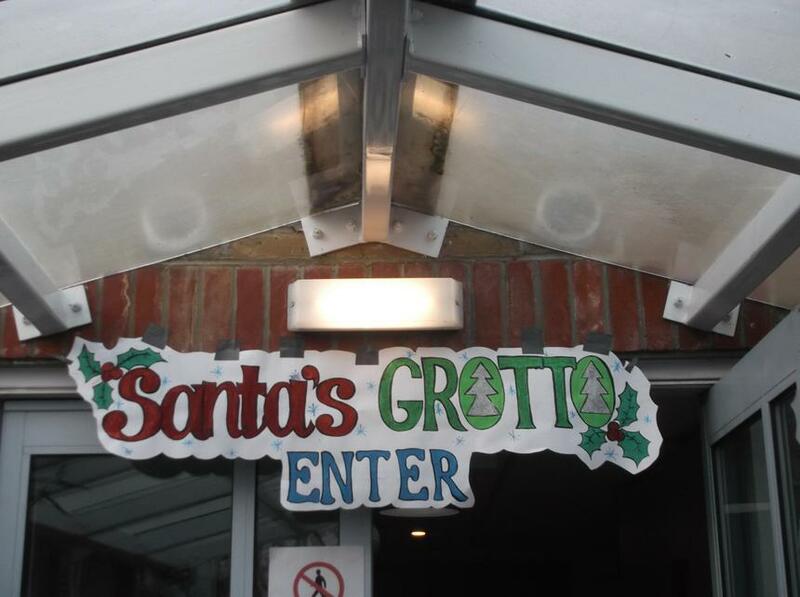 A big thank you in particular to Rachel and the FRIENDS Committee for all their hard work collecting donations, making gifts to sell, decorating the Grotto and manning the stalls during the three different after school events. 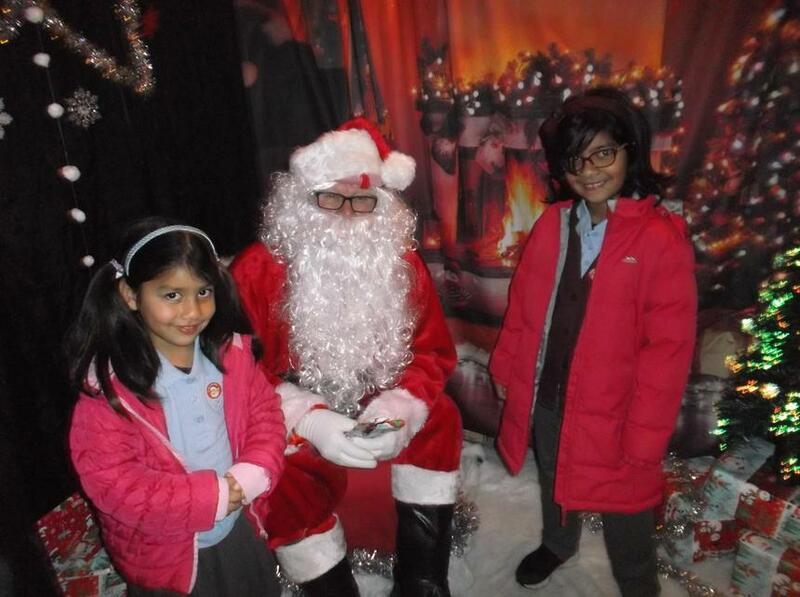 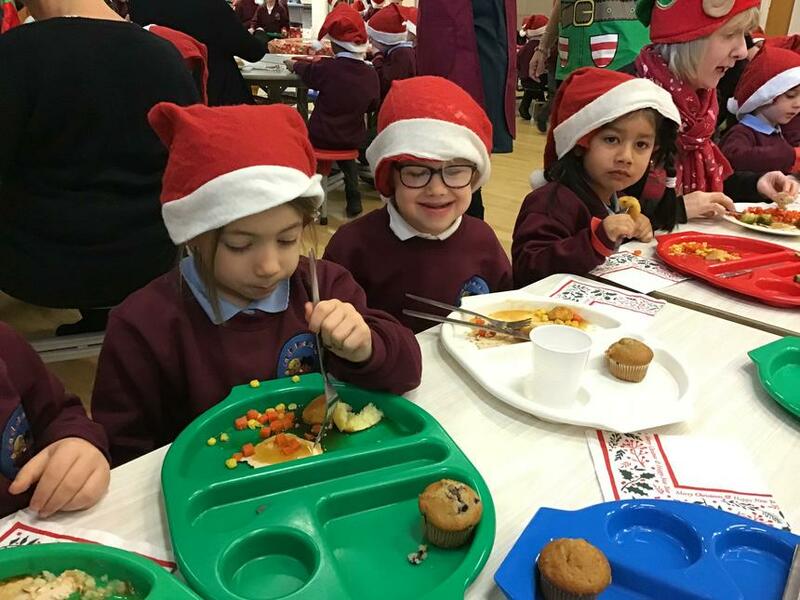 This event linked to all three of our school drivers, with children experiencing the value of giving as well as receiving (Emotional Literacy), enjoying a visit to Father Christmas that they were still buzzing about the next day (Real Life Experiences) and the wonderful sense of community that was evident with families coming together to celebrate Christmas in the hall (Community). 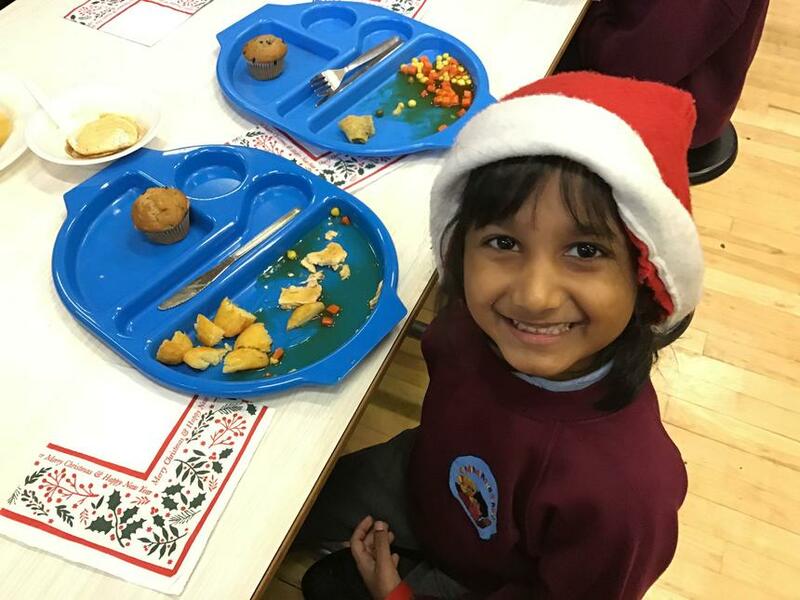 Christmas comes to Cardinal Road! 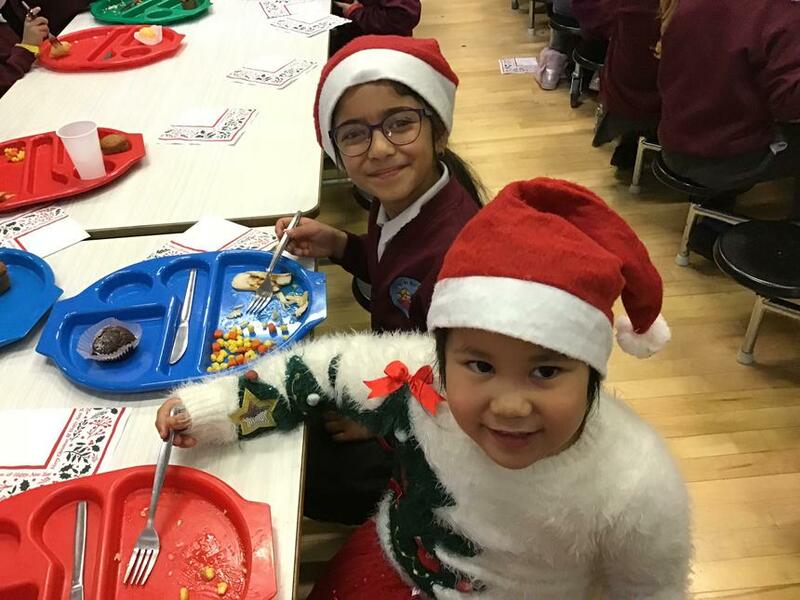 True to our Cardinal Road tradition the school was transformed on the first of December, using hoops decorated by children from each class to create a beautiful scene in the walkway, hall and Nursery. 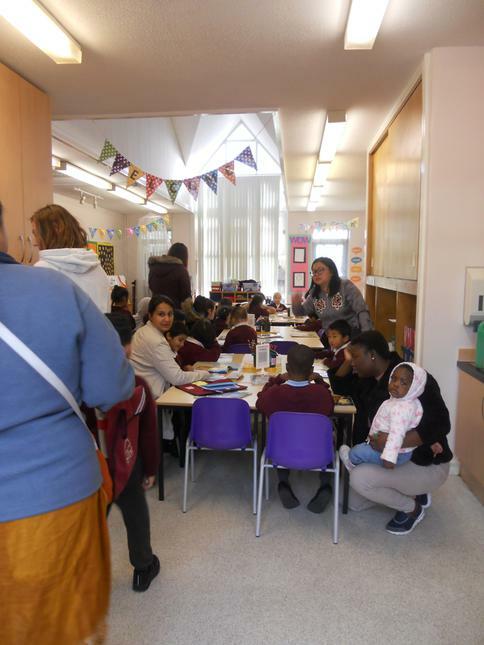 FRIENDS of Cardinal Road Volunteer Morning. 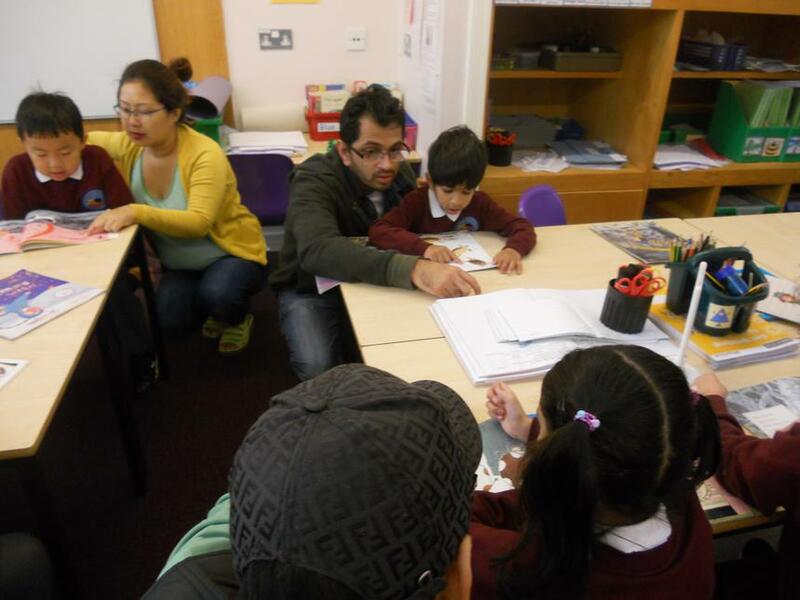 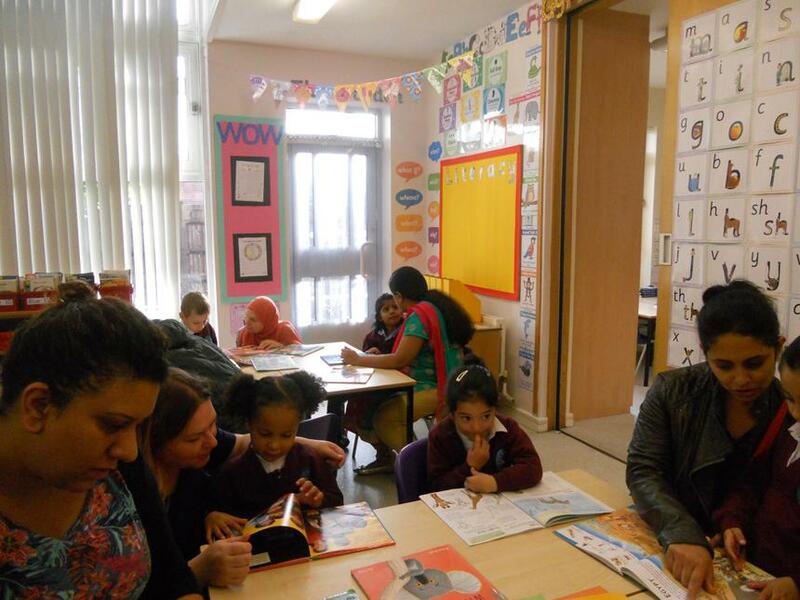 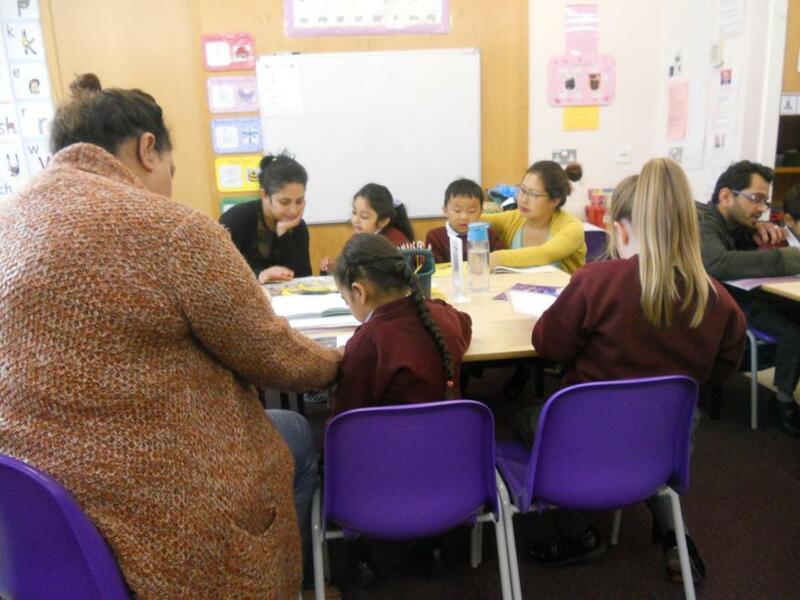 We are really grateful to our wonderful volunteers who came into school on Thursday 18th October. 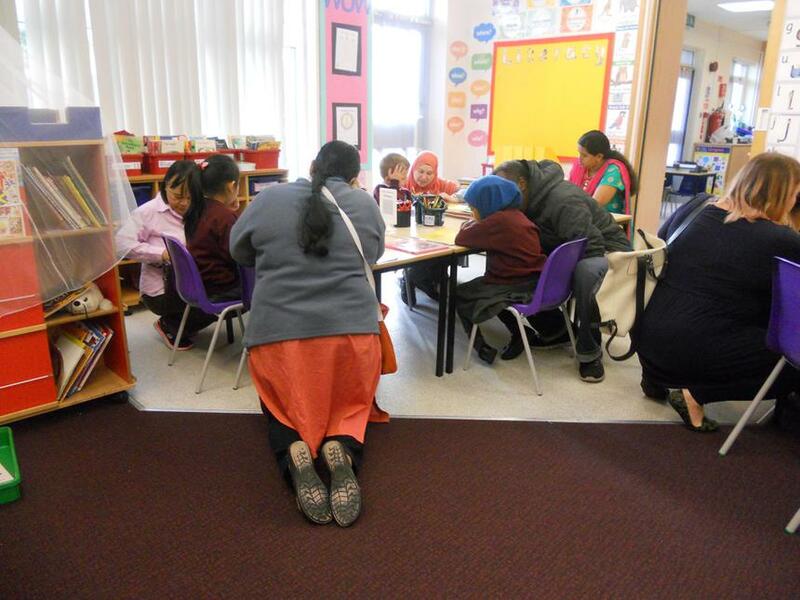 They all worked together to plant up many different containers with winter pansies, while another team took on the task of repainting the planting tyres. 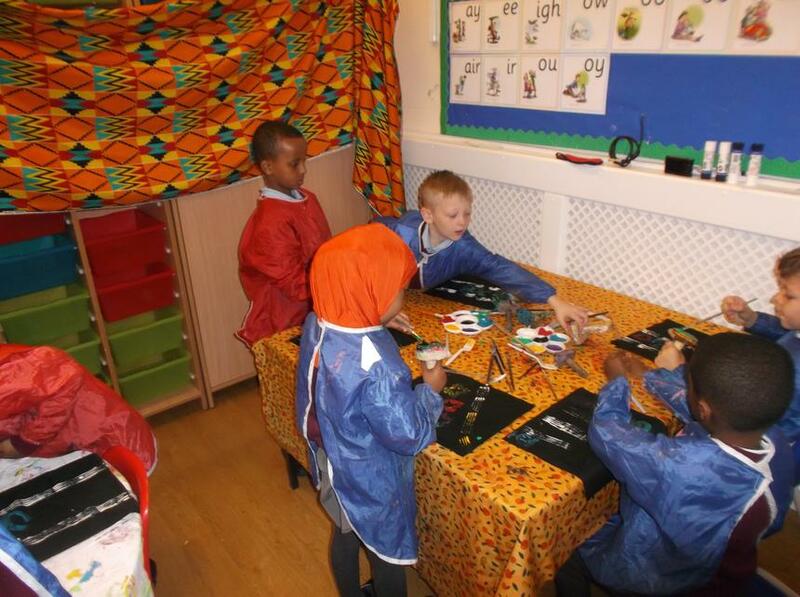 The school environment now looks colourful and attractive and the pupils were really excited by the beautiful flowers that had "magically appeared" while they were busy learning that morning. 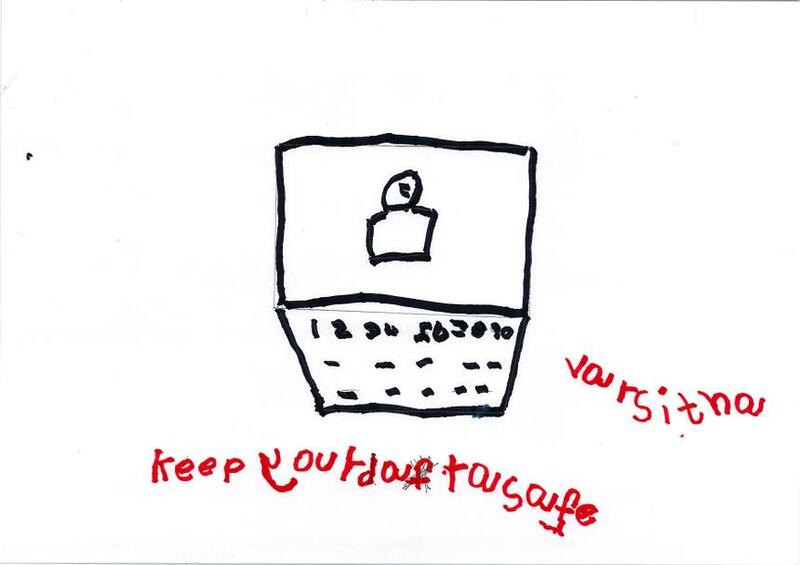 Thank you for supporting us and working so hard. 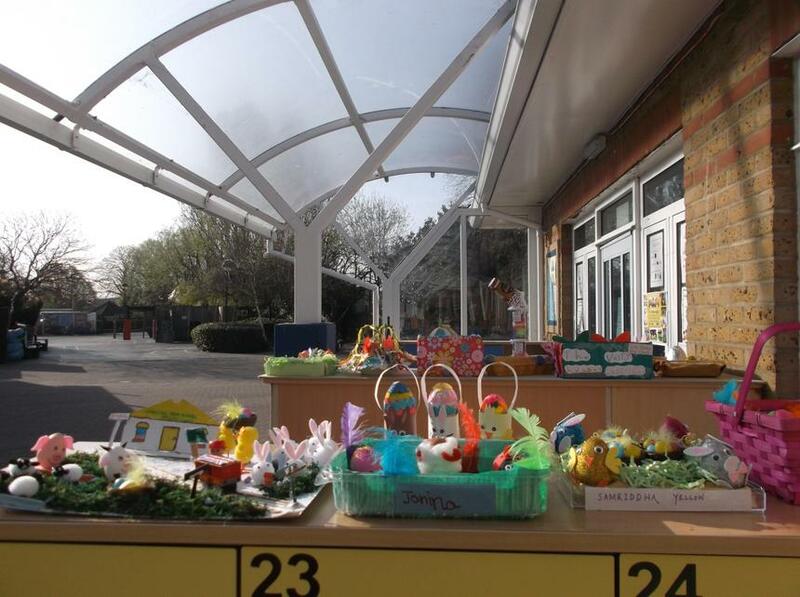 We are really looking forward to seeing all of the plants grow through the next few months; many hands really do make light work! 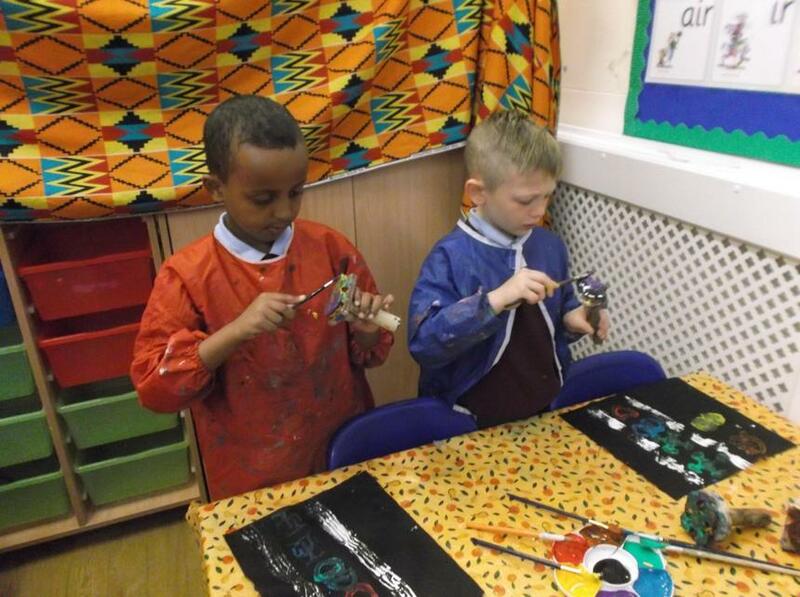 CARDINAL ROAD BLACK HISTORY WEEK. 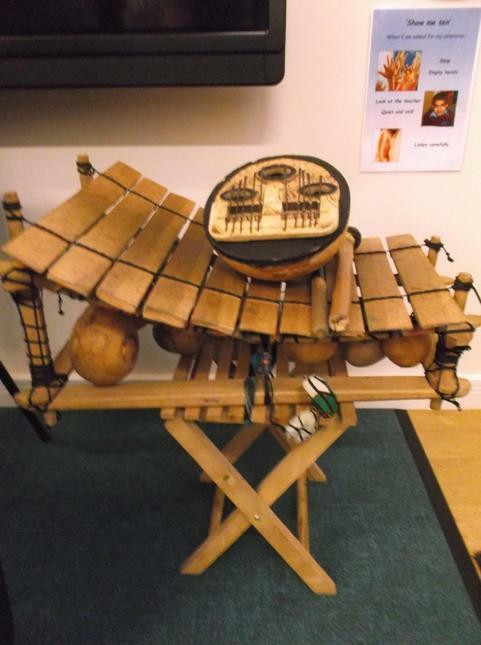 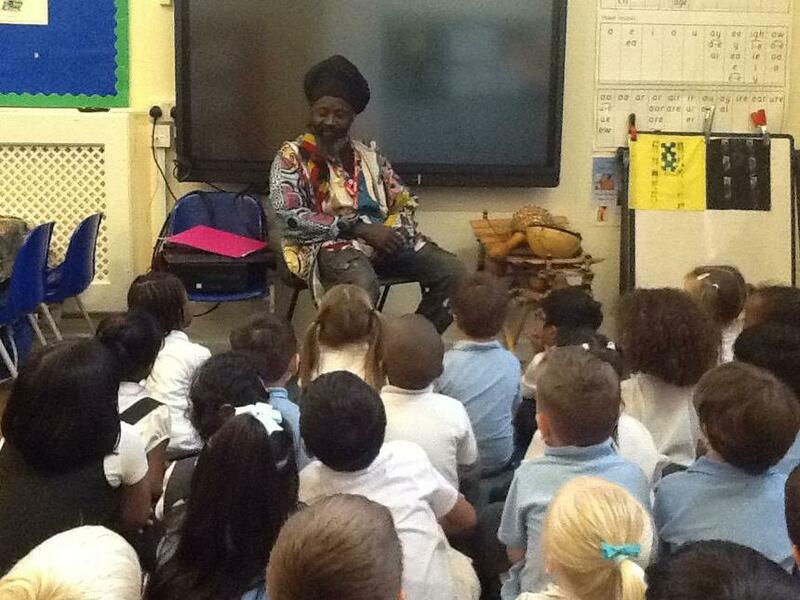 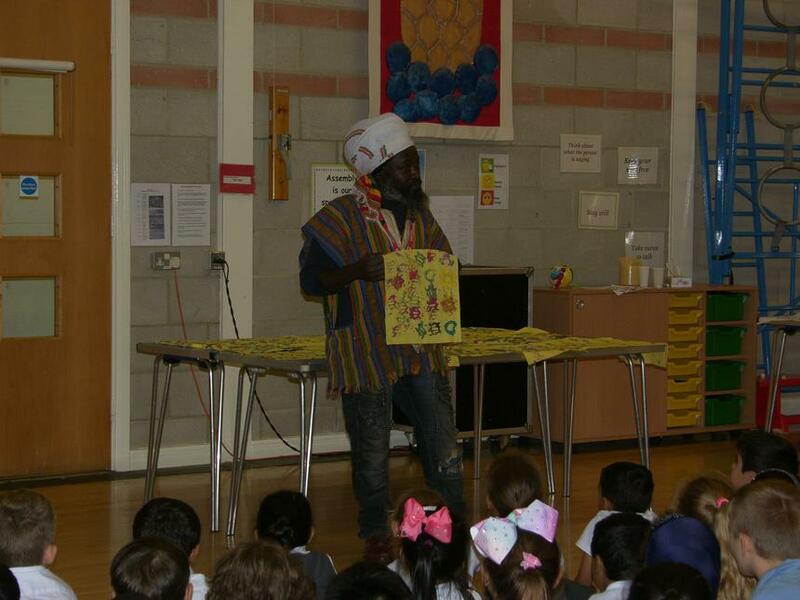 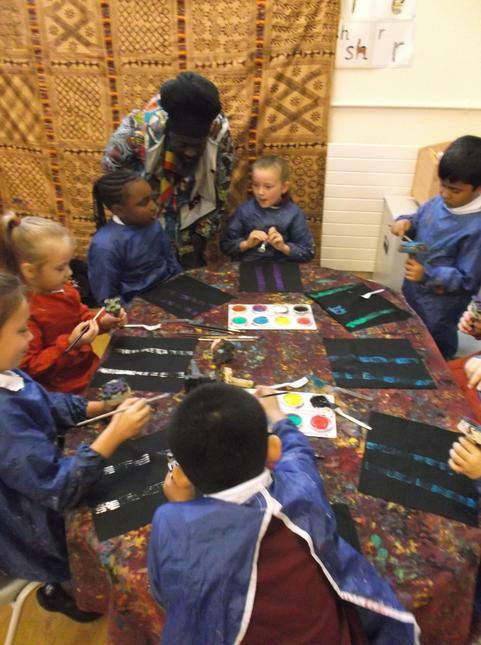 As part of our Black History Week Cardinal Road had a very special visitor from Ghana in Africa! 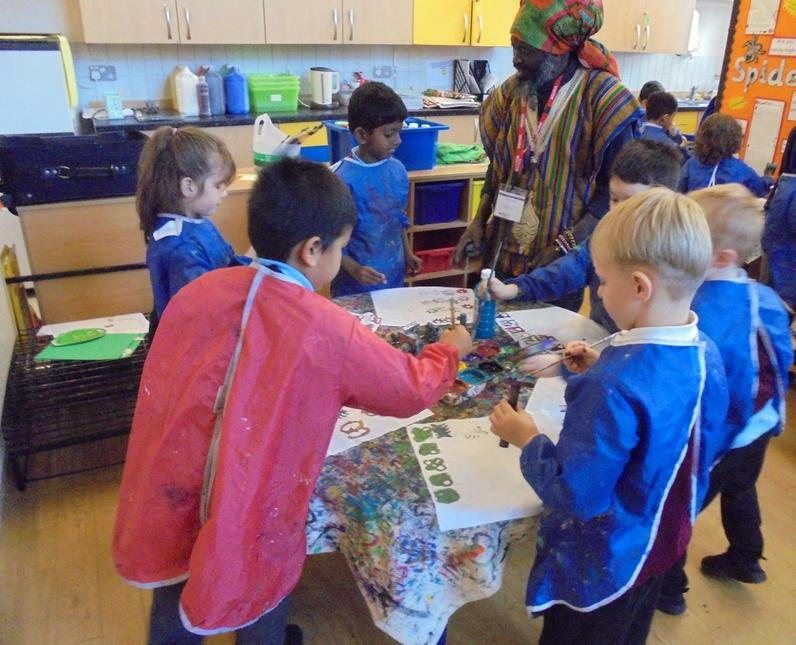 Kwame spent two days at school running a series of Art Workshops based on the traditional kente cloth patterns, as well as entertaining children with his drumming and instruments. 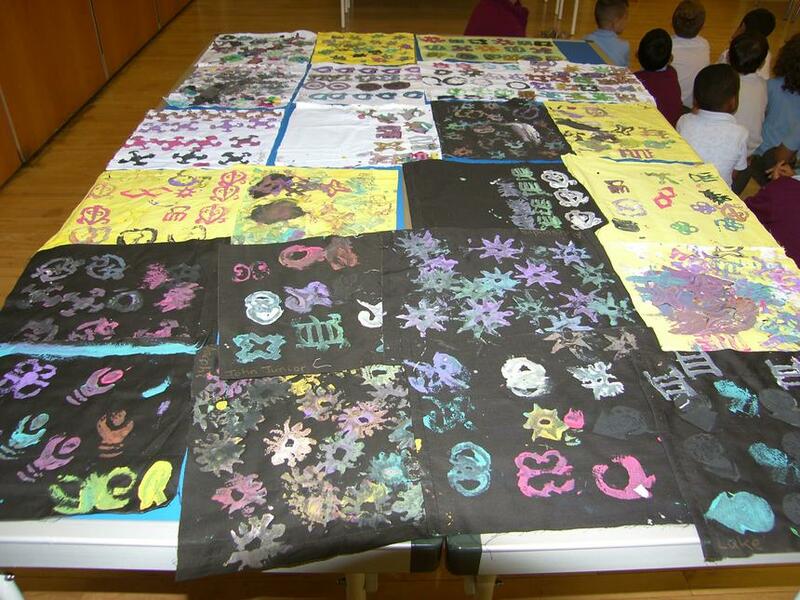 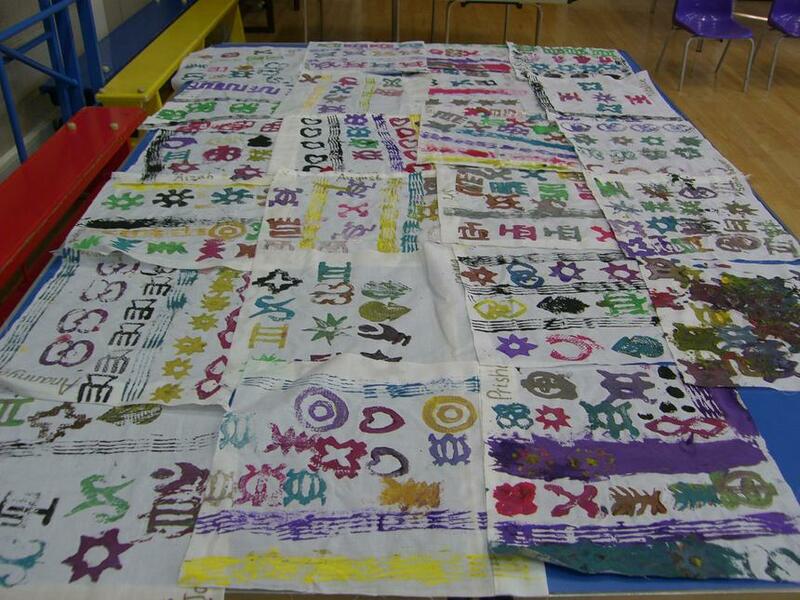 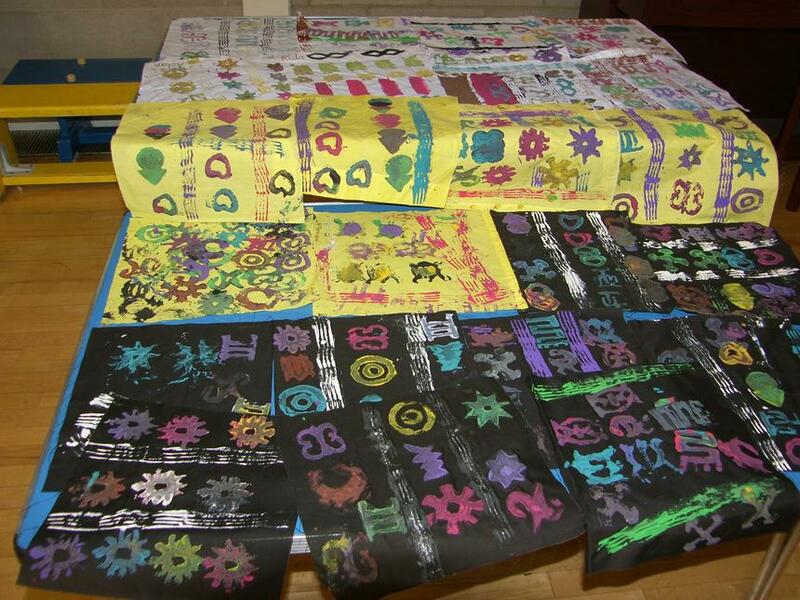 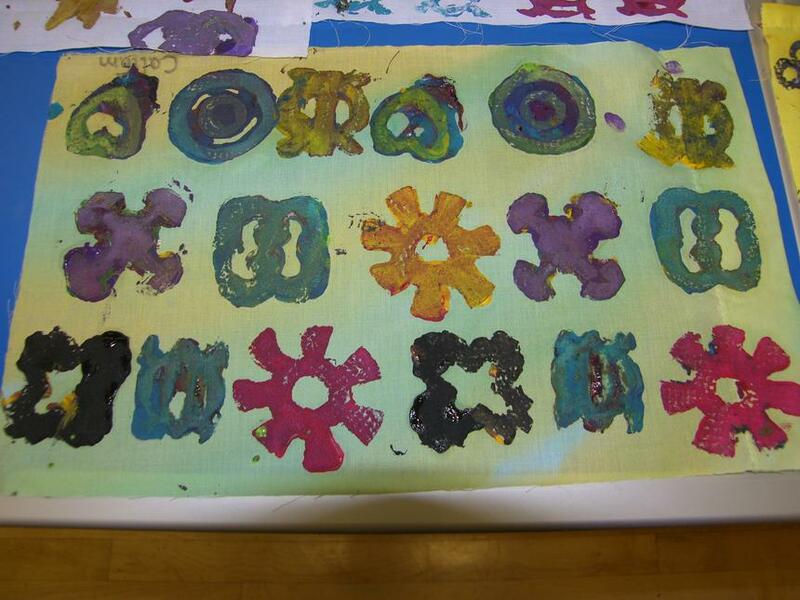 Children loved hearing the stories behind all of the printing symbols that they were using and parents had the chance to see all of their hard work with an art exhibition in the hall at the end of the last day. 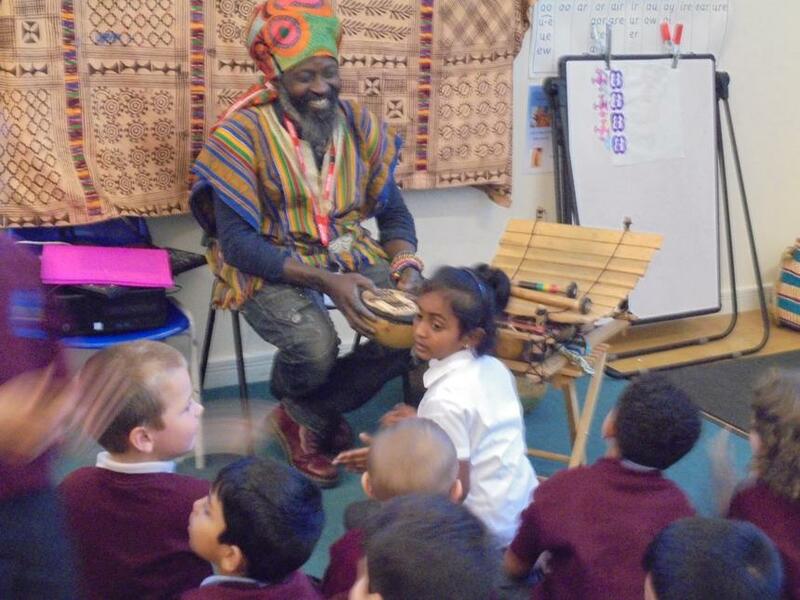 Medaase (thank you) Kwame! 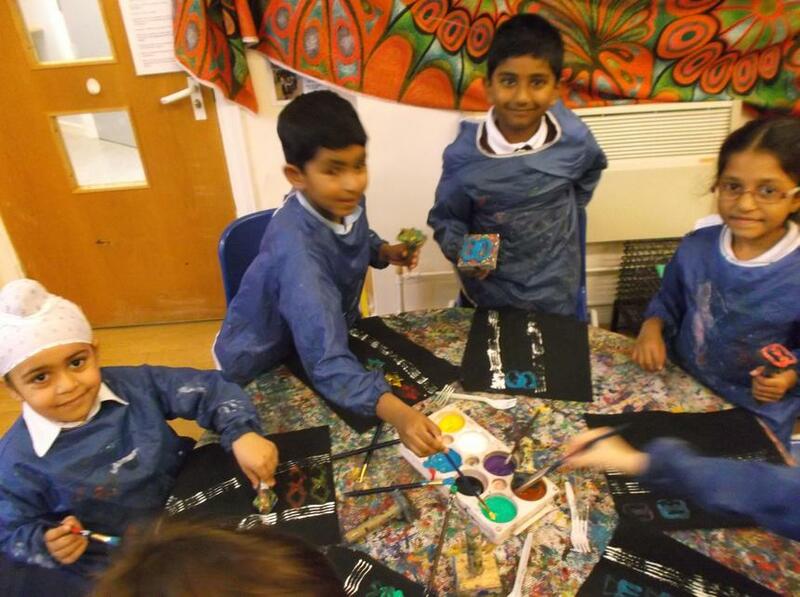 Look out for the colourful collages on display next time you visit the school hall. 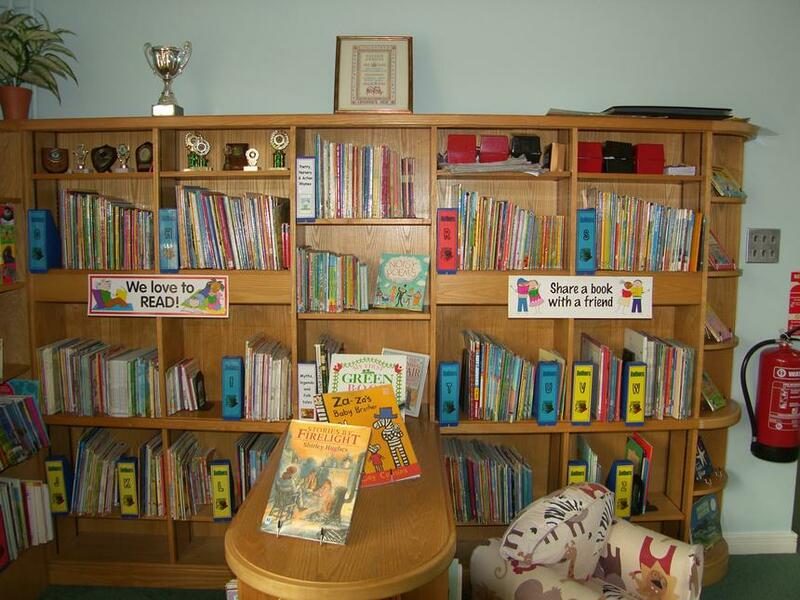 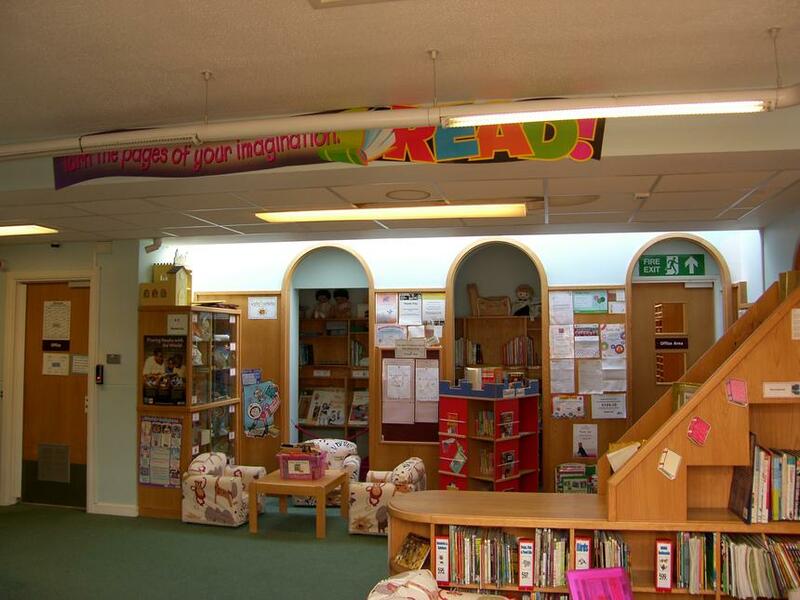 READ ALL ABOUT IT- LIBRARY RELAUNCH!! 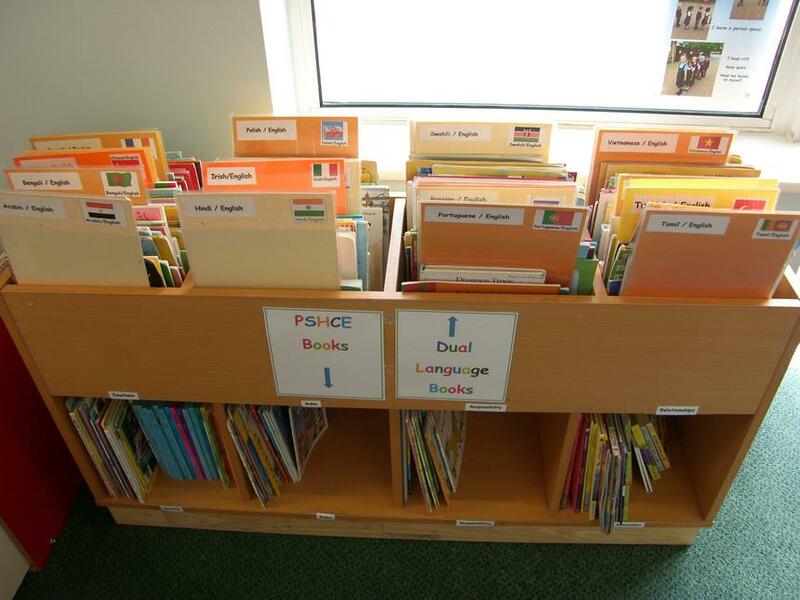 Over the past few months Mrs Dale and other staff members have undertaken the enormous task of auditing, sorting and organising all of the library books in the school, so that they could be classified in a way that makes it really easy for pupils and staff to find the books that they are looking for. 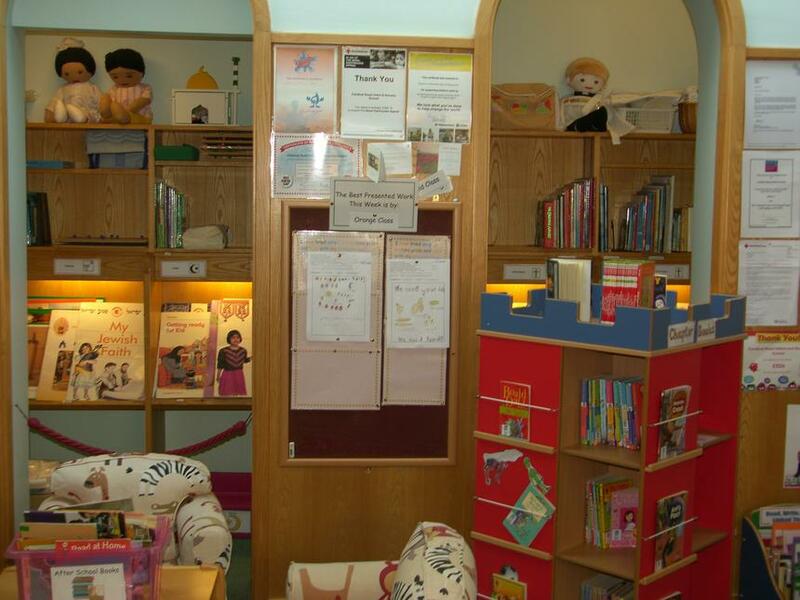 We are pleased to announce that the new library facilities are now... OPEN! 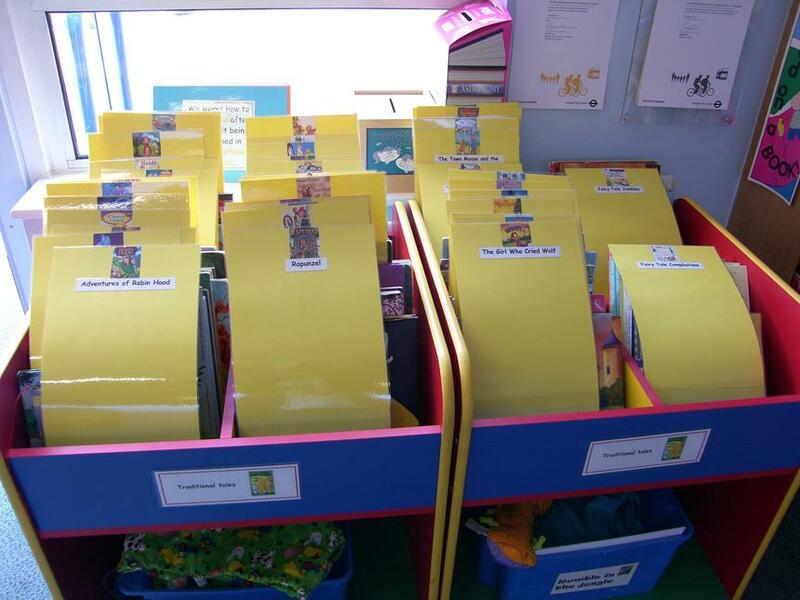 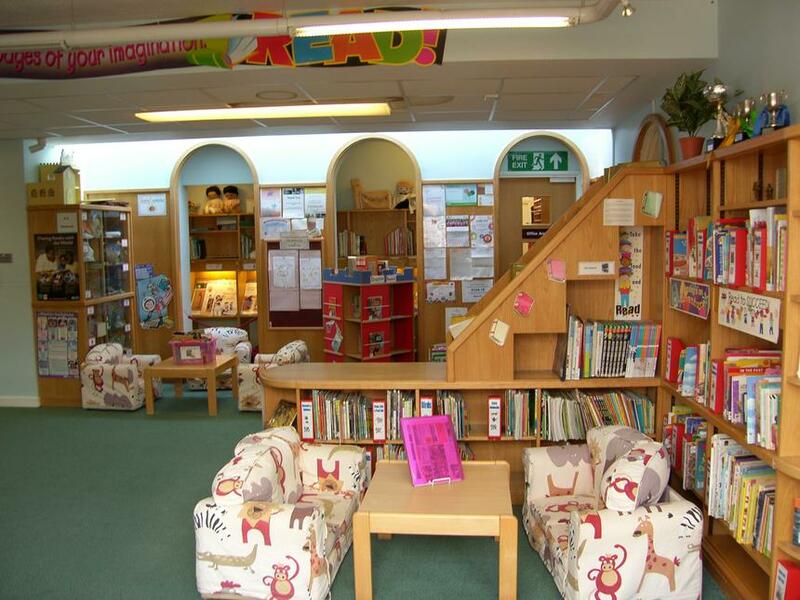 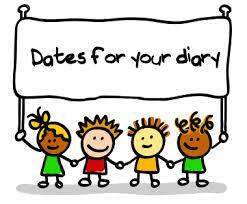 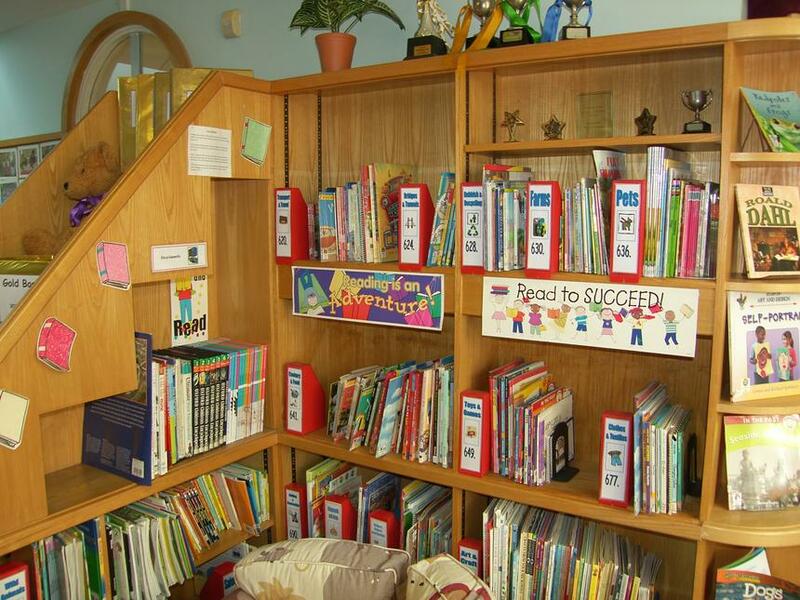 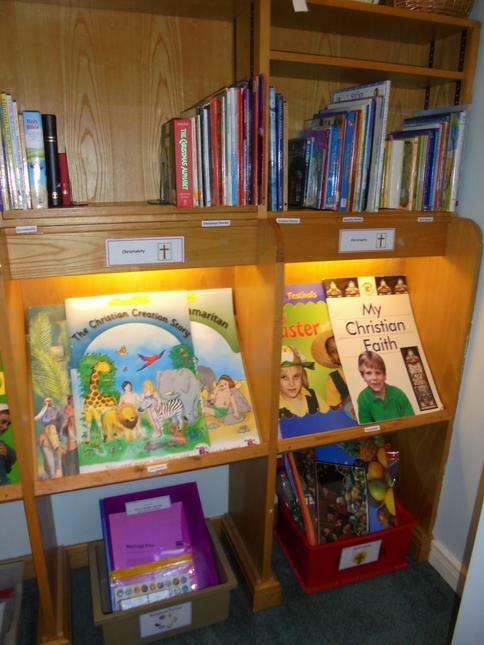 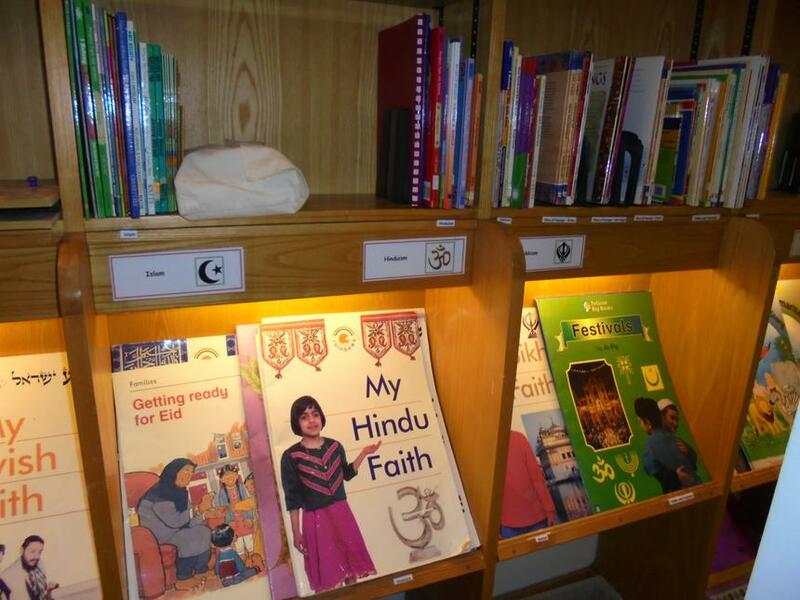 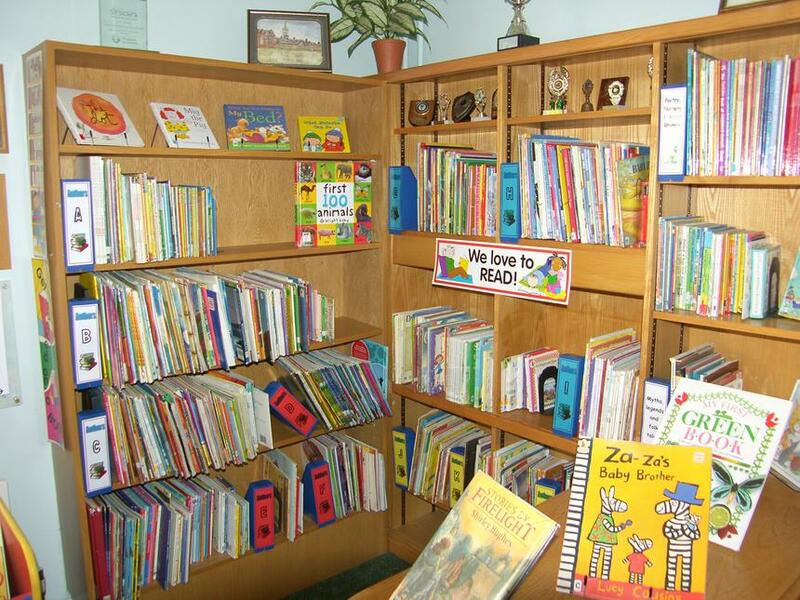 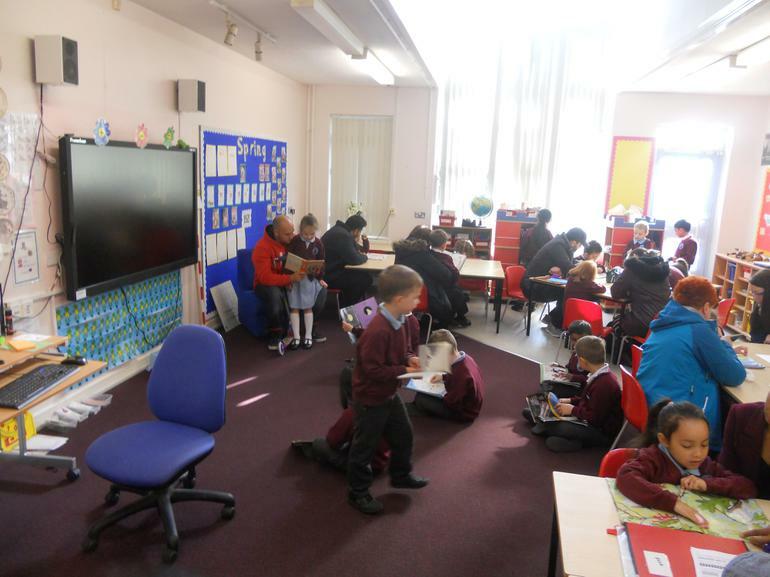 As well as using the library during school time Year 2 will begin borrowing a book a week to take home after half-term and Year 1 will also have this opportunity later in the year. 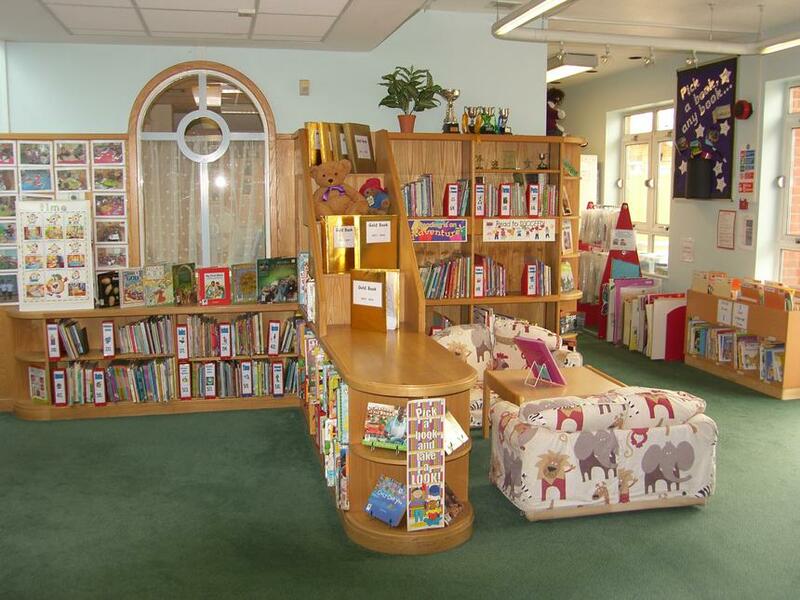 An enormous thank you to Mrs Dale for all of her hard work, watch this space for Library Monitors, who will share the responsibility of keeping our beautiful library well organised and tidy. 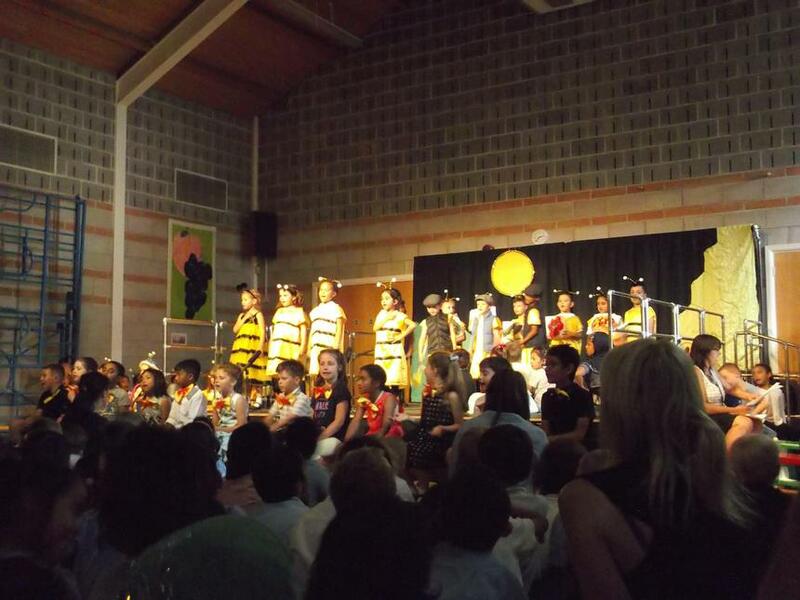 The school community came together to celebrate Harvest on October 10th. 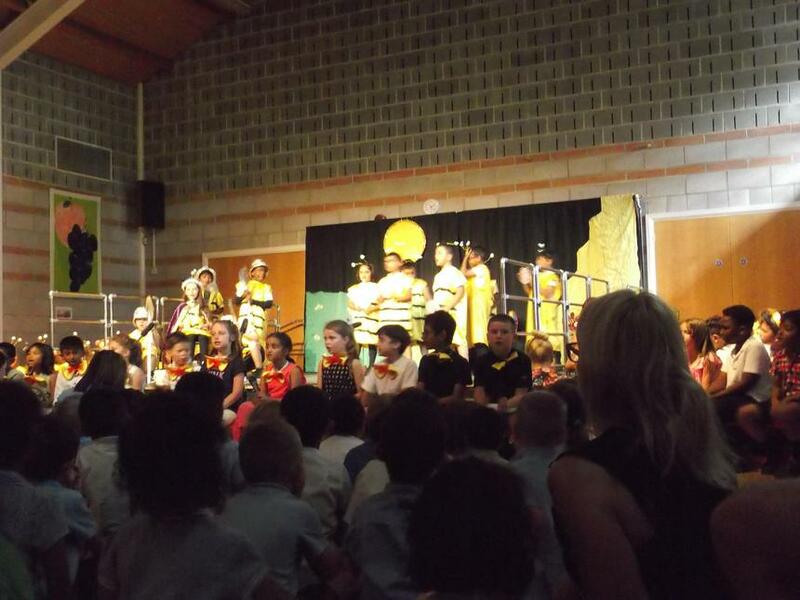 Year 1 and 2 children performed to an absolutely packed hall, with the generous donations of food and items displayed behind them. 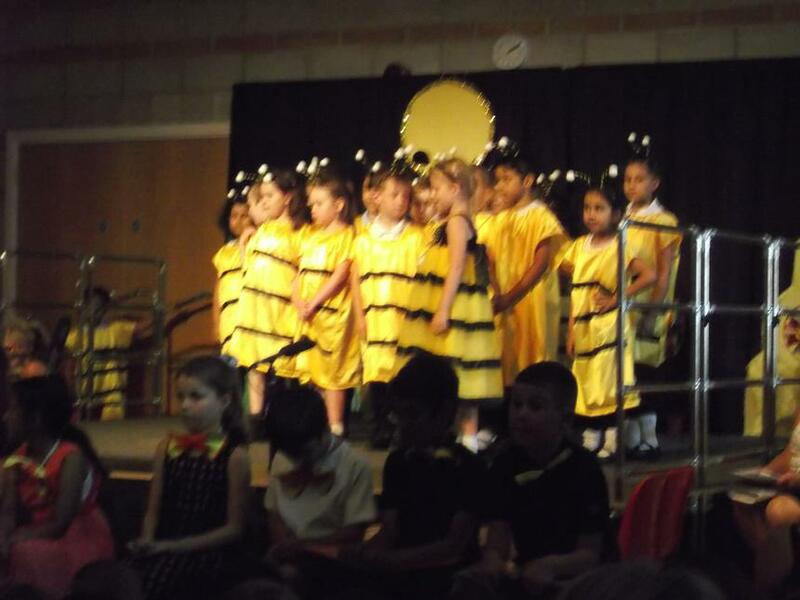 Each class presented a poem, song or piece and Year 2 readers gave the audience useful information, as well as giving thanks for the food that we are lucky enough to enjoy. 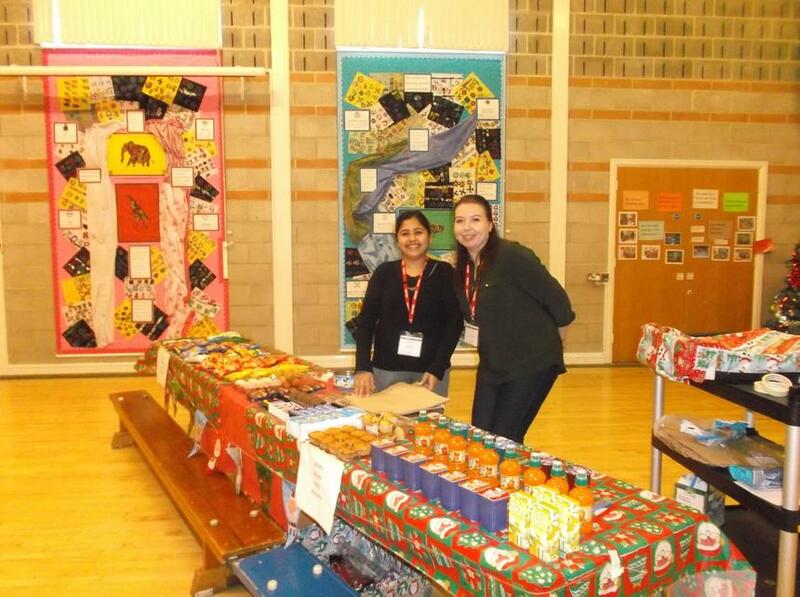 The harvest donations were then collected by Riverside Vineyard Church to be distributed to families in need. 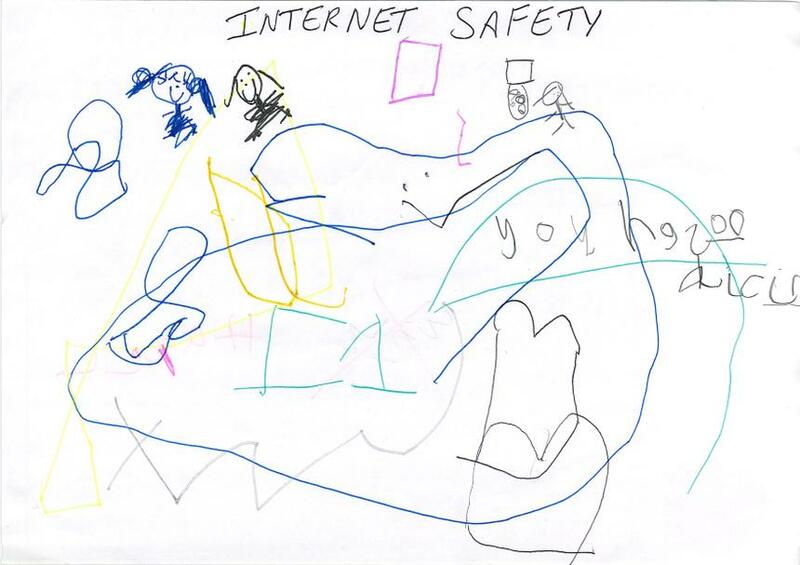 Thank you very much for all of your contributions. 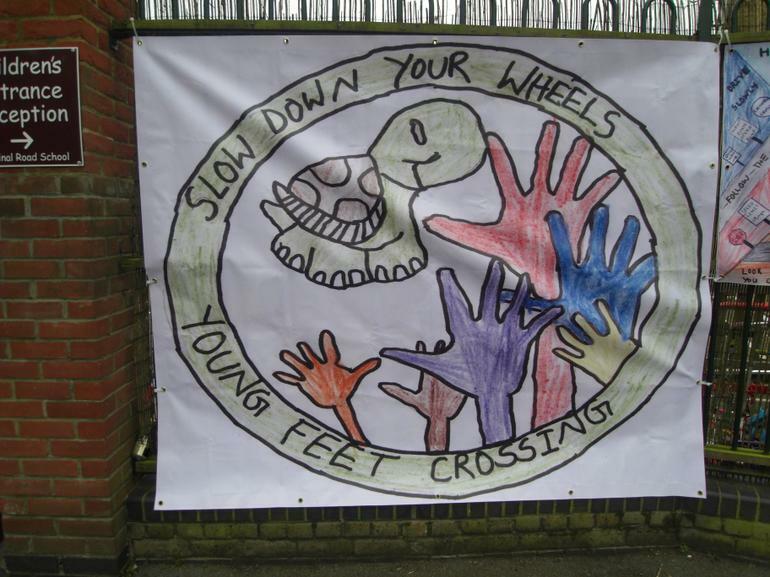 Again this event links to all three of our School Drivers: Real Life Experience, Community and Emotional Literacy. 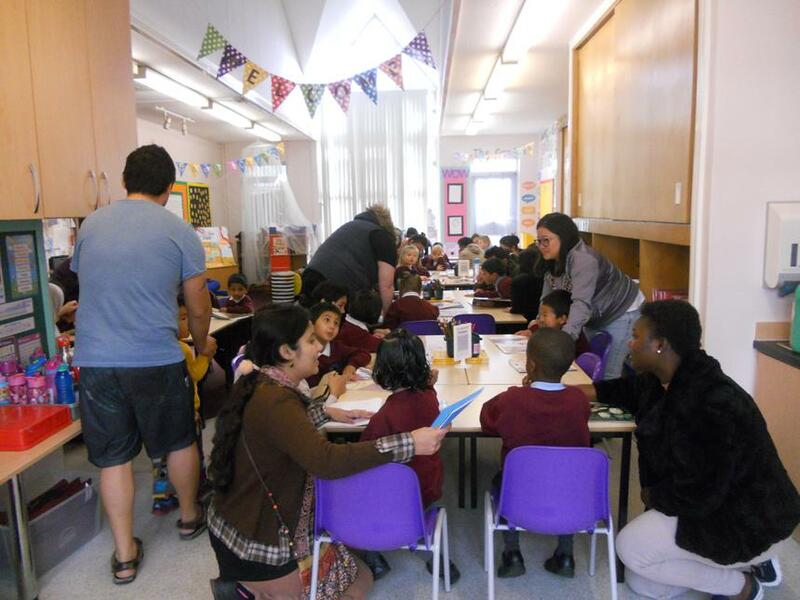 Year 2 started the new year with a fantastic coffee morning in September to raise money for MacMillan Cancer Support. 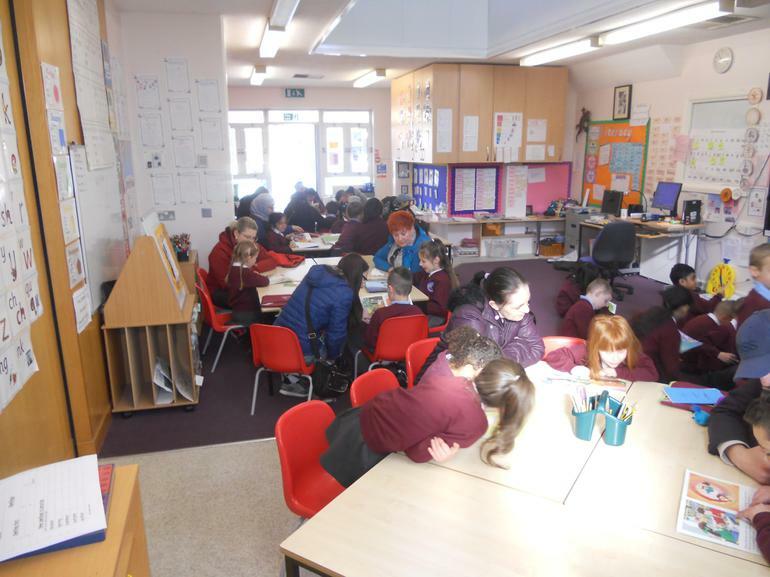 The children drew up posters to advertise the event, baked cakes and jam tarts and practised their mathematical skills, so that they could collect the right money and give out change. 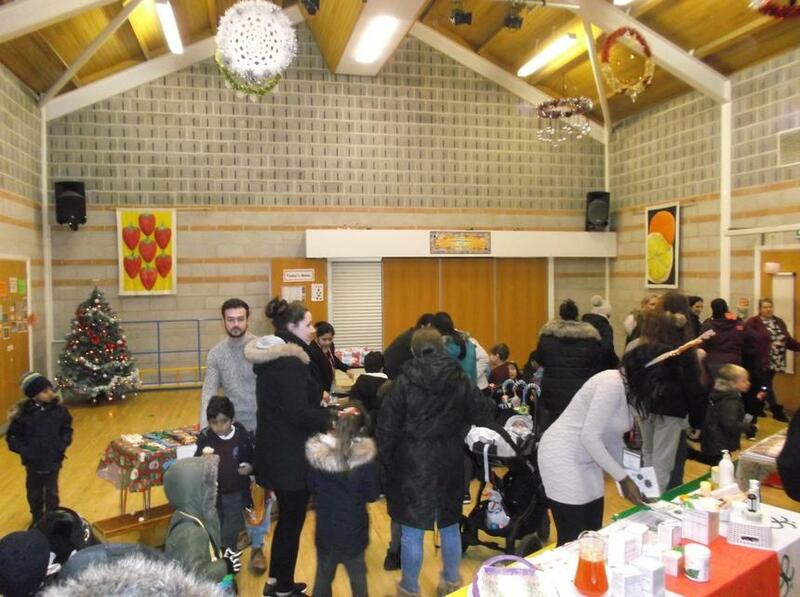 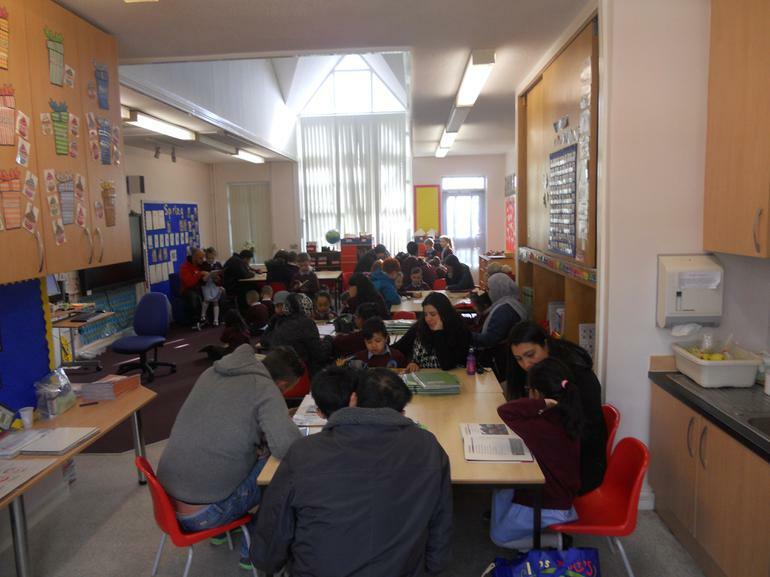 Parents and carers filled the hall and it was a really lovely social way to start the day. 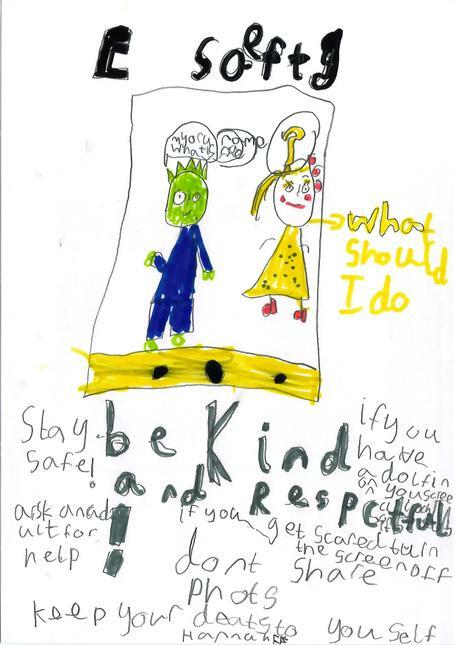 Huge congratulations to Year 2 who raised £ 198.58 and showed how our half-term focus "Be kind" could be put into action. 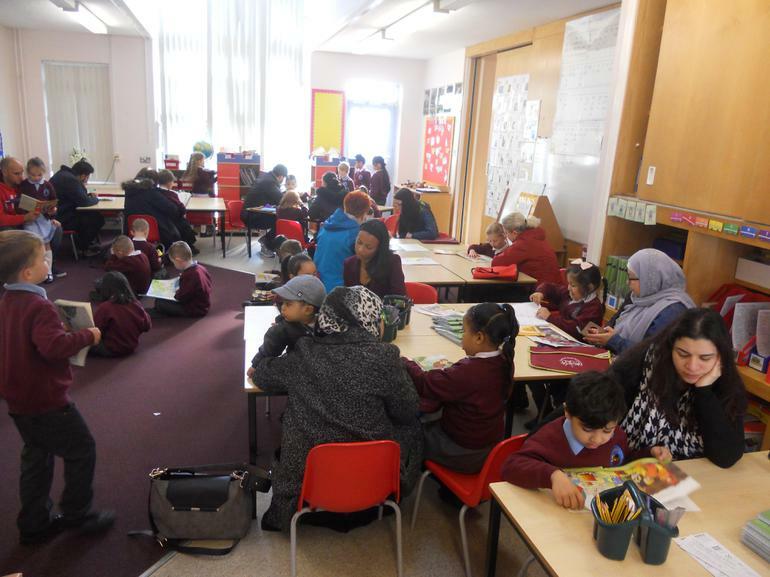 This event also links to all three of our School Drivers: Real Life Experience, Community and Emotional Literacy. 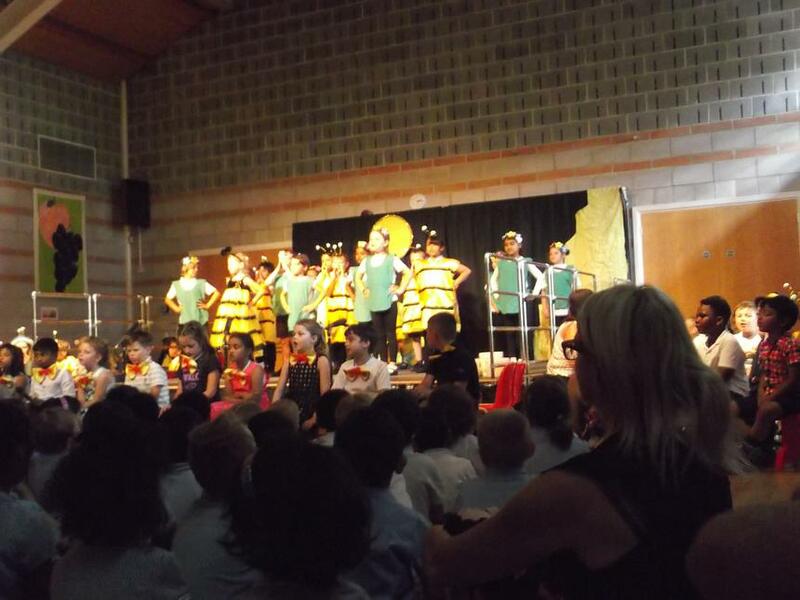 During the last week of term Year 2 said goodbye to Cardinal Road with an amazing show "The Bee Musical" which delighted and entertained audiences of children, (including Year 3 Victoria Junior School), staff, governors, parents and the community. 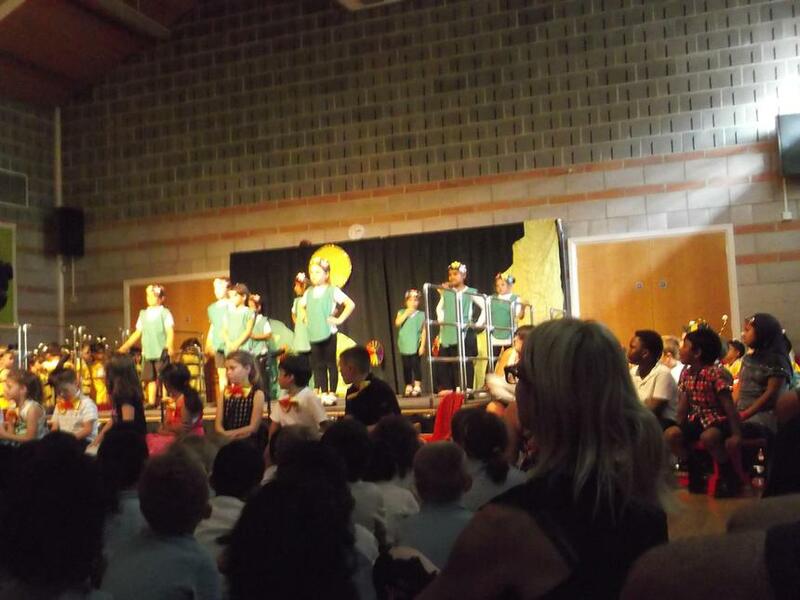 The performance ended with The Leavers Song and there was not a dry eye in the house! 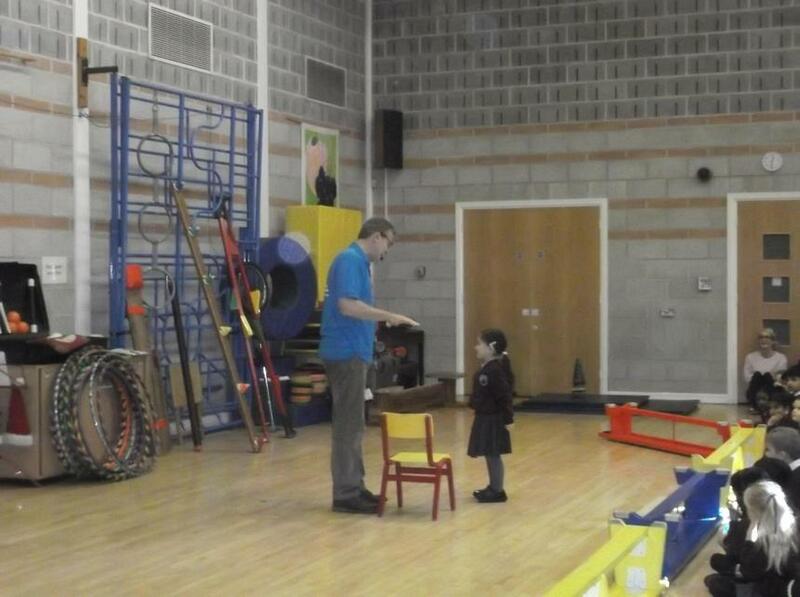 Governor Mr James then presented bookmarks for each Year 2 child. 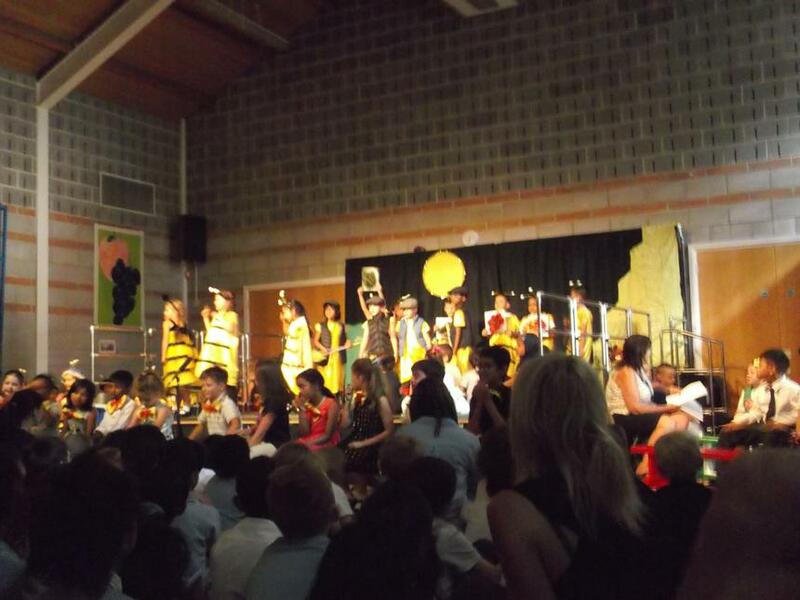 Thank you Year 2 we are really proud of you and good luck on your future journeys; remember to always Aim High! 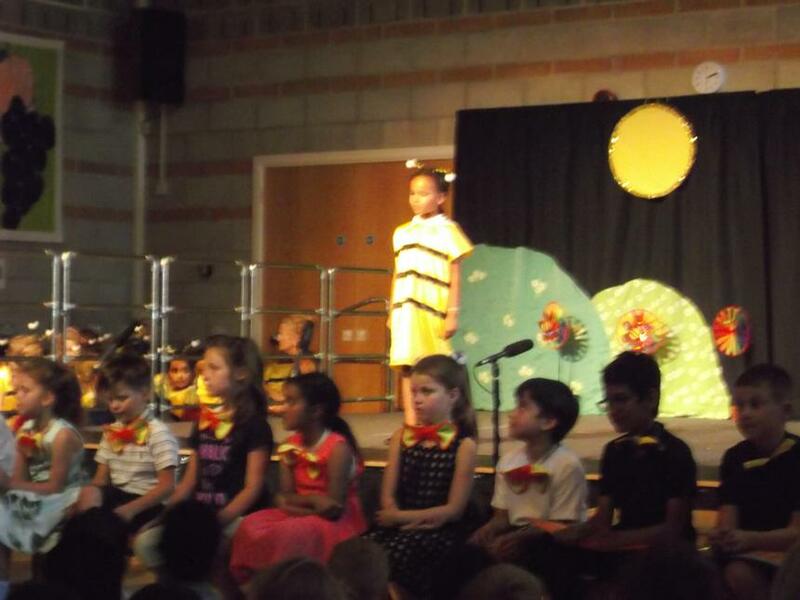 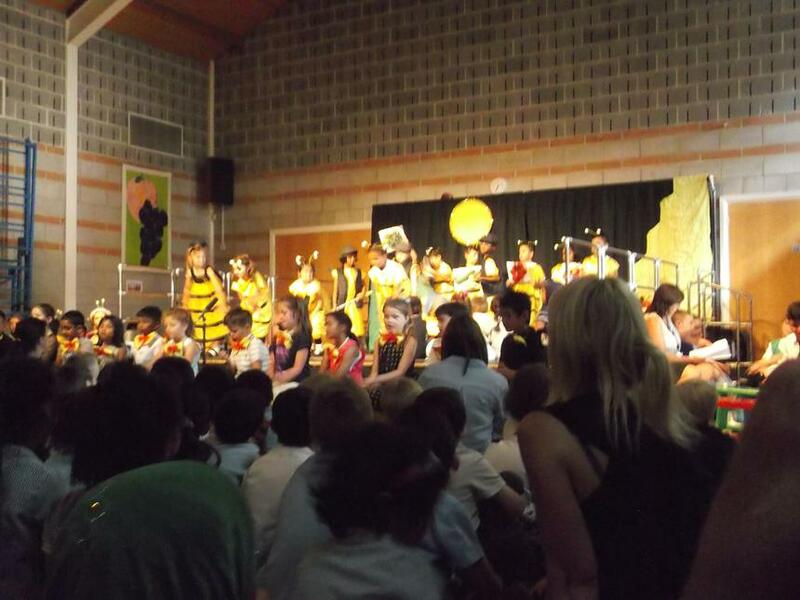 The "Bee Musical" by Year 2. 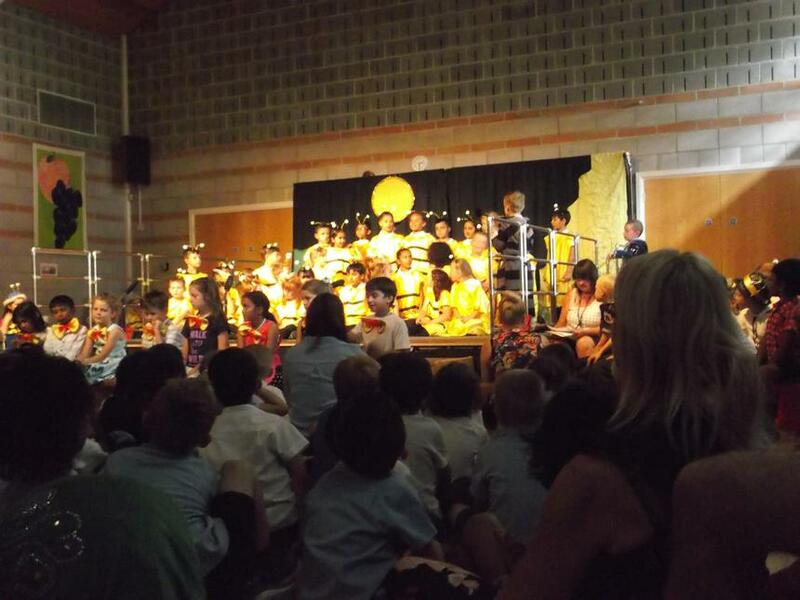 On Wednesday 11th July 2018 Reception, Year 1 and Year 2 were joined by the 30 hours Nursery children and the Speech and Language Workshop to watch an amazing production of "The Little Princess". 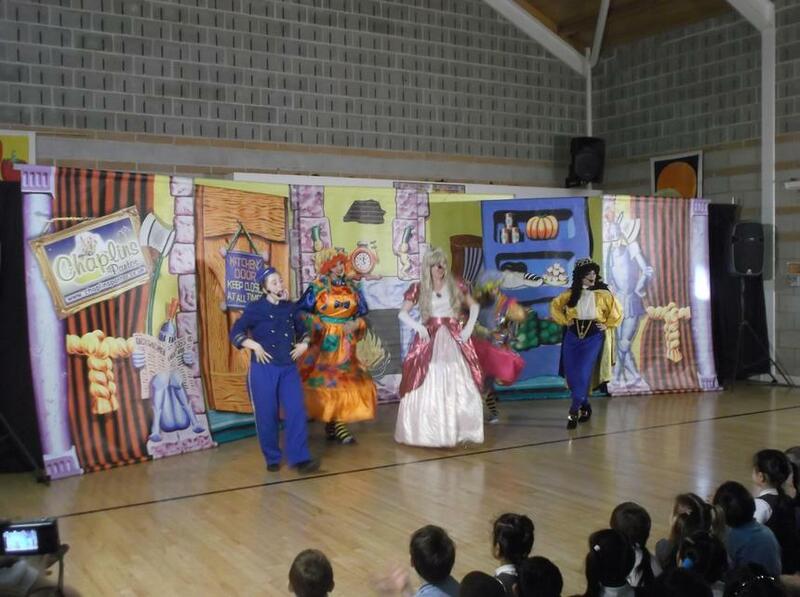 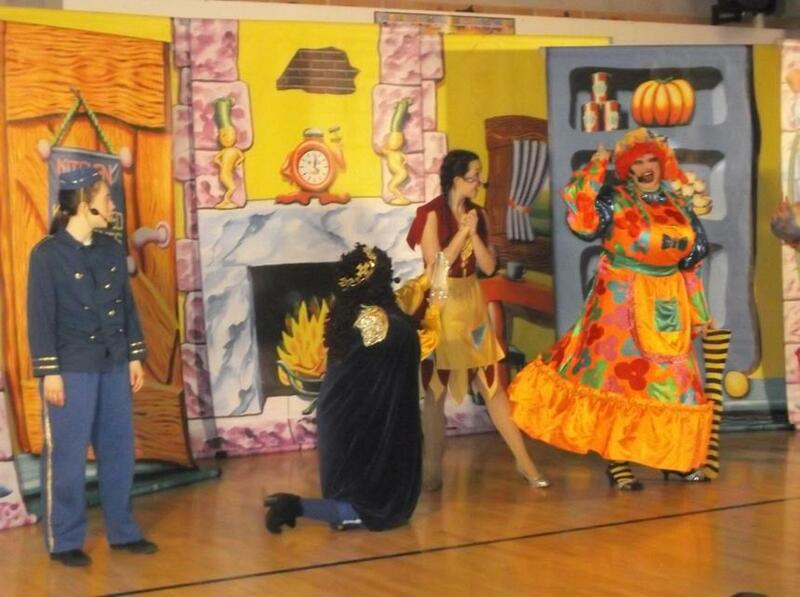 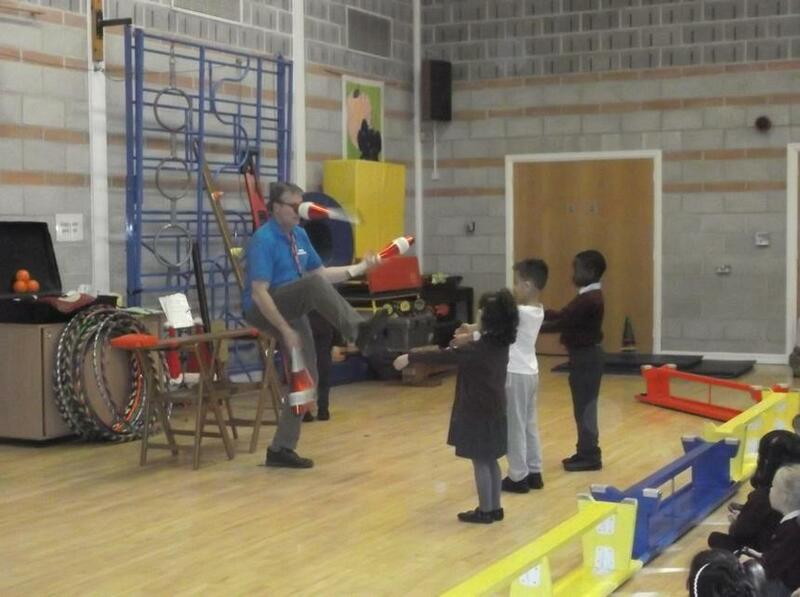 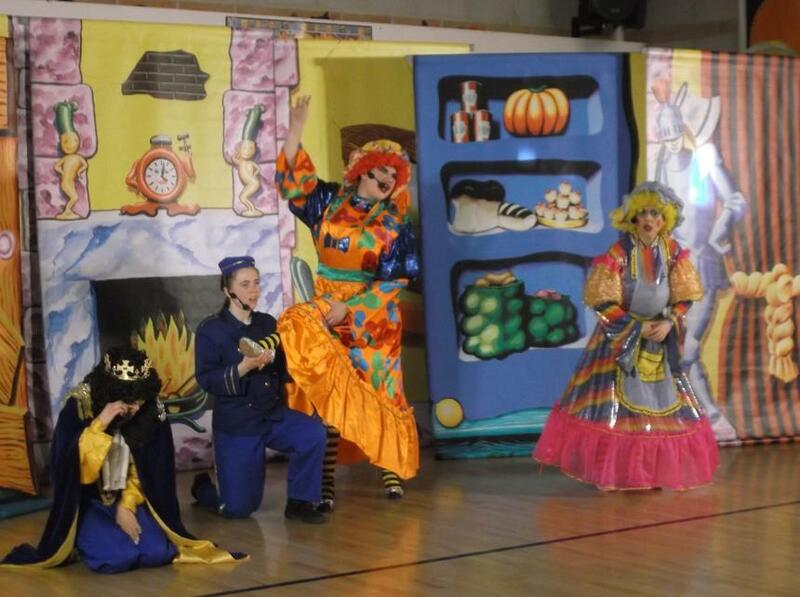 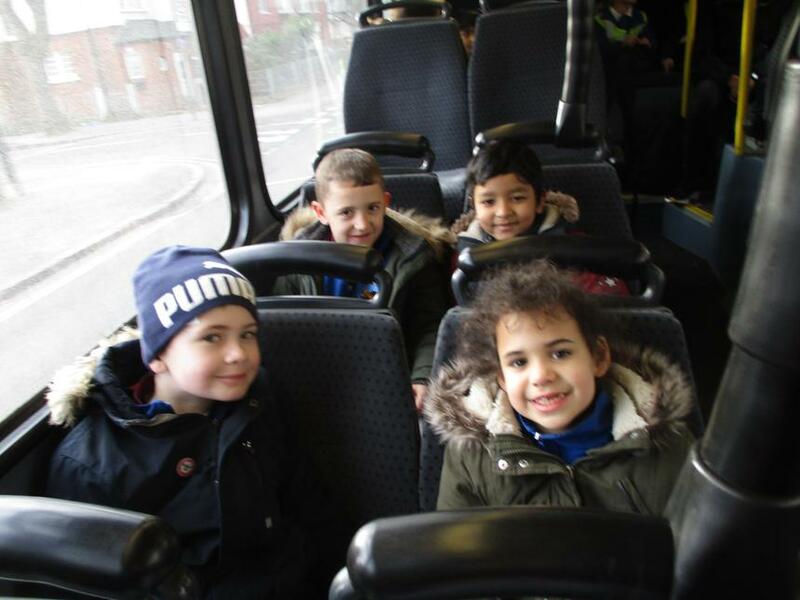 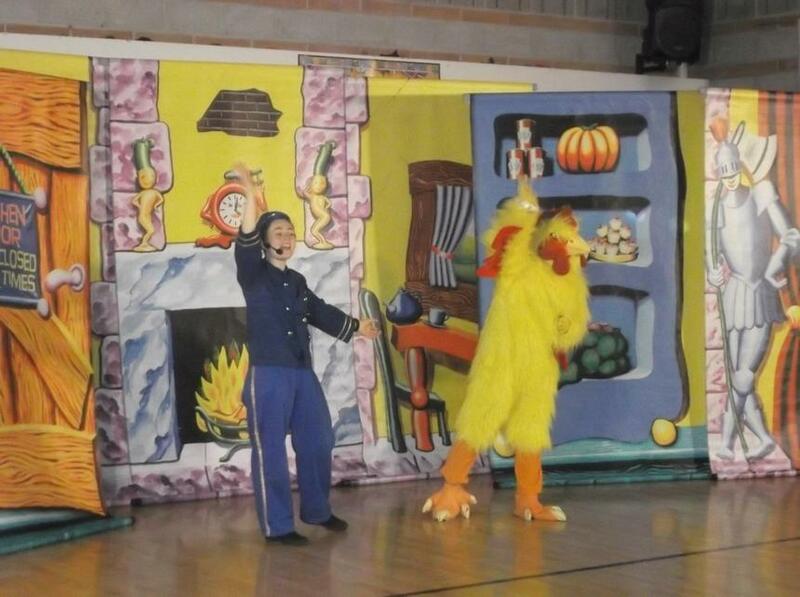 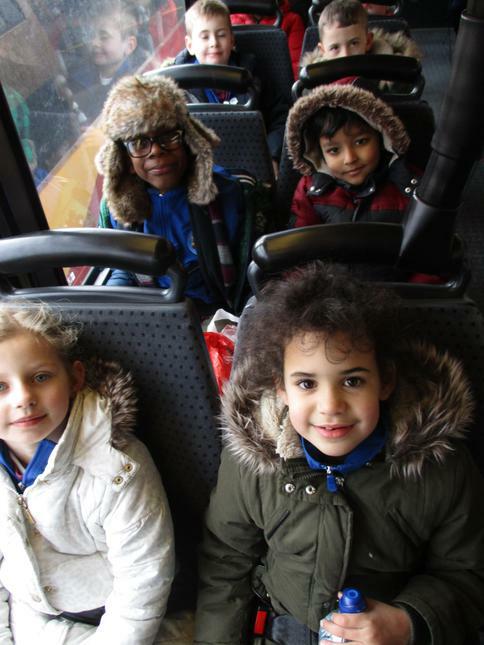 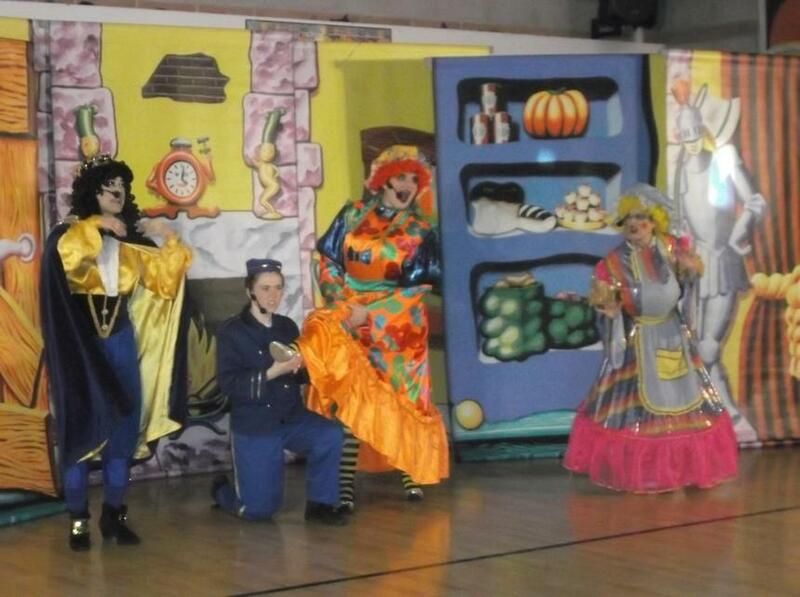 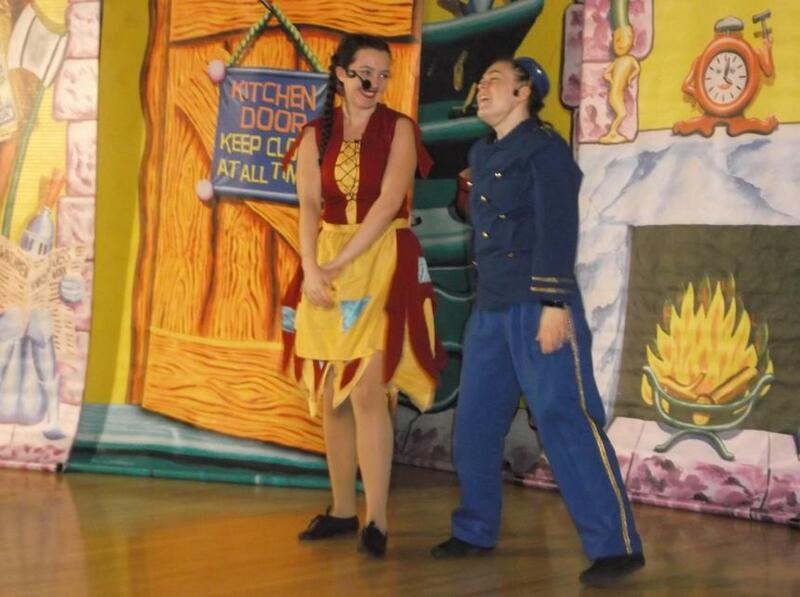 This was a great opportunity for all our children to experience some live theatre, some for the very first time. 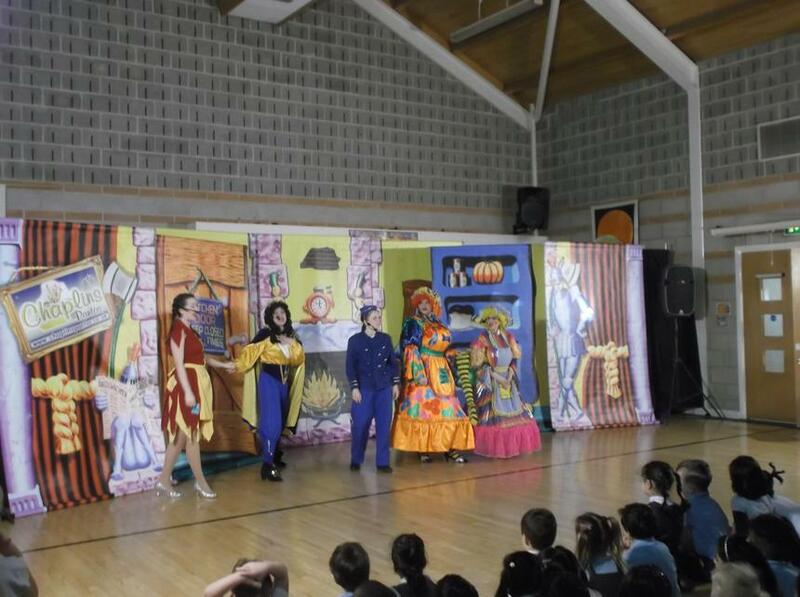 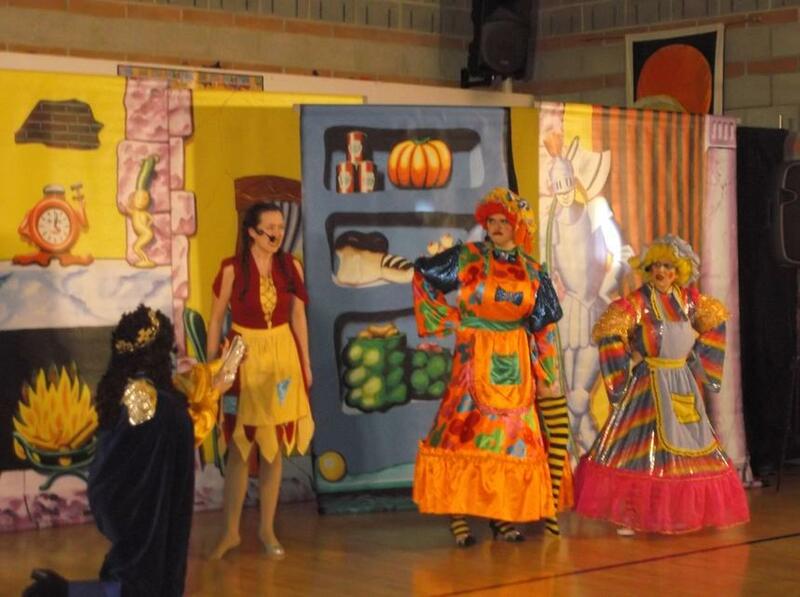 The lighting, set and sound effects wowed the children and the actors were really engaging as they played many different characters, with lots of costume changes and different accents. 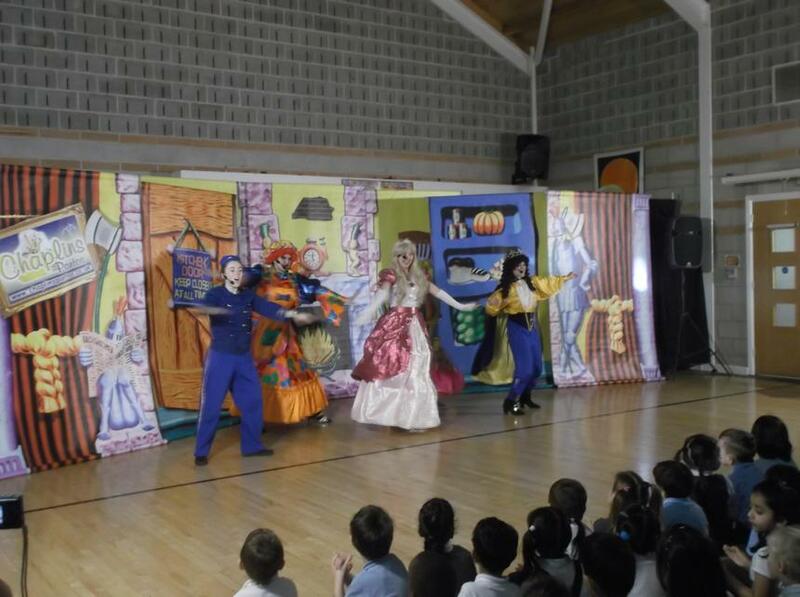 All the audience joined in with cheering on the good characters, booing the bad characters and singing along to some popular songs. 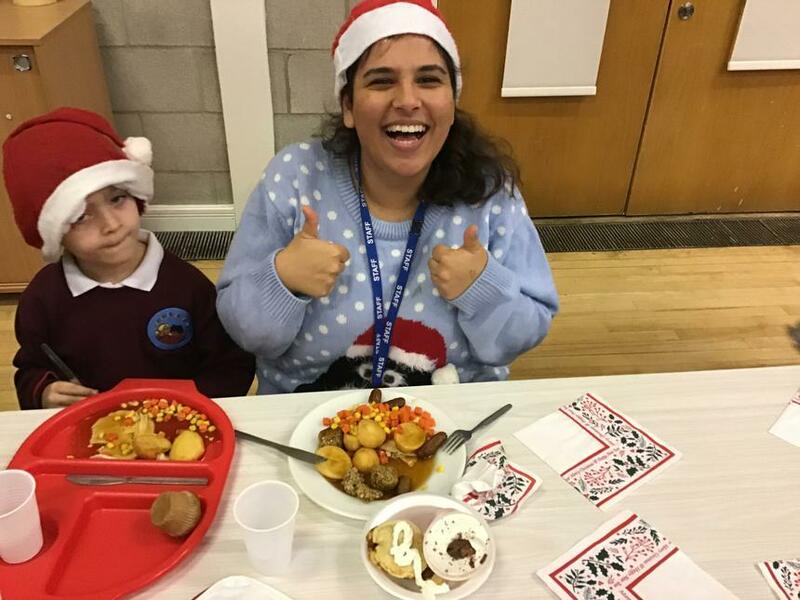 A big thank you to Cardinal Road FRIENDS who paid for this fantastic event with proceeds from all the fund raising efforts this year; we all had a lovely time! 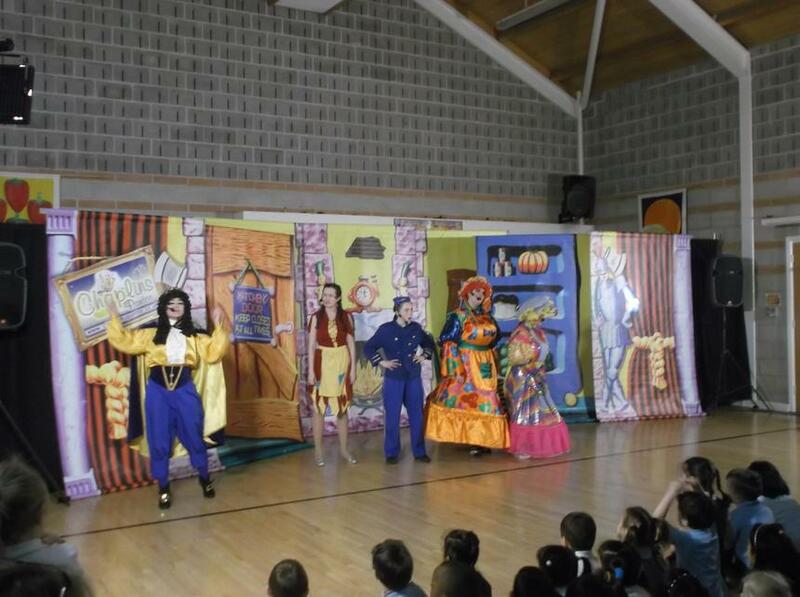 Amazing set and lighting, let the show begin! 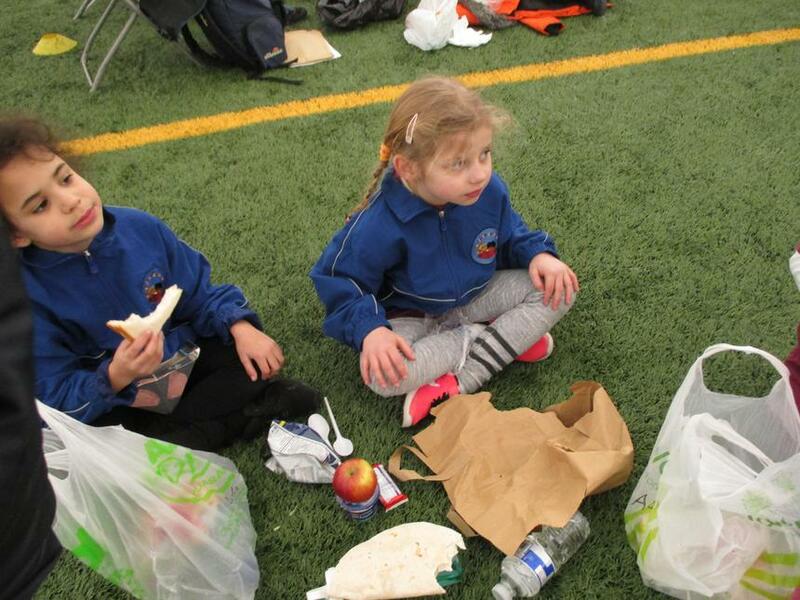 Little Princess Sophie with her doll Emily. 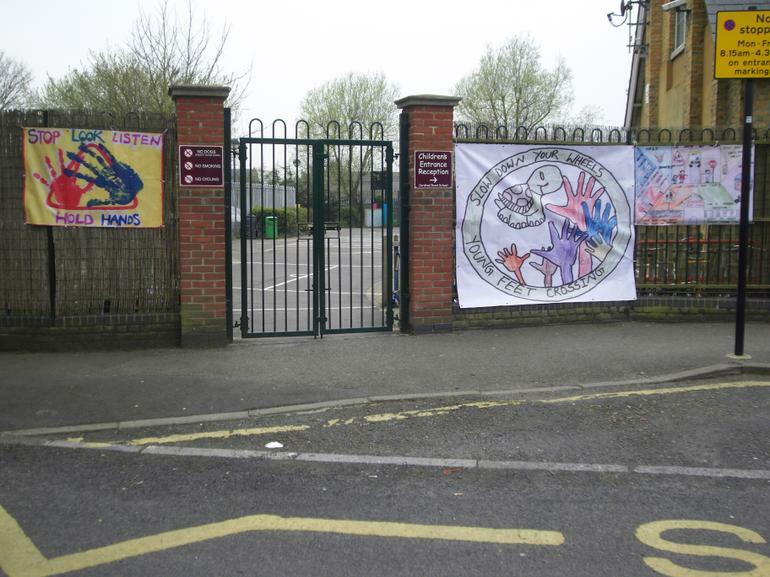 Arriving at Miss Minchin's School. 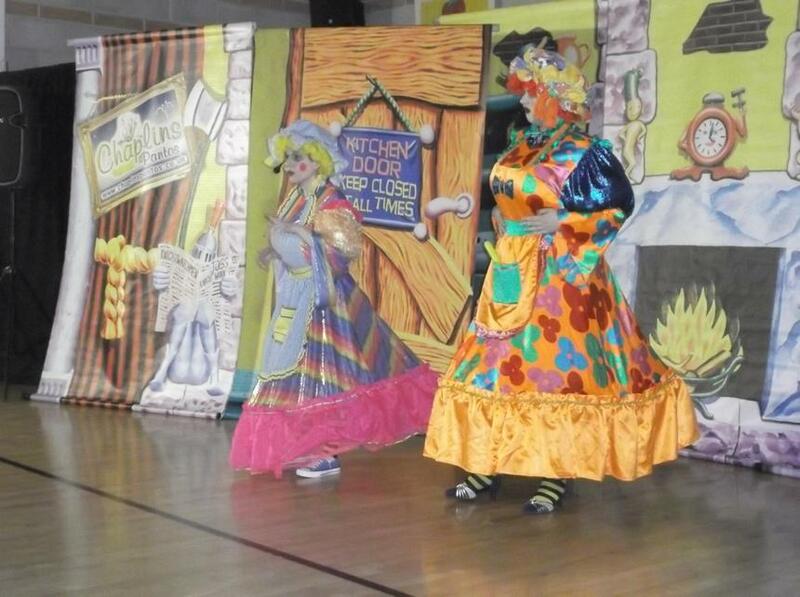 Lots of chances to boo, cheer, clap and sing! 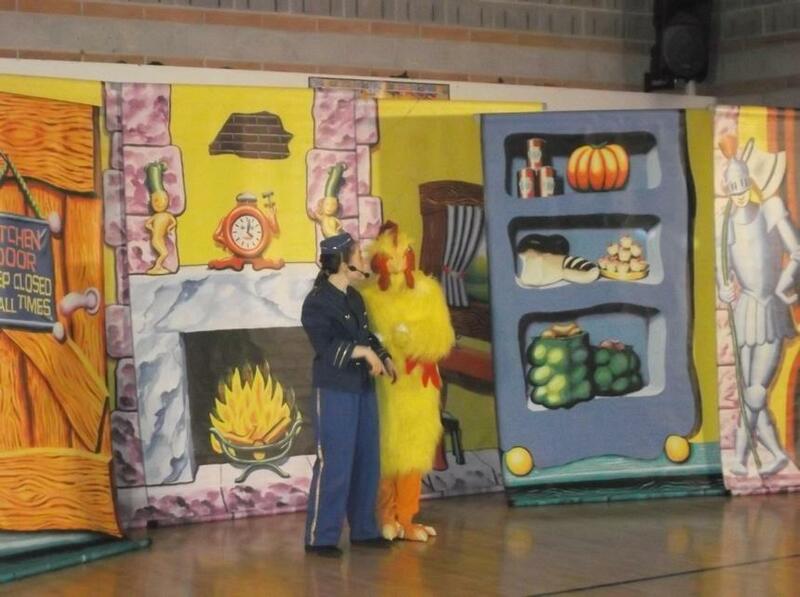 Wonderful backgrounds illustrated the story. 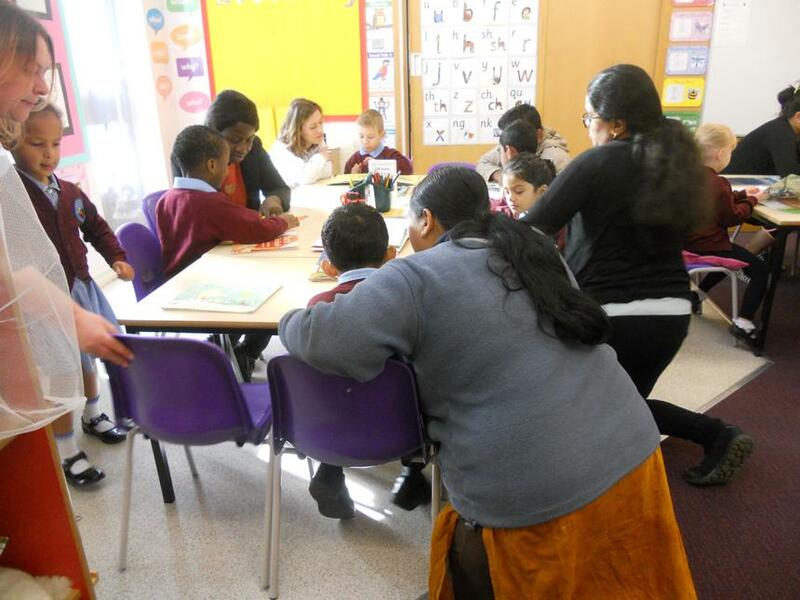 The French teacher charming the Headmistress. 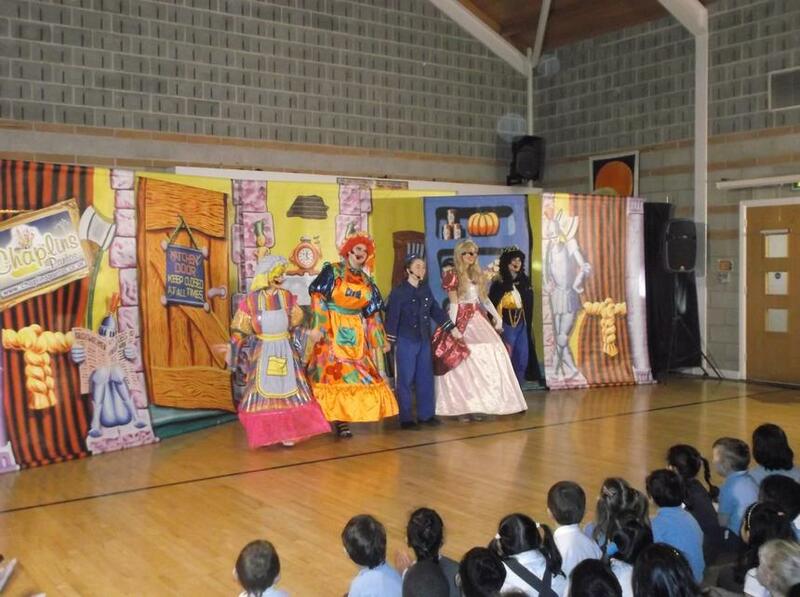 A sad part of the show has the children gripped. 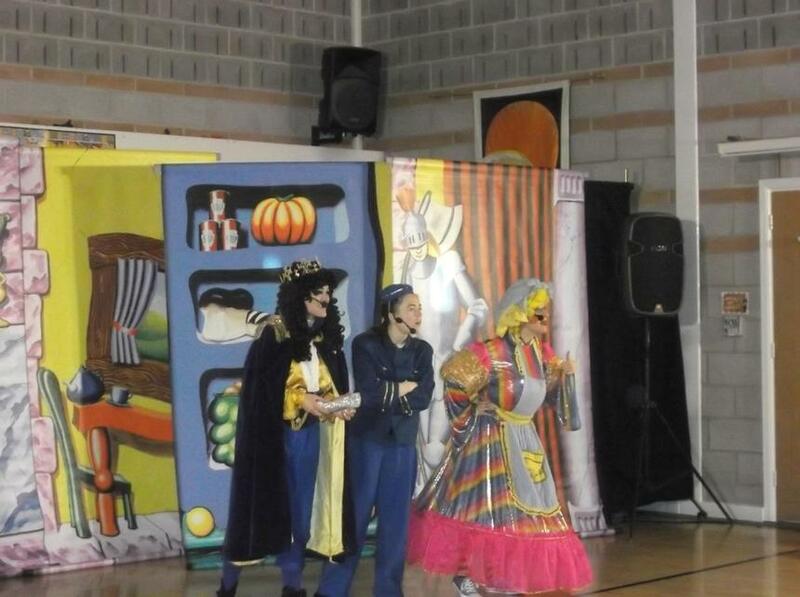 The audience joins in to support poor Sophie. 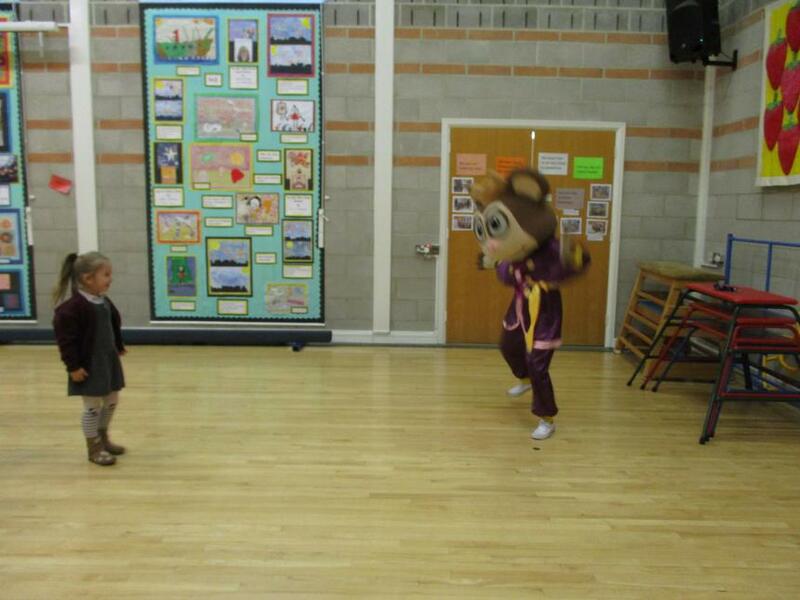 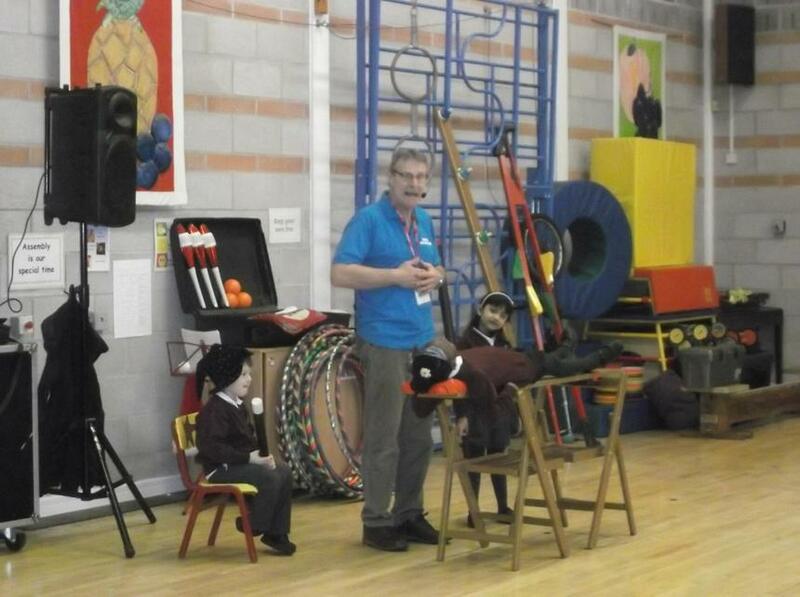 Mr Ramdas as the magic monkey character. 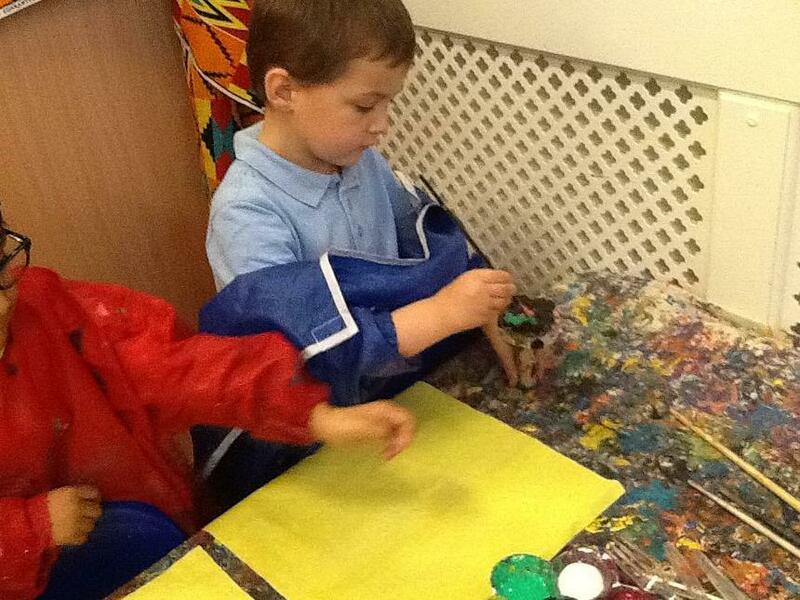 Reception children sprinkle some magic dust. 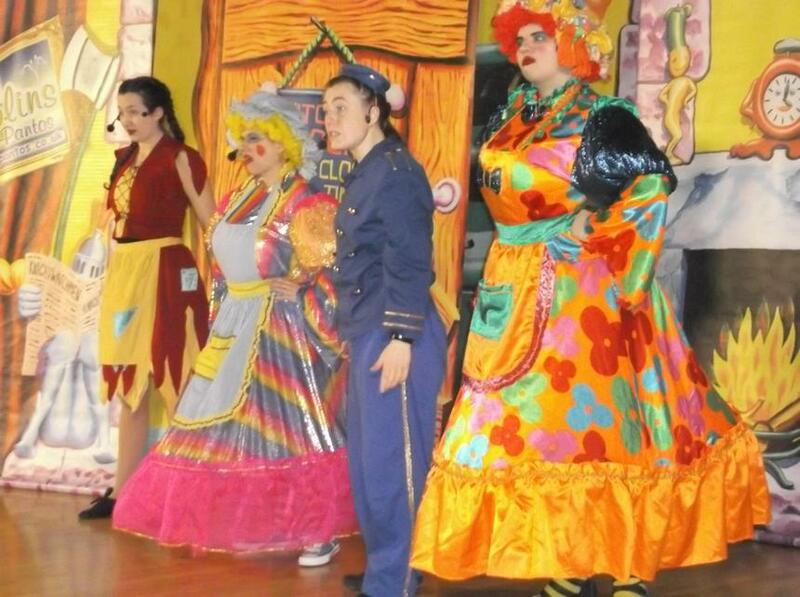 A happy ending as Sophie's father returns. 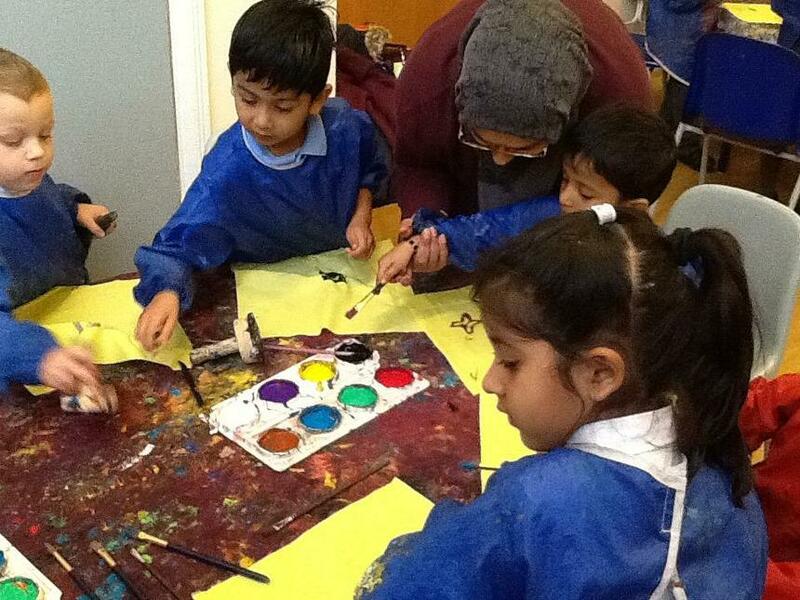 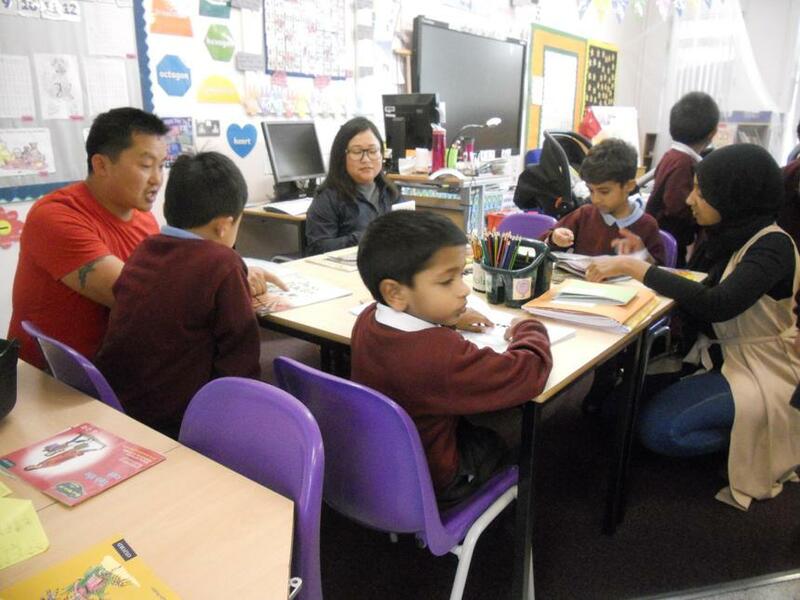 We invited Mrs Fu to run Animal Fu workshops for each class in Reception, Year 1 and Year 2. 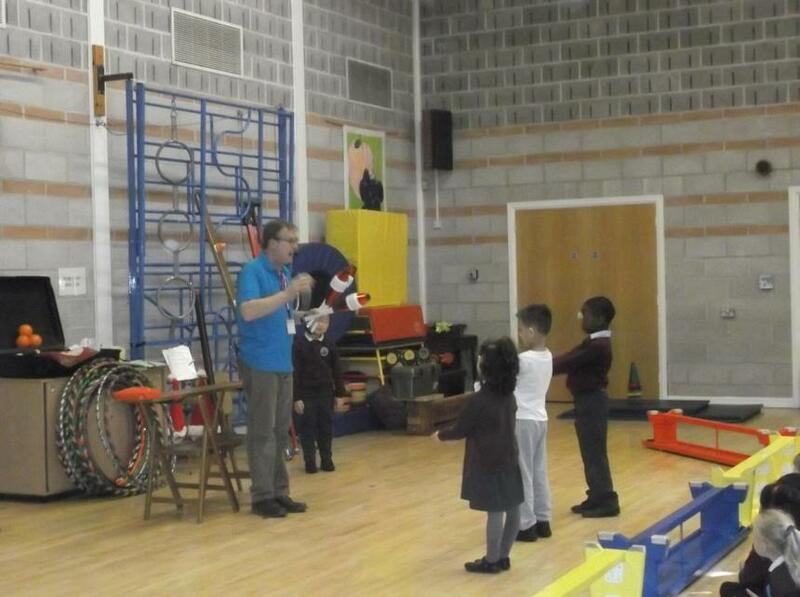 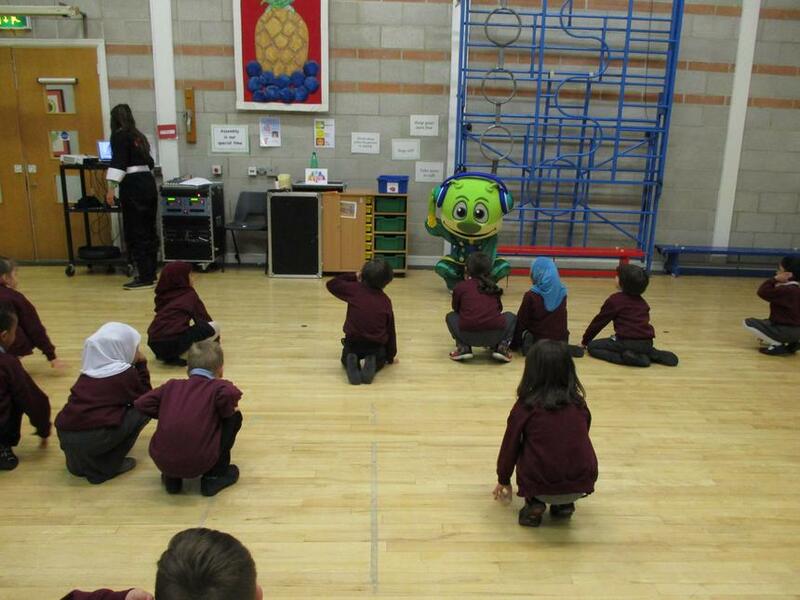 We had lots of fun and learnt about how to keep our bodies healthy. 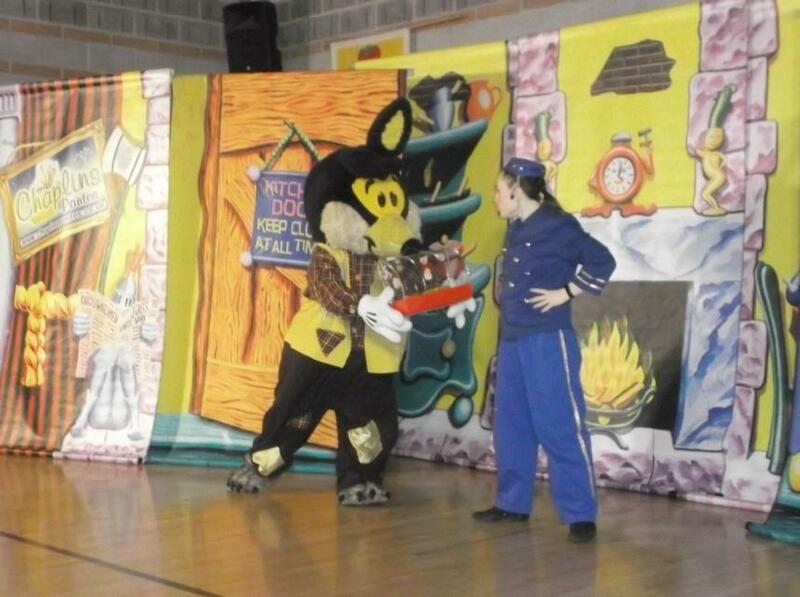 Look at the photos to see the characters we met. 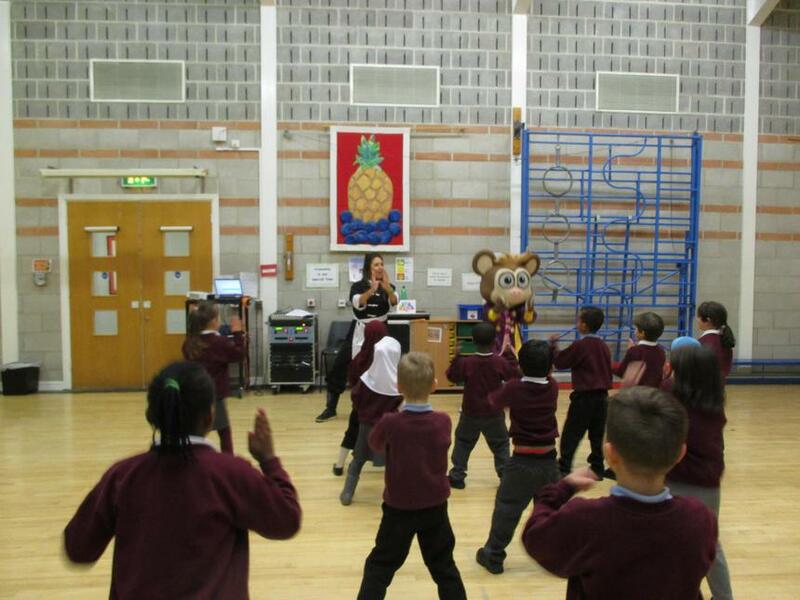 Can you spot Mabu the Monkey and DJ Fin? 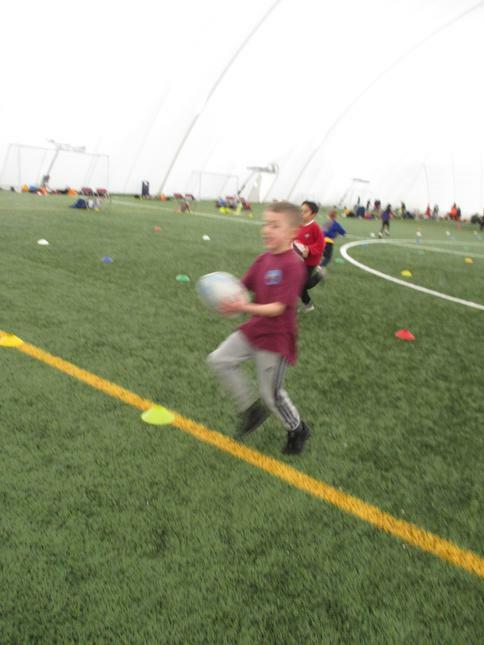 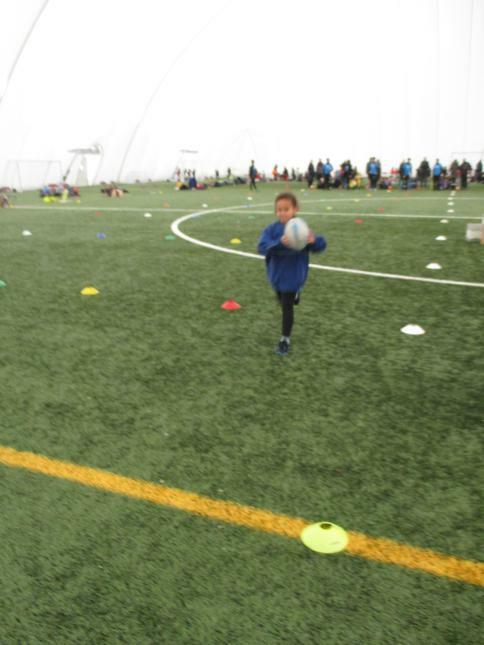 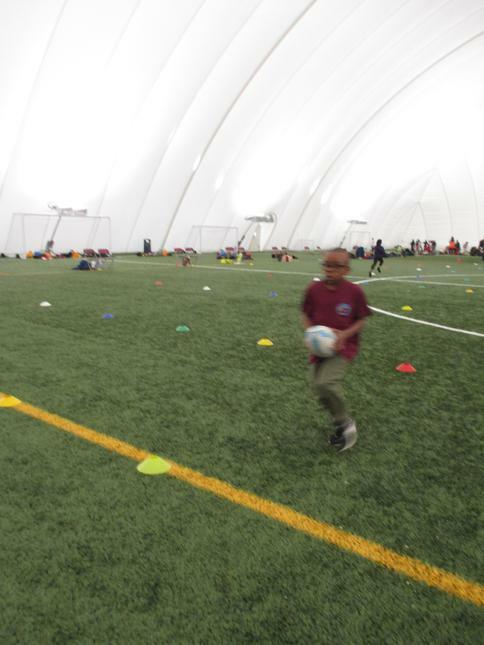 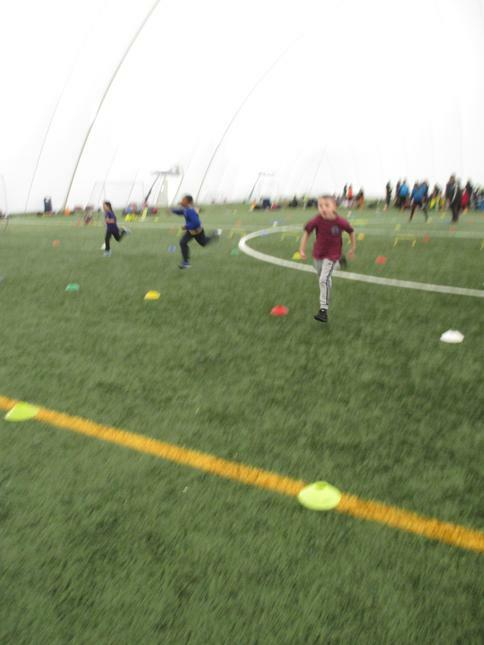 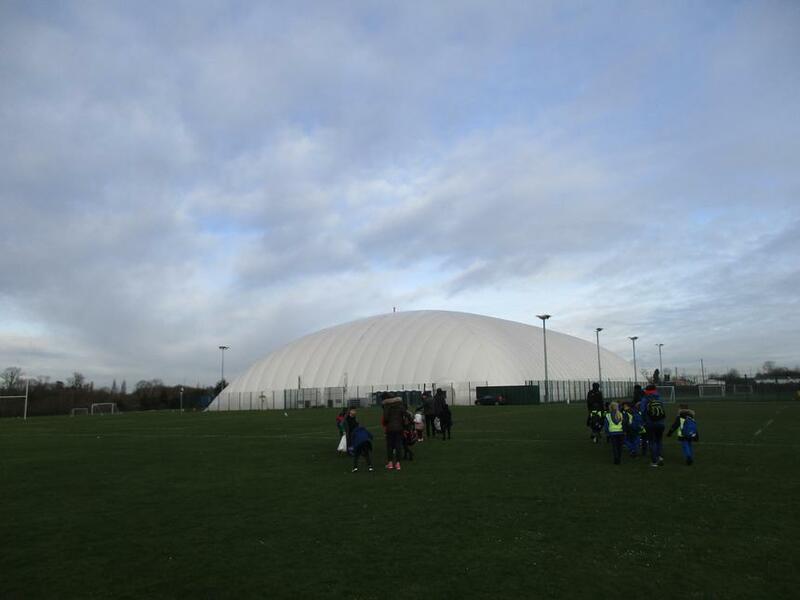 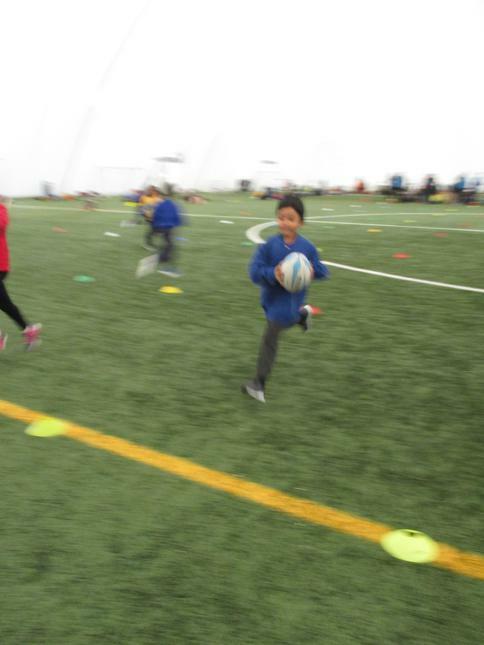 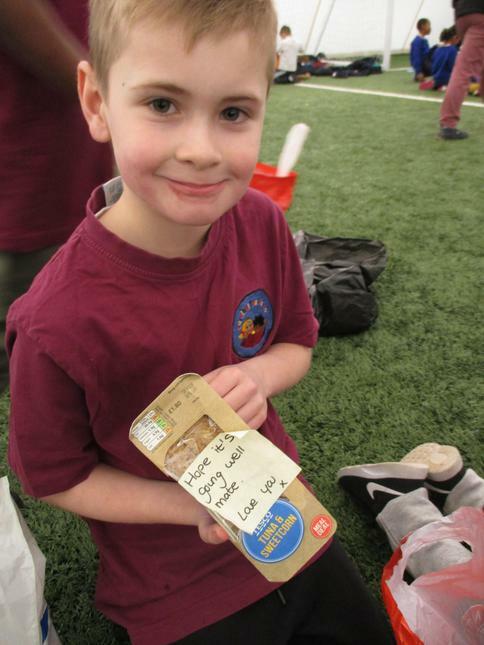 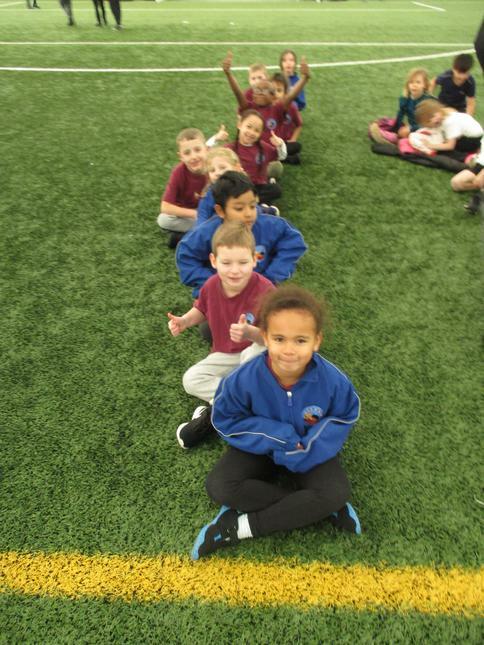 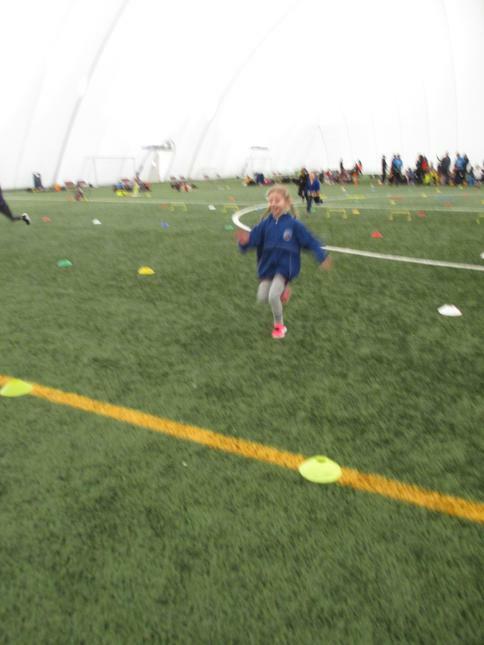 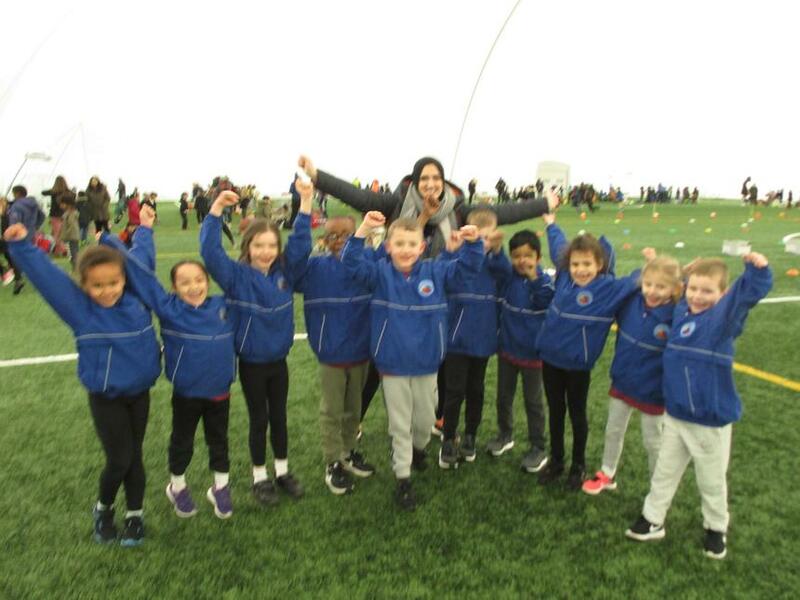 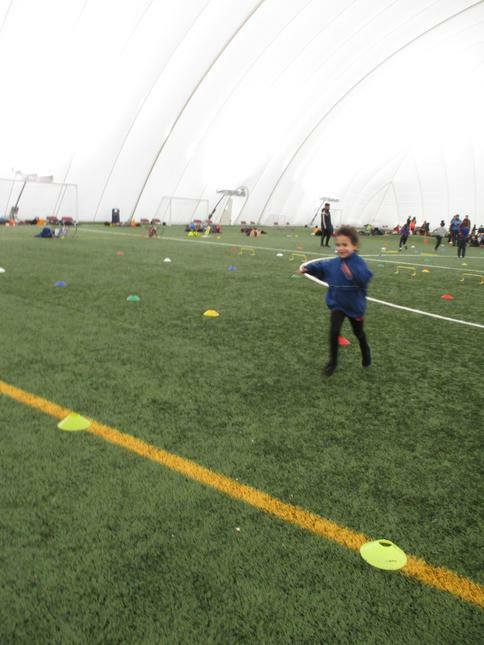 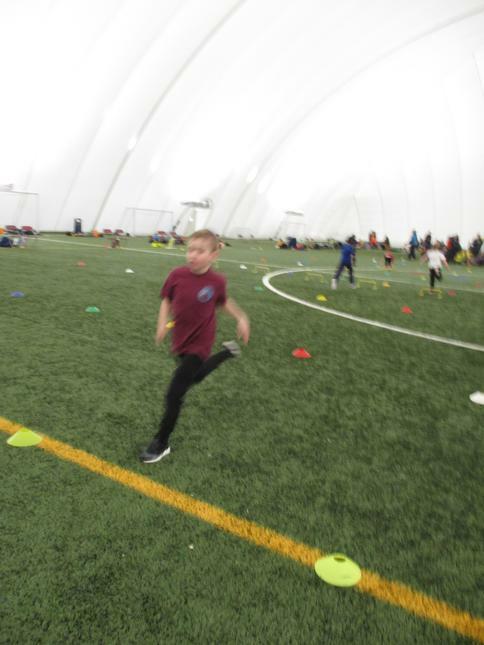 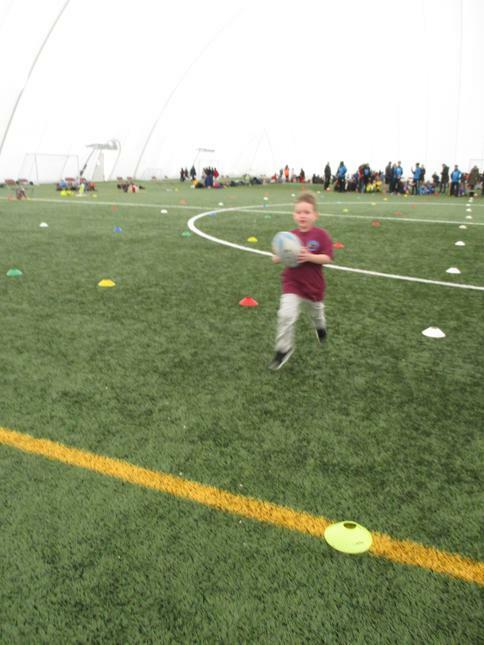 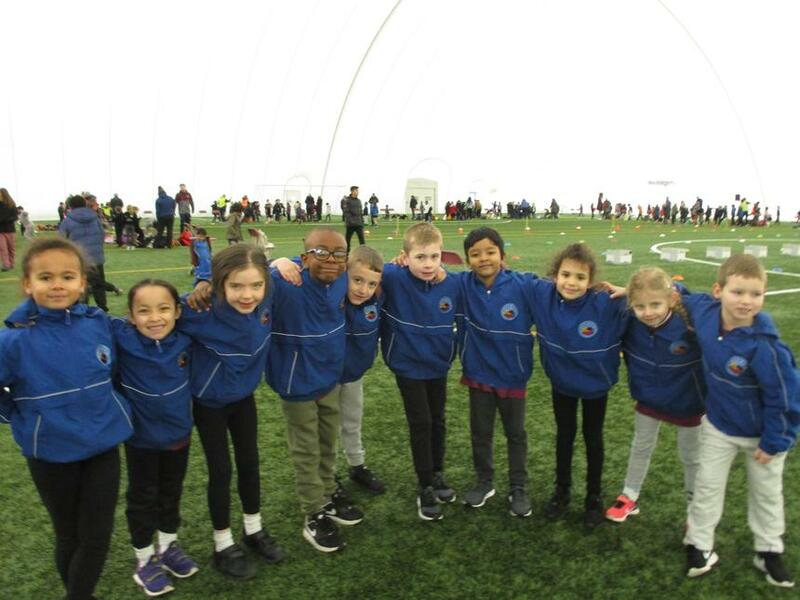 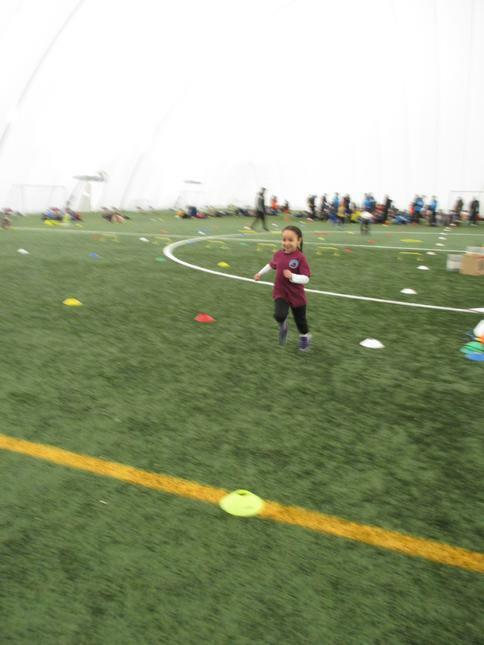 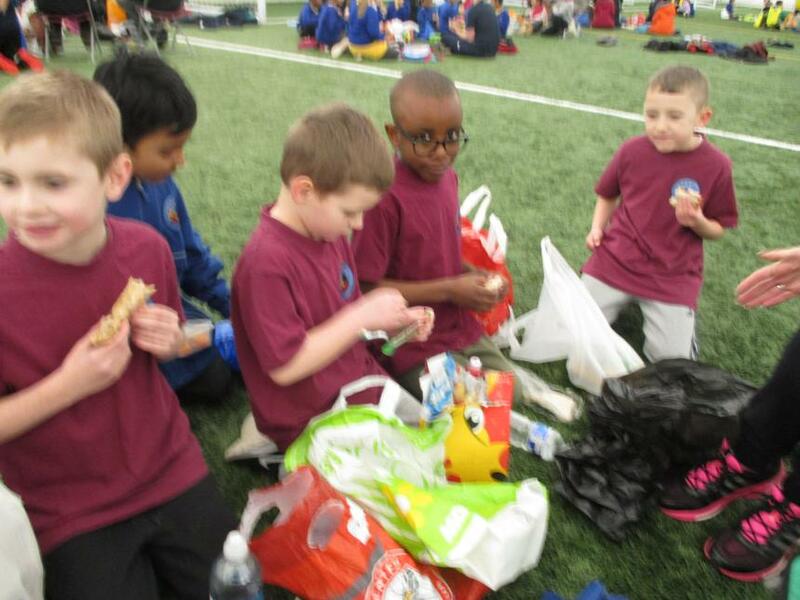 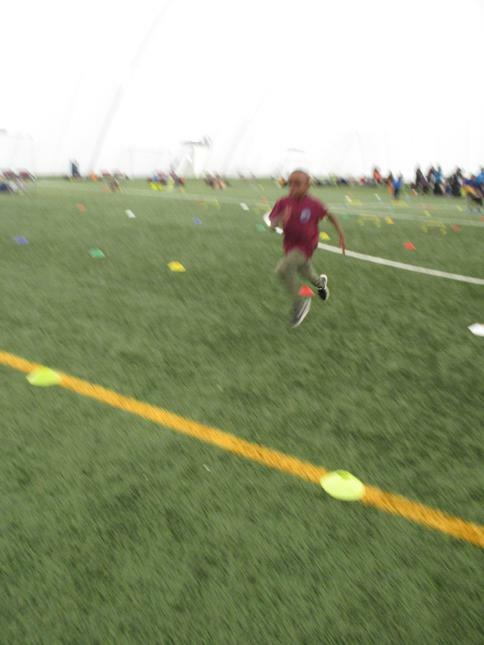 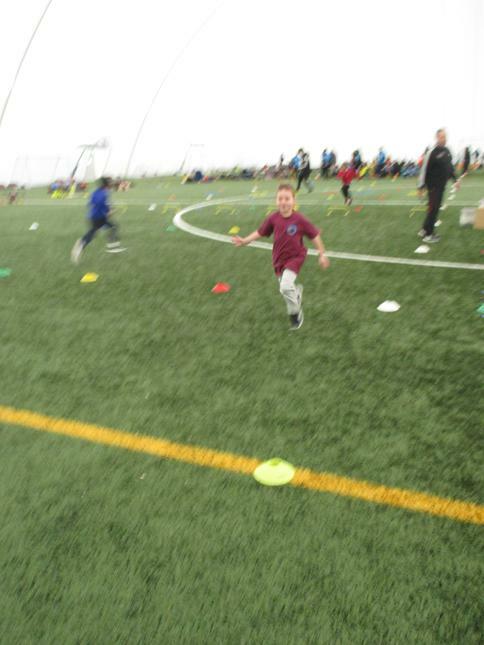 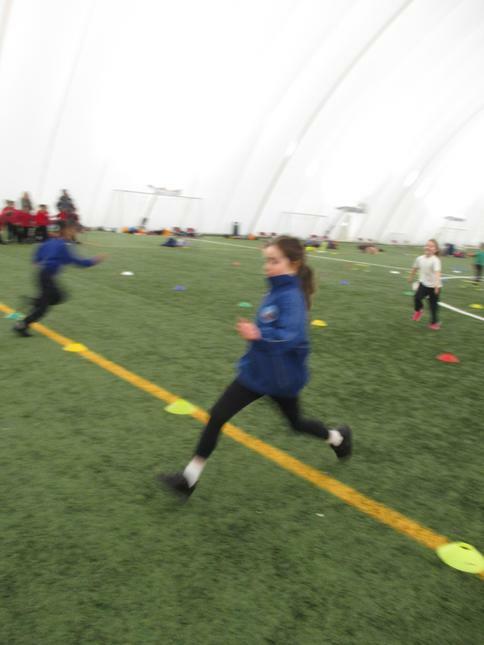 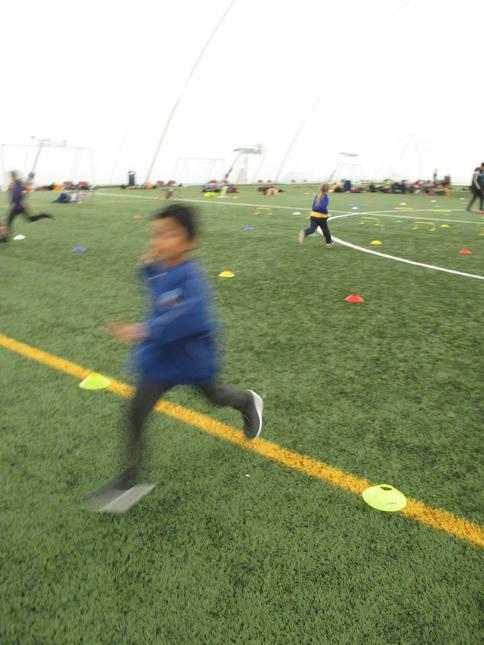 10 Year 2 pupils were invited to a borough Sports Day against many other schools in Hounslow at Cranford Community College. 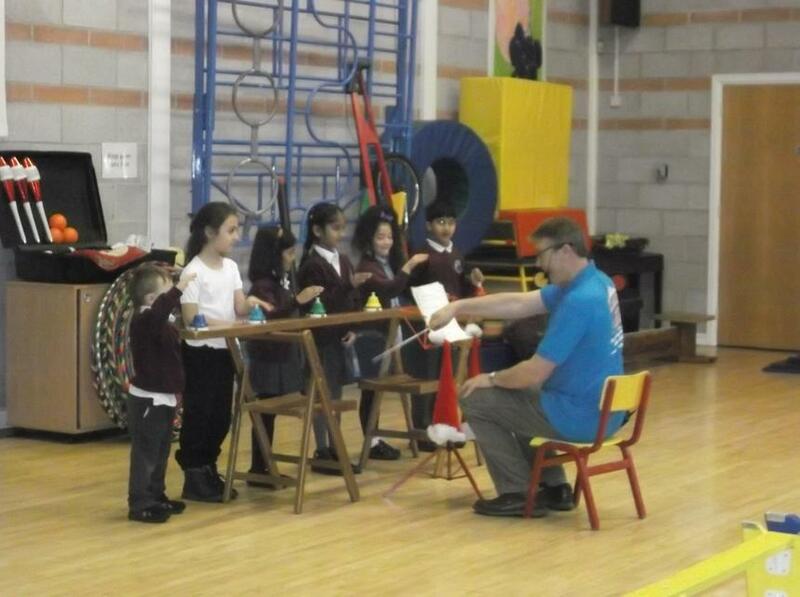 We took part in 6 different events throughout the day. 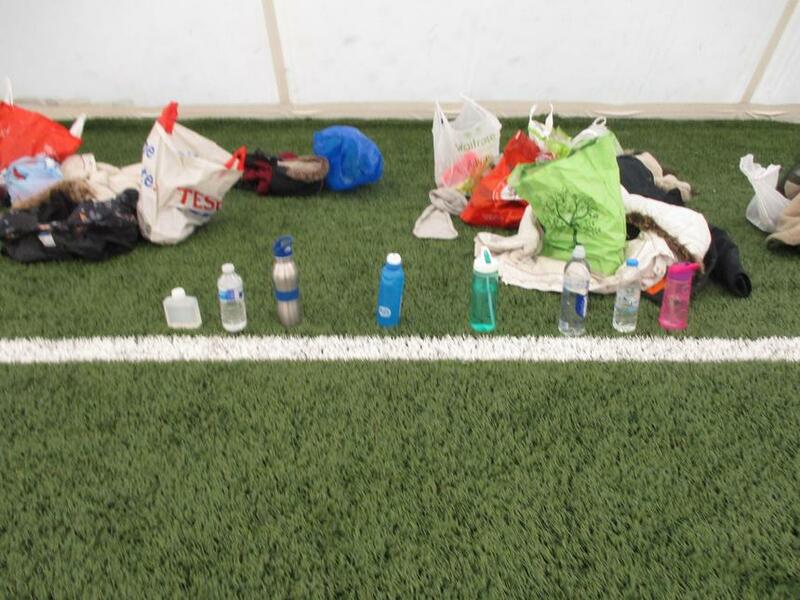 We were in Lane 6, had our own zone to warm up and keep our belongings. 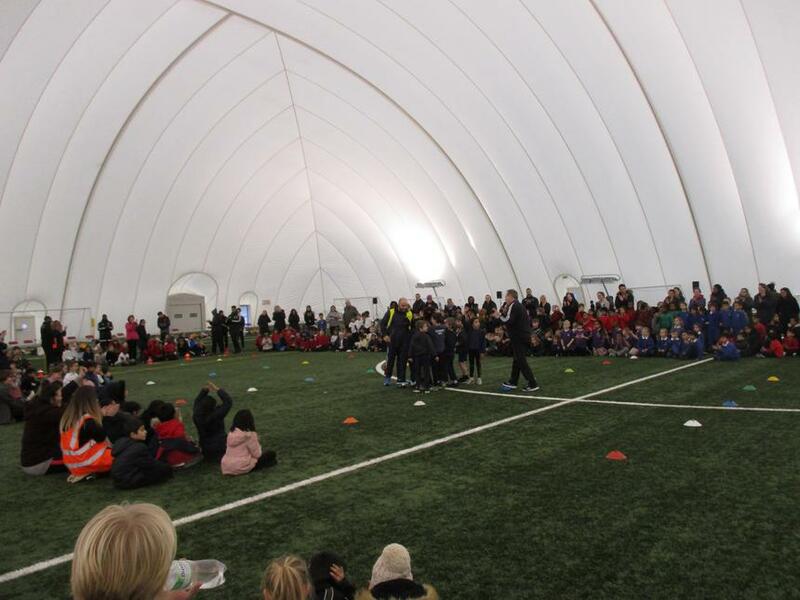 The dome was huge and we loved every minute of our day. 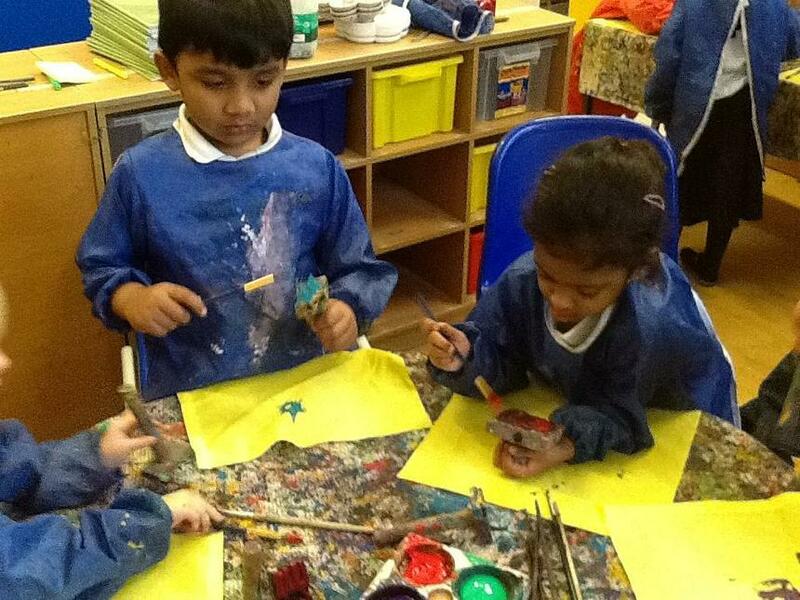 We did our best and were really proud of our achievements. 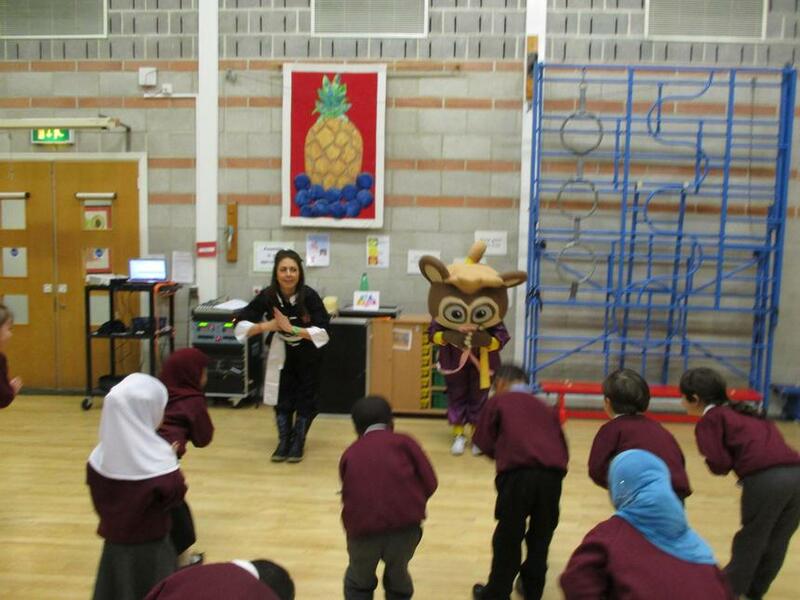 We all received a special certificate of participation from Mrs Nowak during our whole school assembly. 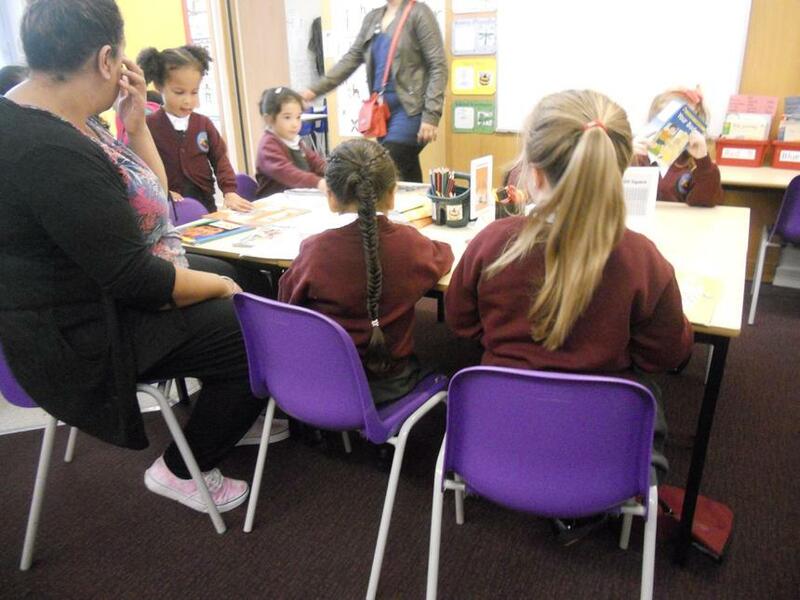 Why not come and share a book with your child during Reading Morning. 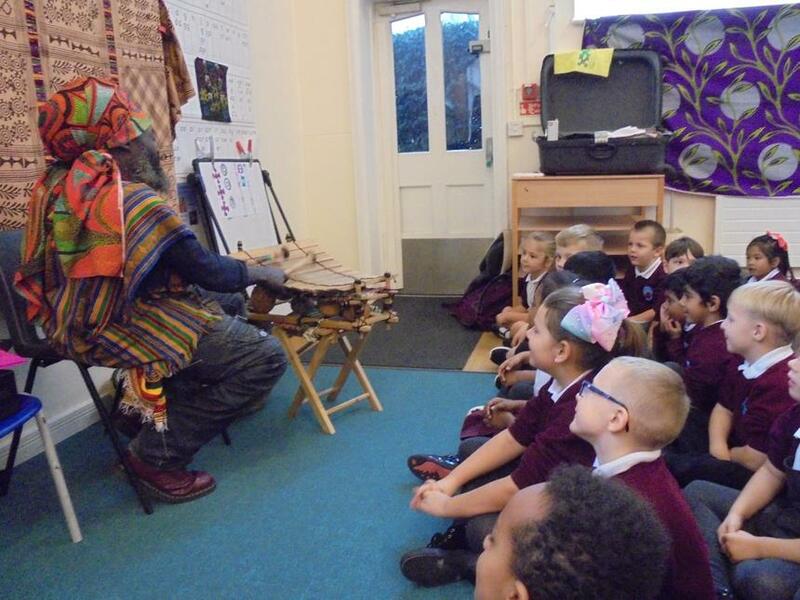 For more information please see the class Teacher. 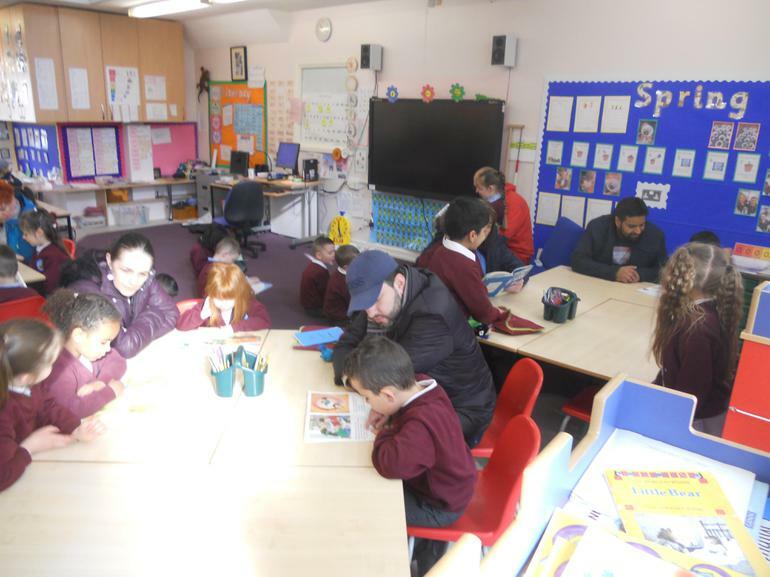 During our Learning to Respect Week, some members of the local community Police visited our school to give out information to Parents regarding the Borough's Learning to Respect Programme.